When I was a kid, I knew of Ayers Rock. A sleeping, red, ominous giant. A pimple in the middle of the Australian outback. You’d think there wasn’t such a thing as a good pimple, of course, especially not a bright red one that stands out for miles around and brings people from everywhere to come stare at it. However, this isn’t a blemish for teenage boys to worry about. 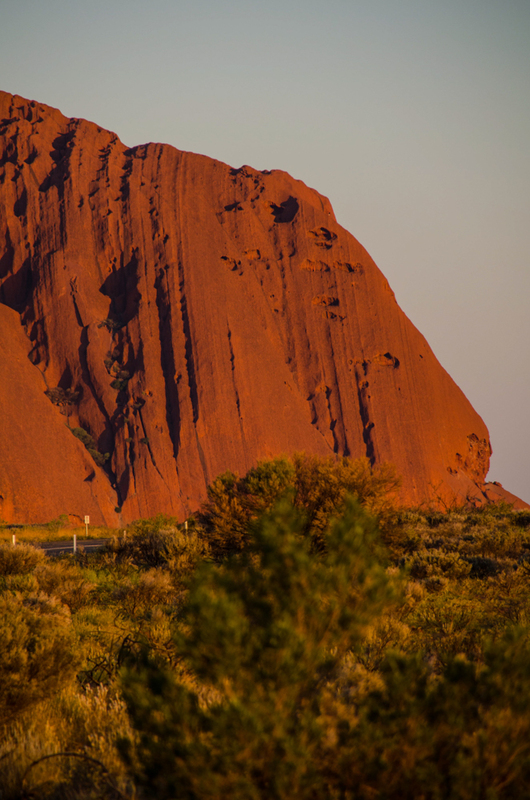 This red lump is celebrated across Australia, famous globally, and the oxidation of its minerals is what gives it such a fiery hue. 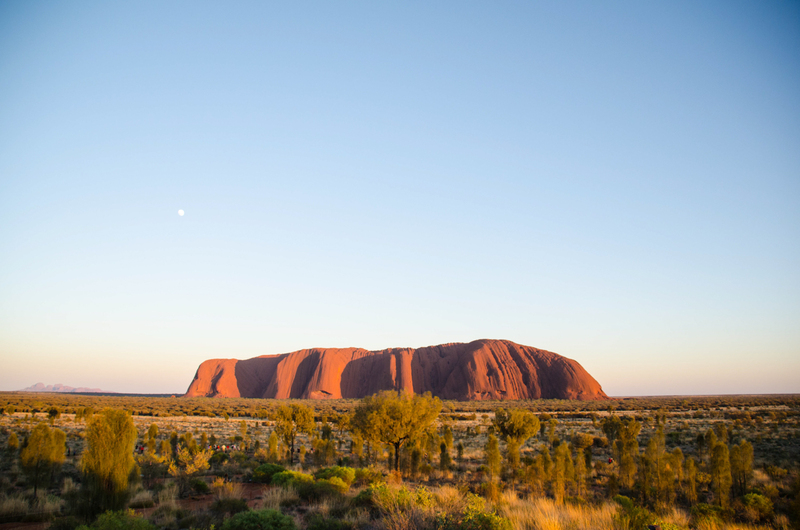 Nowadays what the world knew as Ayers Rock is officially called by its traditional name, Uluru – although both names are used, depending on who you speak to. Adventurous Kate and I were staying at the Outback Pioneer on Ayers Rock Resort, courtesy of Northern Territory Tourism and Flight Centre who were supporting this leg of the SOTM World Tour. 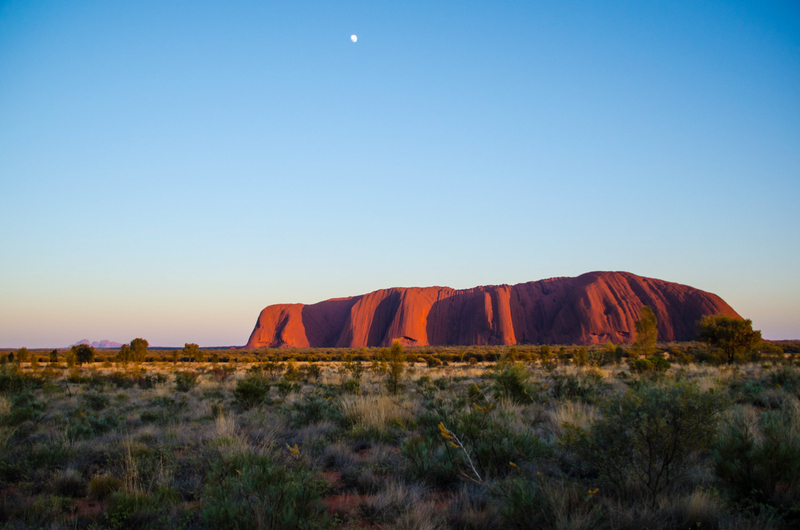 The stars of the show around here are Uluru itself and Kata Tjuta – formerly known as the Olgas. You can see both in the top image, with Kata Tjuta in the background – more of those later. Let’s talk about Uluru. 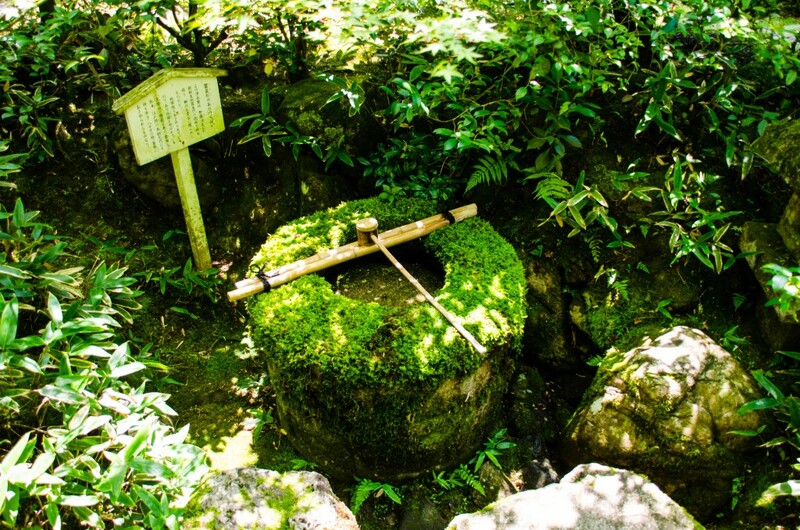 Despite it being a big stone, it fascinates. If nature is poetry, Uluru is the chorus that you belt out loudly, even if you can’t sing, because those words really mean something to you. Uluru is a shapeshifter. It looks quite different at various times of the day. You think “Well, I’m not going to be hypnotised by a rock.” But you are. You can’t take your eyes off it, and its palpable shifts of colour make the thing seem like it’s more alive than you are. The above shot was taken a little after sunrise – and that hour, plus sunset, is really when the rock is at its best. This one was was taken shortly before the sun had given into the snooze button. And this one was taken after the sun started to get a grip and was rising steadily. And this was shot as the sun set one evening. See how different it can look? 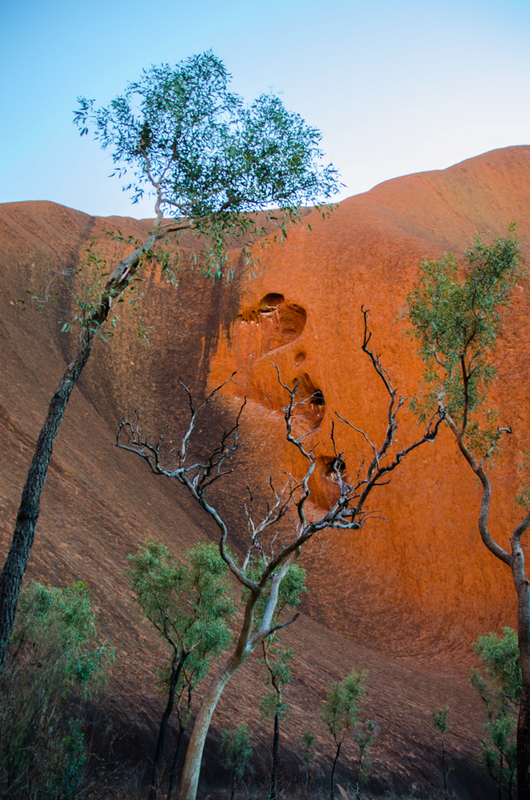 The more you stare at Uluru, the more you notice its texture and shapes. This lion’s head was pointed out to me. Here I am with a much-needed cup of coffee on one of the occasions that I got up before the sun did, just for that lump of rock. I’m not a morning person, and have to get up around 4.45am regularly when I’m working shifts at the BBC, so I usually begrudge having to arise at ungodly hours when it’s not for employment purposes. But I’m really glad I did. 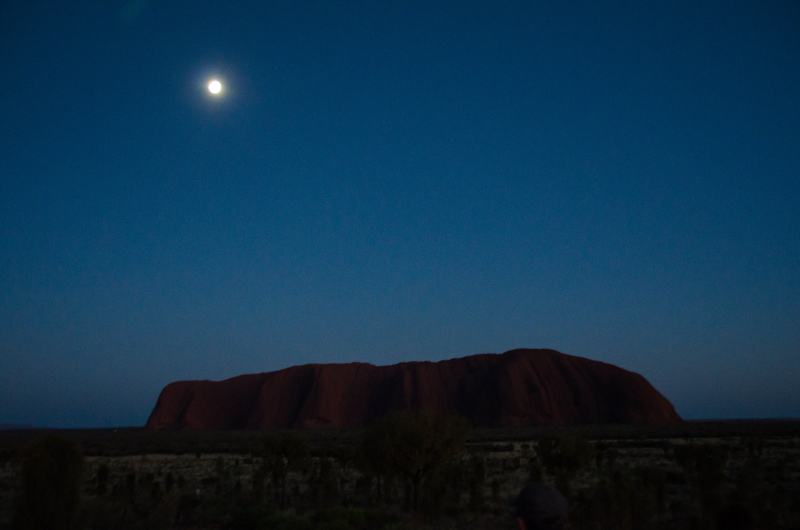 Seeing the sun rise over Uluru is a surprisingly unforgettable experience. It is, after all, just a rock. But when it’s right in front of you, it seems a whole lot more than that. 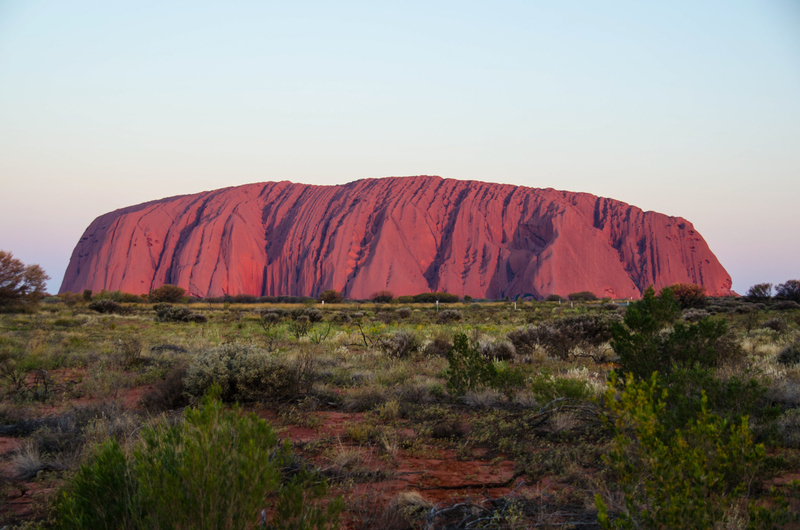 The Aborigines implore you not to climb Uluru, saying it is a sacred place and should not be clambered over. Looking at how steep it is, and taking into consideration that 40 people have died and around 100 others are suspected to have died shortly after descending through heart failure, makes you wonder why on earth anyone would want to attempt an ascent. And the descent looks like the really hard part of it. 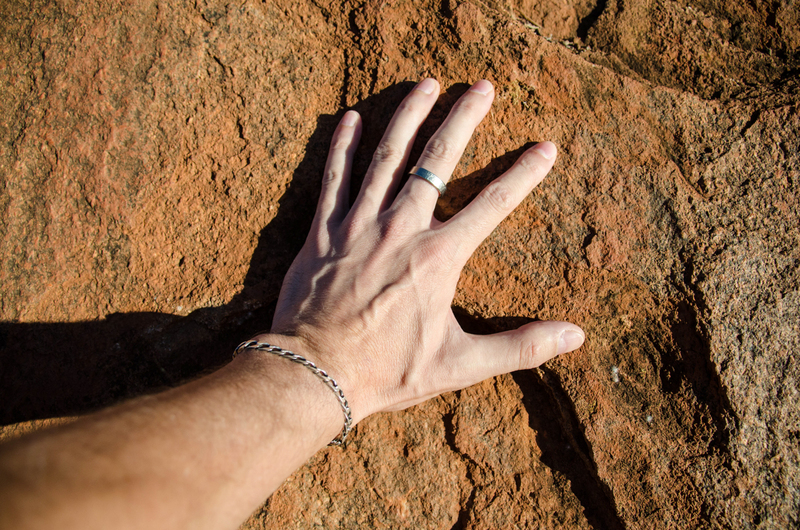 I was told a great story about the chain that goes up the first part of Uluru’s ascent path. Apparently a farm owner got the contract to put the single chain in, stretched between regular poles, for people to grip onto. He was told to make it thigh-height. He was apparently quite a short man, so in obeying instructions he made the chain much too low for those of average height, or above, to hold onto as they haul themselves up the red, unforgiving rock. 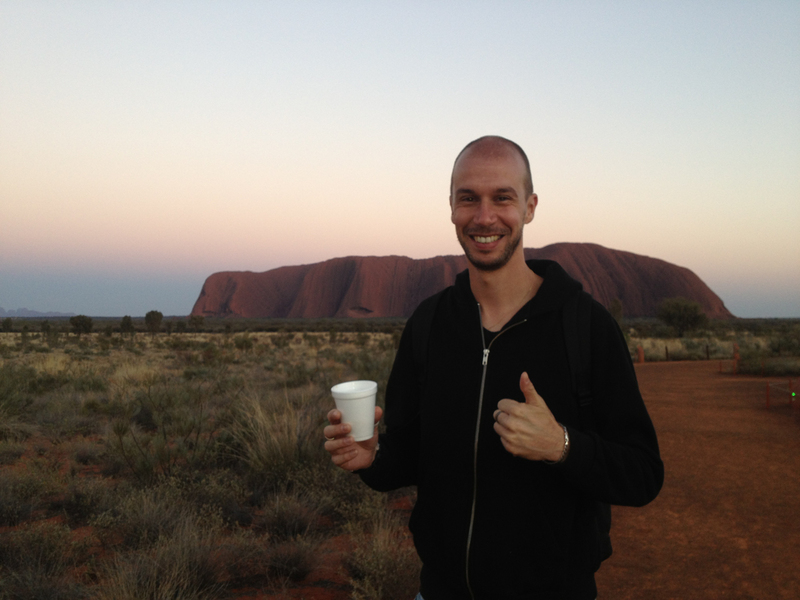 Our trip to Uluru, and later Kata Tjuta, was part of the two-day Uluru Explorer tour with AAT Kings. After worshipping from afar, we finally got up close and personal with Uluru, walking around part of its base and even being able to press flesh on that red rock. And when you’re so close, you can see all the detail that has enchanted the indigenous people for so many millennia. Stories have been created to complement the fissures and mineral stains on the stone, for example. 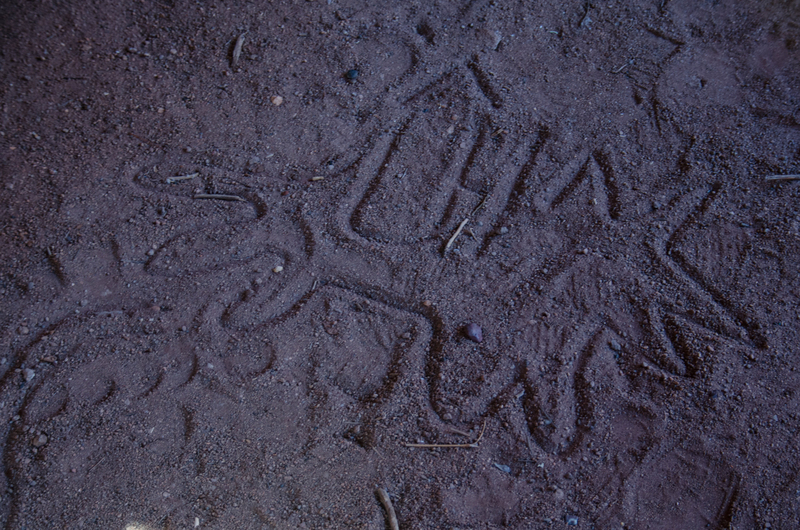 While there, we spotted some markings in the sand in a cave, drawn by local Aborigines. No-one could work out what it meant. Looks like a dingo to me. 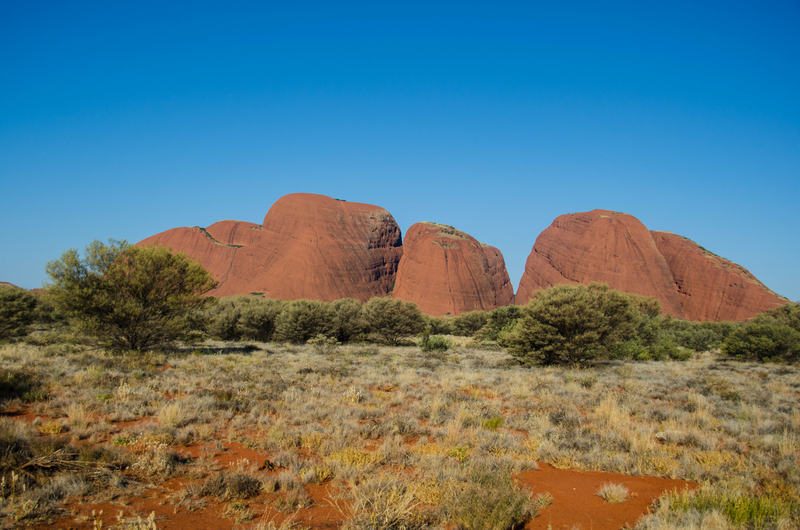 But if Uluru is the flashy redhead that everyone fawns over, Kata Tjuta is the cleverer, more voluptuous one. They were formed around the same time but it’s Uluru that grabbed the spotlight, sells the postcards, brings all the tourists in. Kata Tjuta is the girl next door, the one with plenty to offer but who needs more work to unlock her secrets. She doesn’t put out quite as easily as the popular red head next door. It too had a name change. 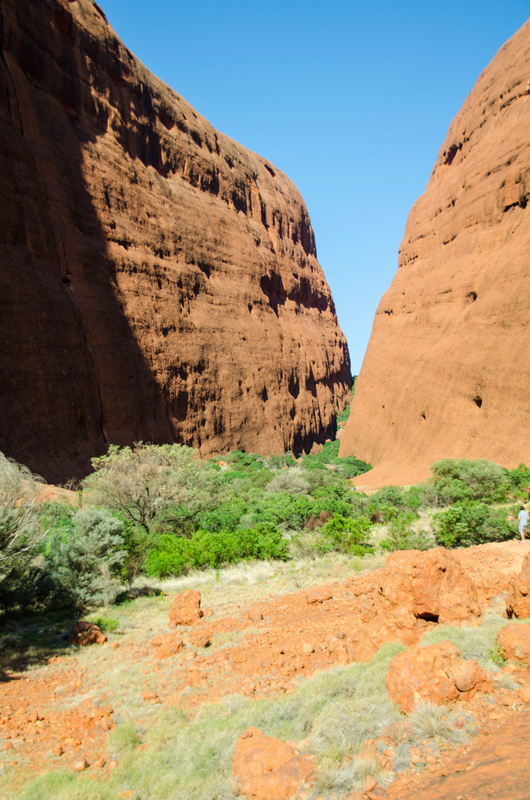 It used to be known as the Olgas, a suitably exotic-sounding name for its red, rounded peaks. It has, in some ways, more to offer. It opens itself up invitingly, like a familiar lover, as you walk over the Mars-like surface of Walpa Gorge. Walking into this part of Kata Tjuta made me wonder what on earth it was like for the indigenous tribes who came here before the modern world ever presented itself to them so crudely. Also the first explorers who found this place – looking up at the red walls, we were seeing much of what they saw back then. It was a thrilling time for me, to be treading the same paths as they did. Speaking of which, some of Kata Tjuta’s peaks have green trails on them. This is because people used to climb these rocks too, and brought seeds on their boots. While the people have long been banished from clinging to the slopes, Mother Nature hasn’t relinquished her opportunity to spread a little more greenery around. Aside from all this expeditionary stuff, there was some good old-fashioned pampering going on. 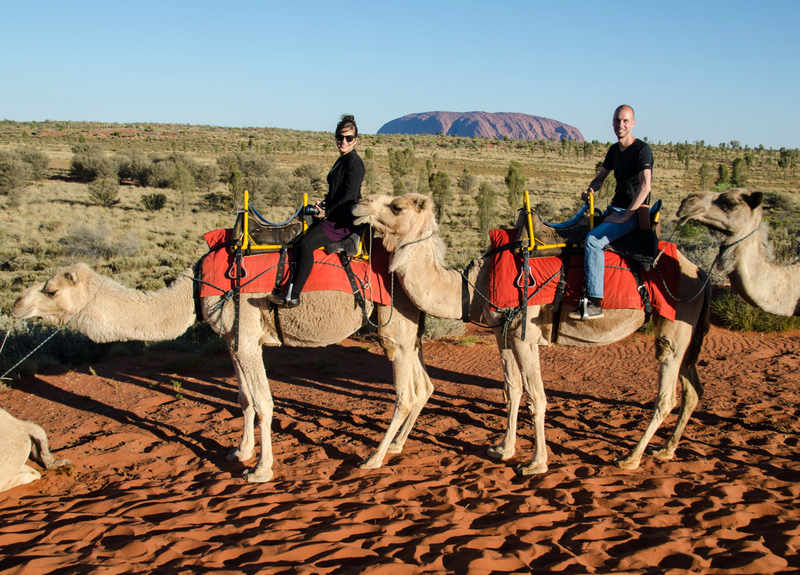 Kate and I had a great ride out into the desert just before sunset, thanks to Uluru Camel Tours. I was riding Meryl, a cute and impeccably behaved camel. 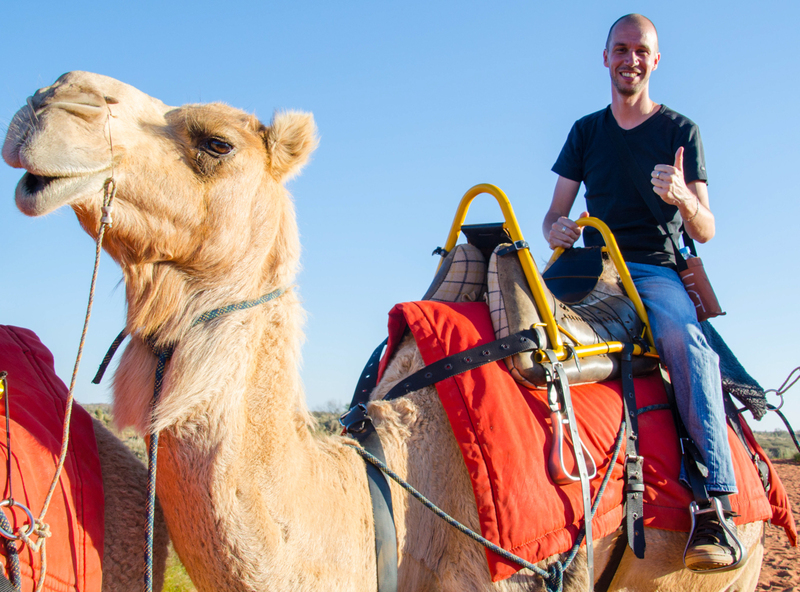 The seats are fashioned to each individual camel so they make for a very comfortable ride, even for someone with cheeks as skinny as mine. Kate was on Rex, and it was a lot of fun getting out to our desert destination that way. Once I’d bid a fond farewell to Meryl and scratched her behind the ears a bit (take my tip, fellas – the ladies love that) Kate and I had a wonderful evening at the Sounds of Silence dinner. This saw us and a large number of others all sitting at round tables, enjoying tasty food and lots of Aussie banter. Then a hush descended on the assembled and suddenly a chap in a hooded cloak, an astronomer, started talking about the various constellations and individual stars which dazzled above us. The cloak was naturally just for effect, but I must admit is was pretty cool. If cloaks came back into fashion, I’d be all over that. I have never seen the night sky look like it has done in the Northern Territory. You can forget all sense of time with all the glittering. Our planetary guide pointed out various star sign constellations including Sagittarius, which was quite moving for me as it’s mine and I’ve never seen it before. I don’t really believe in astrology, but the individual characteristics of my star sign often describe my behaviour and attitude, so I do find that aspect interesting. Another moving moment was when the astronomer, using a hugely powerful green laser pointer, wobbled it around a sparkling dot. We were looking at a star’s light which dated from the time that the first settlers were building New Amsterdam – which later became New York, my favourite city in the world. The photography around both Uluru and Kata Tjuta is severely restricted. We had to submit our photographs for approval before we could use them on any social media. Any that showed parts of the rocks at certain times of day, when details such as some caves are in focus, were rejected. Therefore it was a little tricky to get some SOTMs there, but I did manage a couple, including this one. Click on the image to see what it’s all about. And the excellent Danny, who was on our table at the Sounds of Silence dinner, kindly also thought of something memorable he’d once read on a wall. There was one more early start for Kate and I, but again it was totally worth it. We each sat on the back of a Harley Davidson provided by Uluru Cycles. 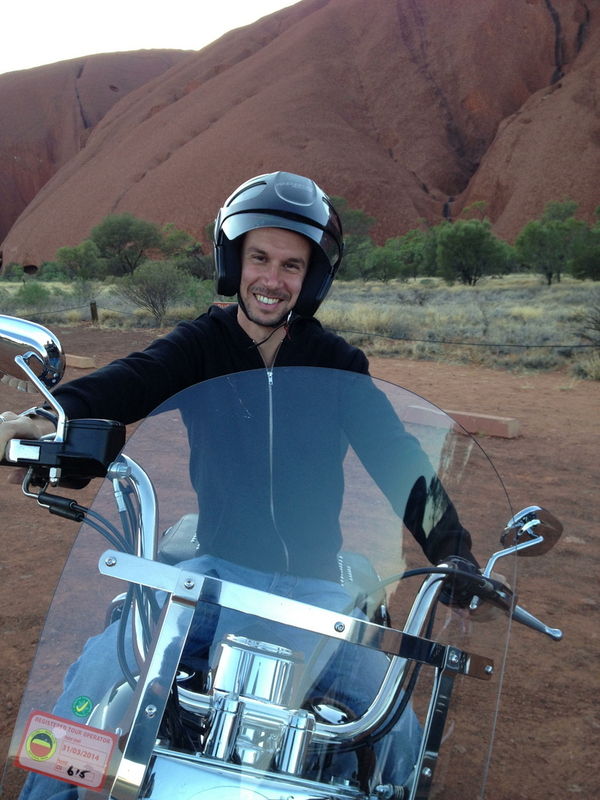 We then rode to Uluru, saw another sunrise and toured around the rock in the chill of early morning. A brilliant experience. Despite this pic, I didn’t control the beast myself. But I watched a lot of CHiPs when I was a kid, so like to think I styled it out pretty well. After that bike ride, it was time to hit the road again – this time even further south, to check out Sydney and Melbourne. More on that next time. Australia. It’s big, it’s far away and it’s inspired one of the best songs of all time. 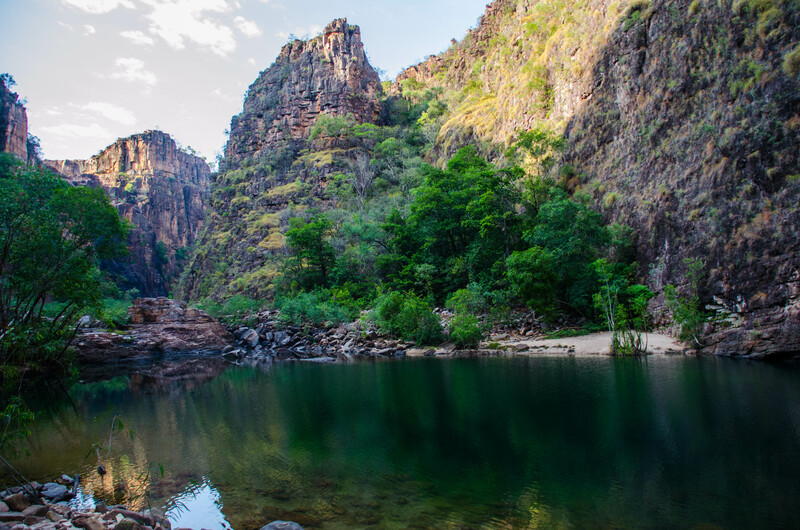 For our trip to see this beautiful land for ourselves, Kate and I were kindly hosted by Northern Territory Tourism, and as part of that Flight Centre invited us on Adventure Tours Australia‘s 3D 4WD Kakadu Unleashed tour in the Northern Territory itself. 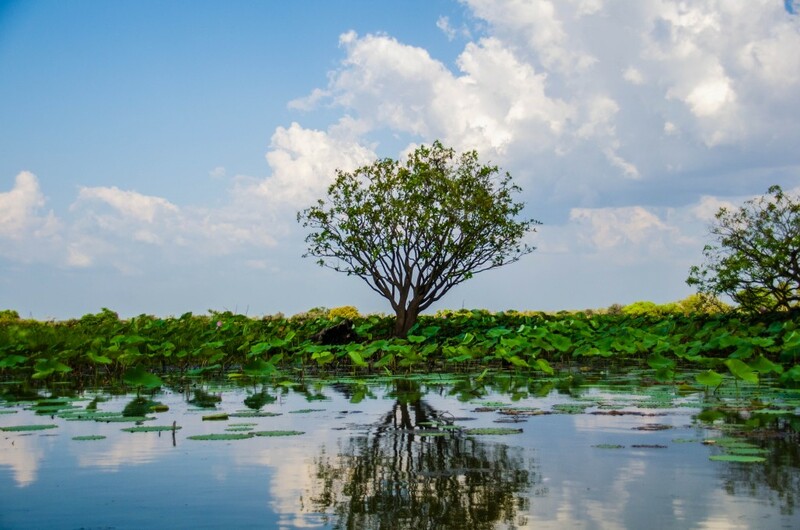 After a quick stopover in Darwin, with just enough time to go on a bus tour around the place and listen to the commentary of how much of the beautiful coastline was either frequented by crocodiles or deadly jellyfish, we were off on our trip along with about a dozen other intrepid adventurers. 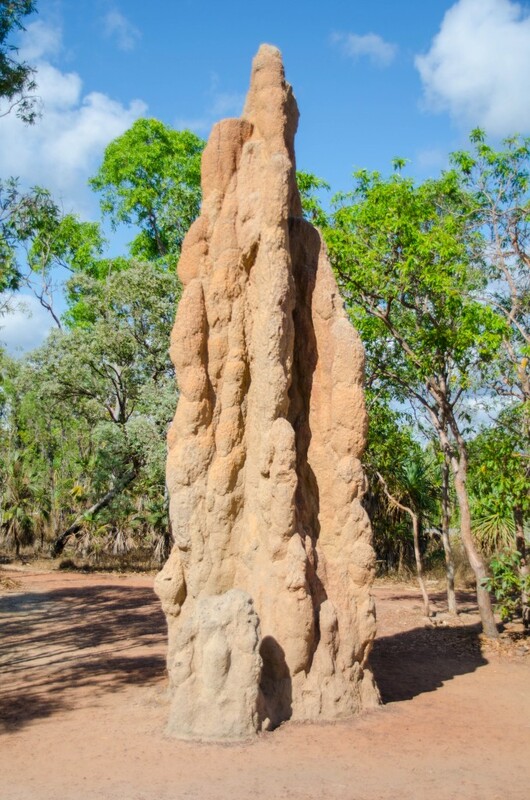 The first day of the tour was spent in Litchfield National Park where you couldn’t help but notice these incredible termite mounds. The engineering behind them is incredible and some of the taller ones are decades old. Yet another reminder that Mother Nature really knows what she’s doing. It was very hot at the time of our visit, so many of the group jumped into the large rock pools to cool off. I’m a very poor swimmer and as a result never go into deep water so I had to sweat that part out by the side. Later on we hit a campsite for my first experience of kipping outdoors. I do mean literally, as we were only given swags to sleep in, which are large cocoon-type creations in which you lay under the stars. This does give you a superb view of the incredible night sky, with an unforgettable view of the stars, but it does leave you at the mercy of mosquitos. Factor in the incredible humidity and I barely slept a wink that night. 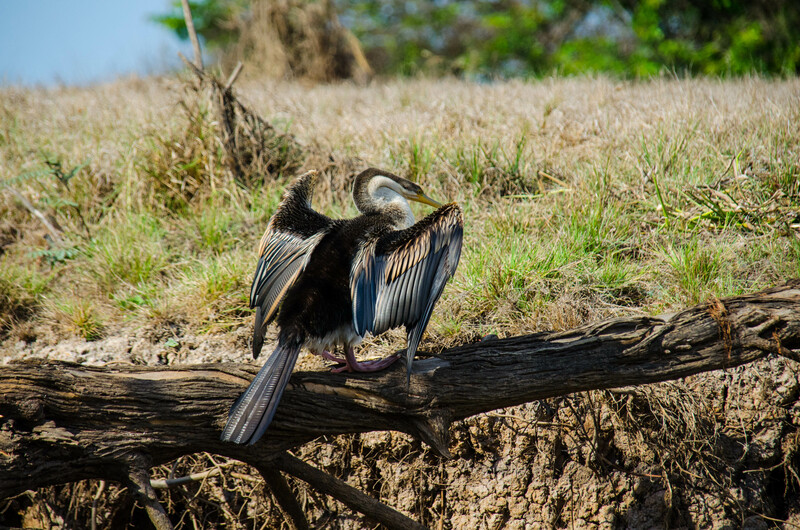 Luckily, I had perked up enough the next day for what turned out to be my favourite part of the trip – the Mary River Wetlands. 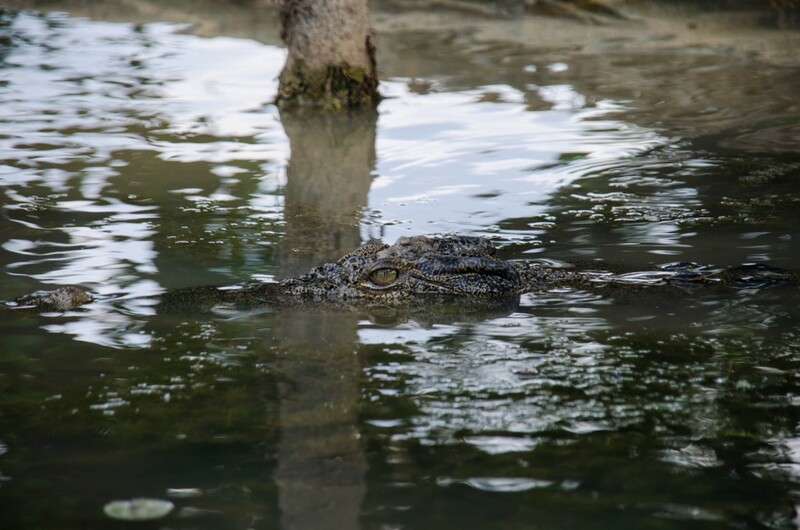 The guide gave me a chuckle at the start, as he casually asked us not to dangle any limbs into the croc-infested waters “as you can imagine the paperwork that can cause me”. 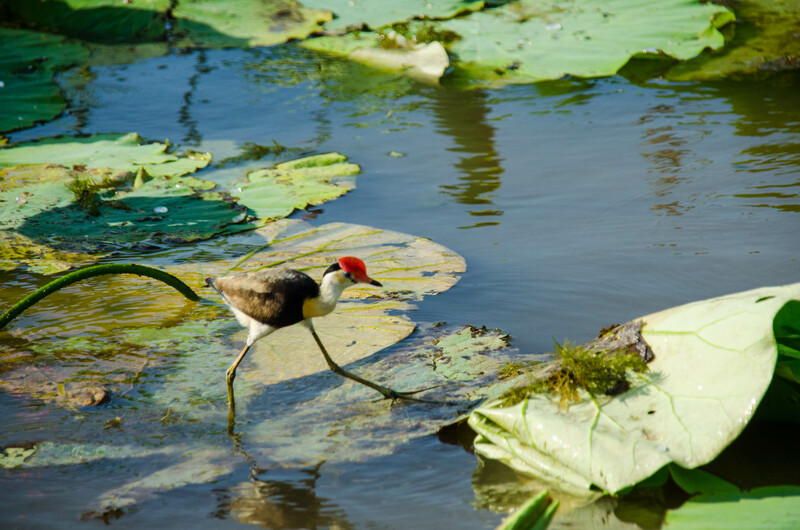 The wetlands has some of the best wildlife Australia has to offer, with crocodiles, eagles and jaçanas (also known as Jesus birds because they walk on water) all in plentiful view, among many other examples of that environment’s creatures. There was so much to photograph, I could have stayed there all day. The environment was just stunning to look at. 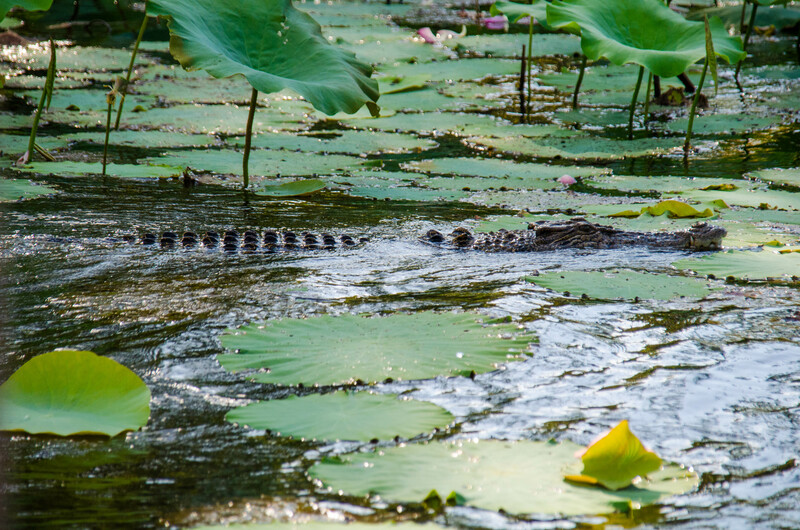 And we were all very excited whenever someone spotted a croc. The next day we headed on into Kakadu itself, where we saw some examples of incredibly old rock art. These drawings all had meaning, told stories, and above all carried messages for future generations, passing on information from one set of people to another. Just like we do today on Twitter and Facebook. 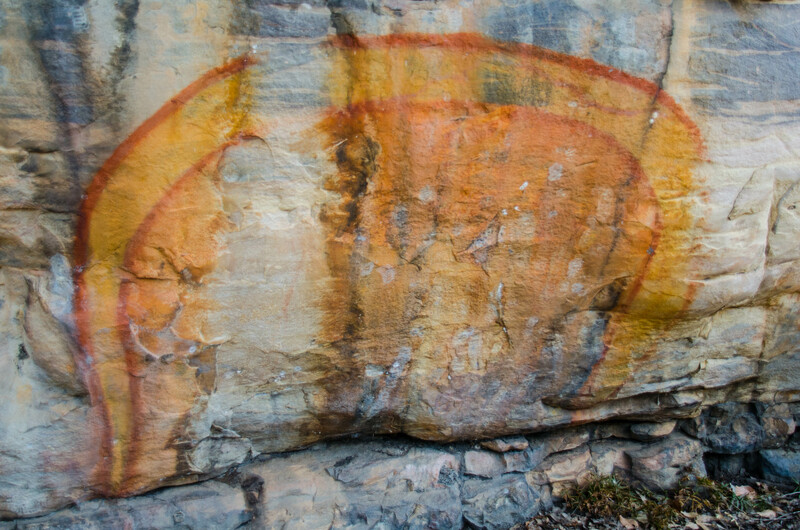 For example, this is a representation of the Rainbow Serpent, a well-known story in Aboriginal culture. In some stories it’s said that it eats children who don’t stop crying. As a result, even today, Aboriginal children will apparently not be left to cry for long without being comforted by their parents, lest they attract the wrath of the many-coloured serpent. I like to think how all the things we use so frequently now – social media, mobile phones, even an idea like Someone Once Told Me, all have their roots in paintings such as this. It was actually difficult to look at the drawings for too long, however, as the flies were the most aggressive and persistent I’ve ever come across, anywhere in the world. They would not leave you along for a second, were in your eyes, mouth, ears, nose, and when I took to draping a towel over my head, Catholic nun style, I could still hear them buzzing around, but thankfully unable to get into my face as much. Another highlight of the trip was a boat trip into the Jim Jim Falls gorge. The looming red rocks above and the utter silence of the place, which is still used by Aboriginal men to teach their sons their native ways, was a real soul tonic. 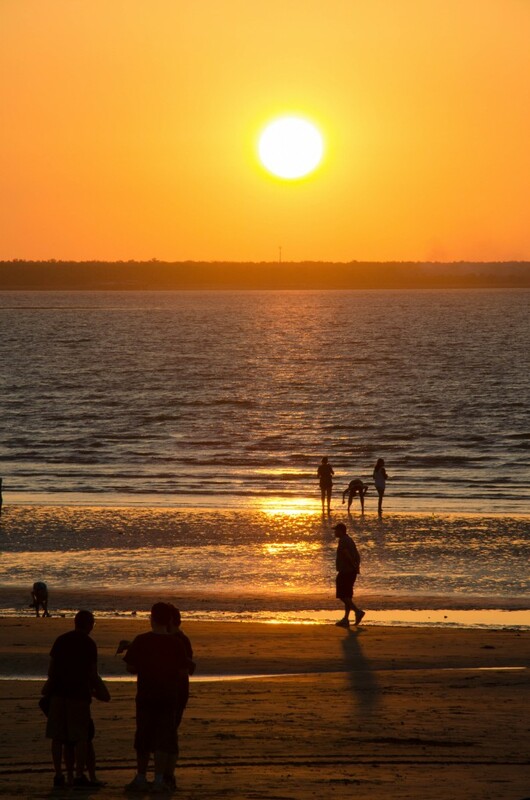 Back in civilisation, I should also mention Darwin’s Mindl beach, which is also a very clean beach, despite its popularity. It has a famous market attached with lots of tasty food to choose from, and is also rather stunning at sunset. 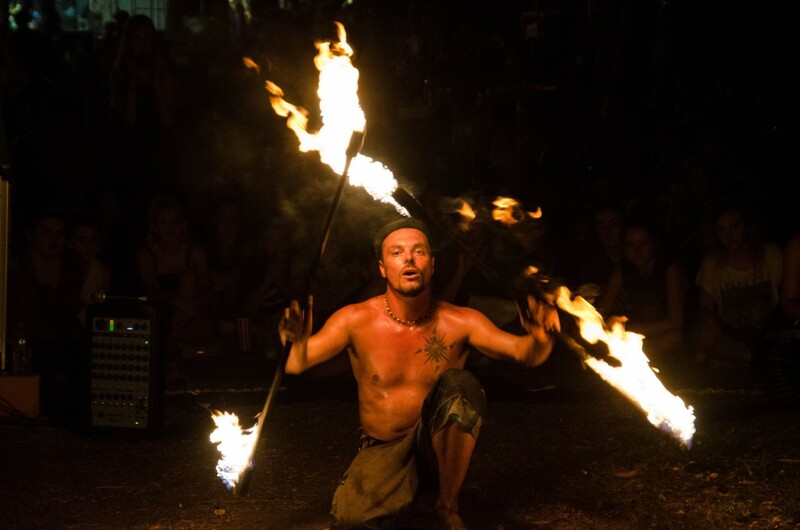 I also came across this chap there, doing a rather nifty act with flaming sticks. Finally, I did manage to bag this SOTM when out and about in the wilderness. 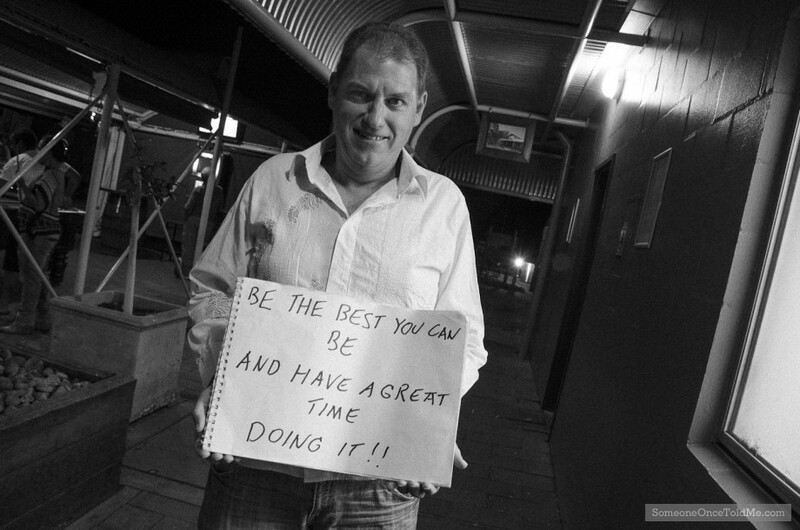 Click on the image to read more about why this chap is doing his bit to preserve a bit of Australian culture. After all this, we headed south to the middle of the country, to be bewitched by the magic that is Uluru, the giant red stone that was known as Ayers Rock when I was a boy. More on my time there, next time. 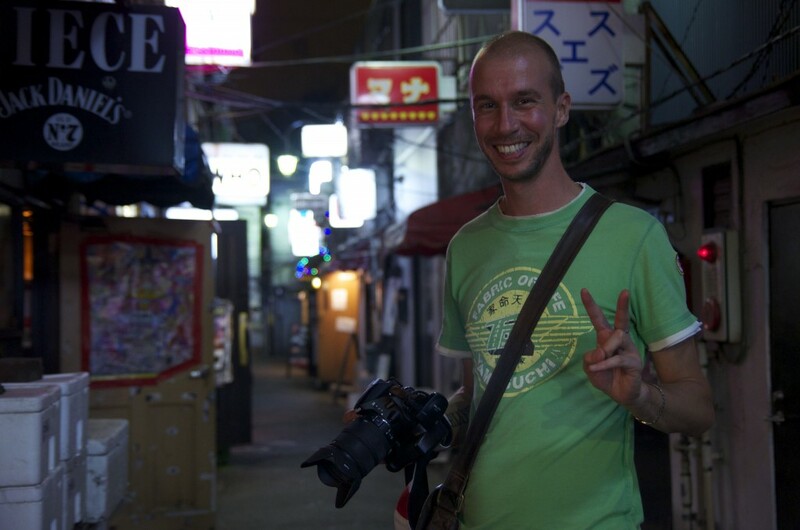 I liked Seoul, but don’t be put off when I tell you I considered it to be Tokyo lite. I really don’t mean that as an insult, but when you wander the streets there are a striking number of similarities to the untrained eye, as mine is. People from this region will be able to point to many differences of course, but to Westerners faced with narrow streets, tall buildings, cutting edge technology, copious amounts of Hello Kitty phone covers and beautiful, if indecipherable signs everywhere – well, it all blends into one. 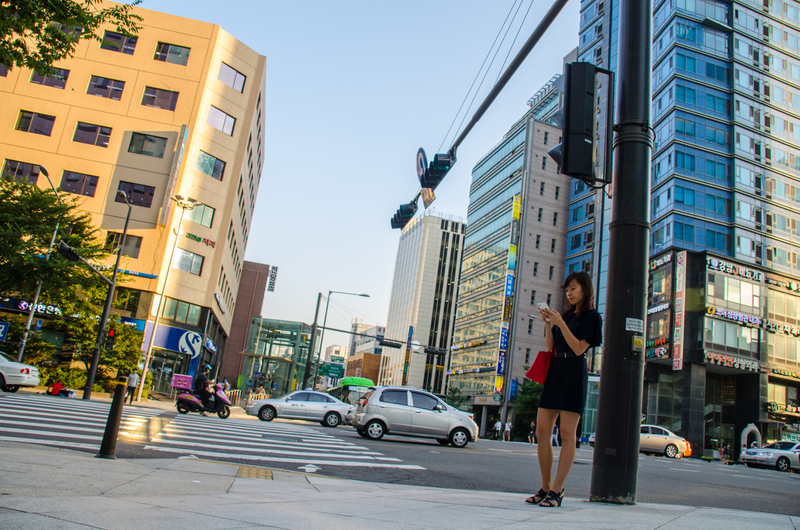 There is a particular distinction – while Japan’s wifi is superb, widely available and very fast, South Korea’s is even better, and is rated as among the world’s best. After a few weeks there, I can personally confirm this fact. Japan’s wifi was lightning, but South Korea’s was faster than the speed of light. Also, Koreans do a lot of barbecues, which mean you get small strips of tasty meat and a little round hot plate, often built into your table. It’s fun to finish off your own grub that way. Brings out the inner caveman and whatnot. 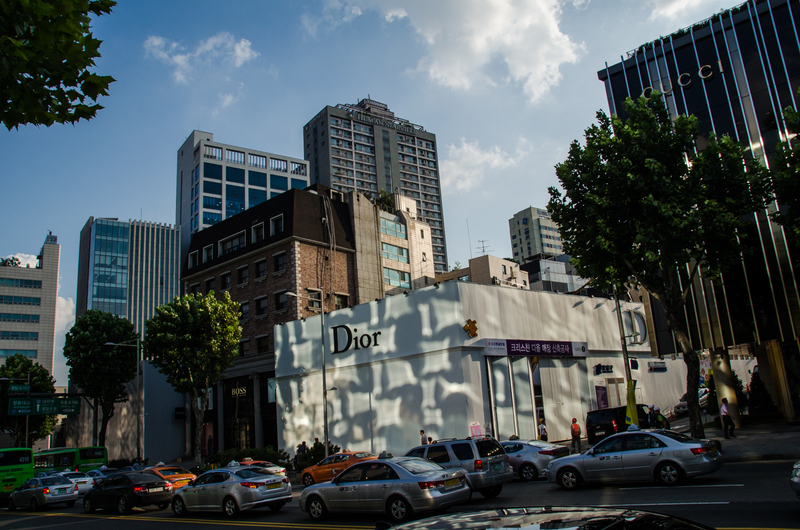 For the past year, Seoul has been particularly famous for Psy’s Gangnam Style song. 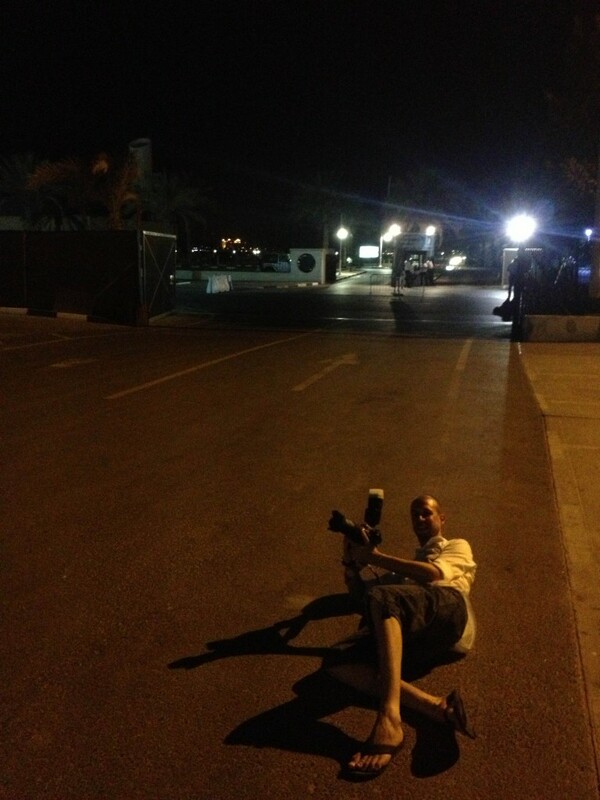 The shot above is from that district, which is filled with designer gear and Rolls Royce showrooms, that kind of thing. 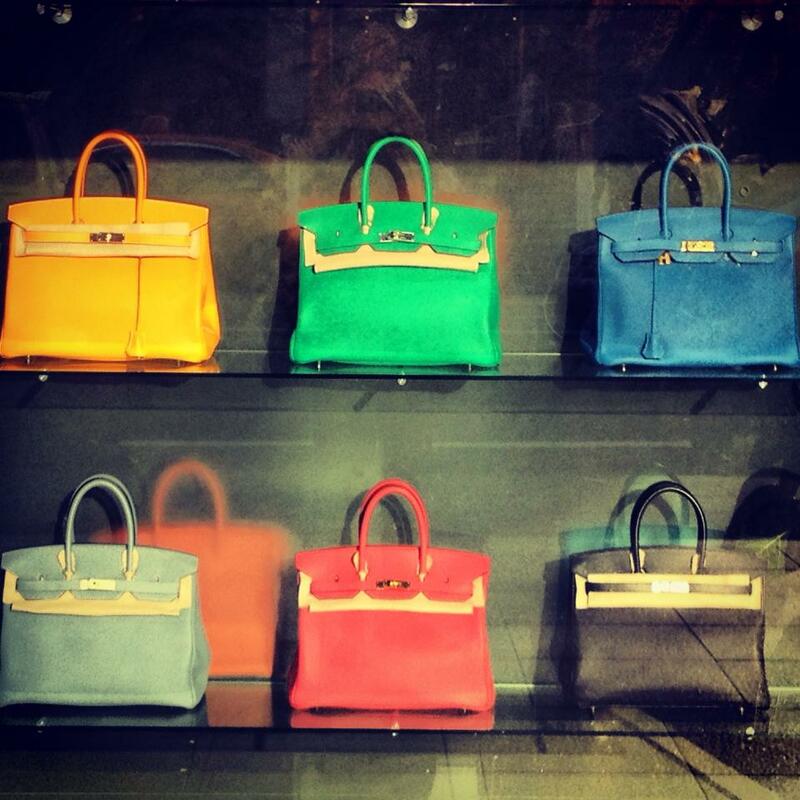 Here’s a typical shop window in Gangnam. This lady is one I spotted that afternoon who might just have been the sort of person Psy was singing about. 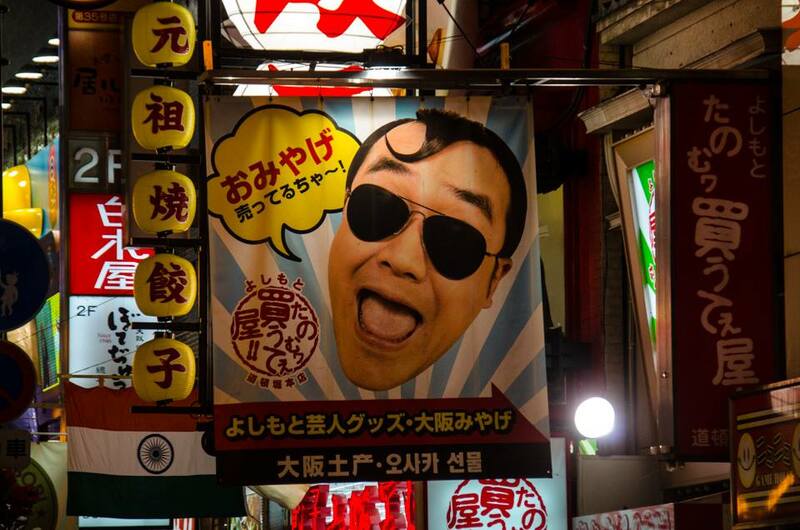 Incidentally, Psy’s face is everywhere in Seoul – you name it, he’s endorsed it. And why not? 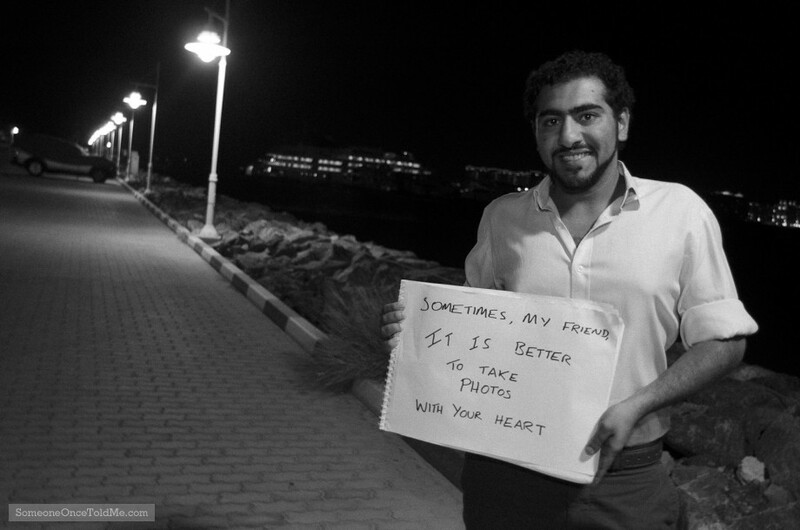 People like him make the world a better place. But the best part of the city is to be found in the university quarter, as often is the case in cities around the world. Seoul’s is called Hongdae where you’ll find everything you want – cheap eats, great cafes, mobile phone shops, computer stores, and lots of novelty socks and clothes. 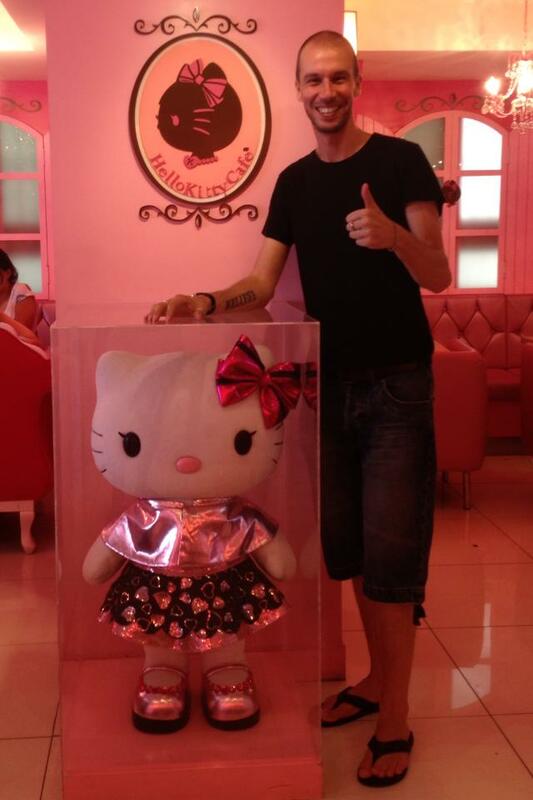 You’ll also find a Hello Kitty cafe in that district, and with some delight I visited it. I’m a big fan of The Kitteh and still cannot find a T-shirt of her in a man’s size (there’s probably a good reason for that). I did manage to get this photo of me in there, and for a while I was (proudly) the only man on the premises. 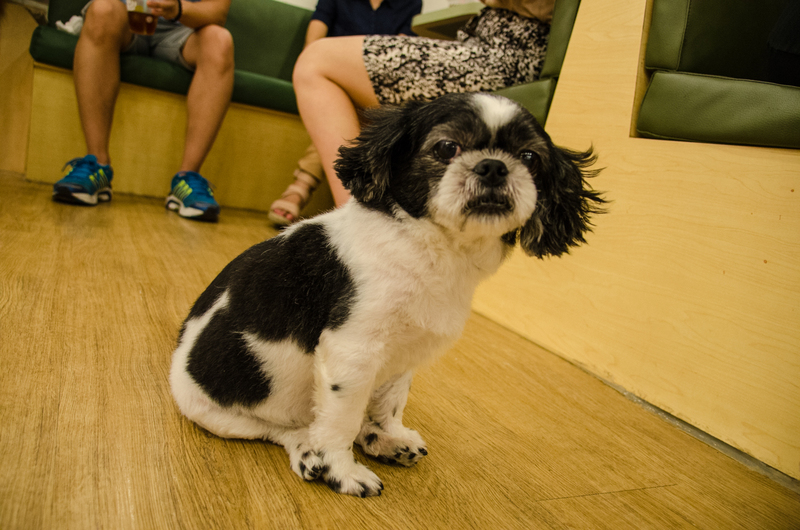 But while I love all animals, I’m most of all a dog man, and was thrilled to visit a dog cafe. 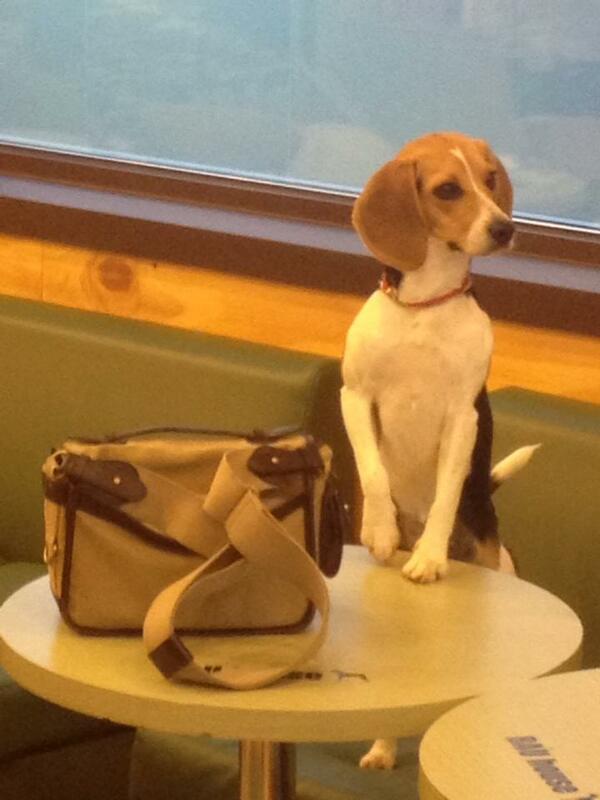 I know what you’re thinking – it is South Korea after all, where dog is a delicacy. But this isn’t that sort of place. The pooches are all running around quite happily, and you can buy a packet of treats to feed them. I did wonder about how often the dogs are exercised, what will all the treating going on by the thrilled customers, but most of them looked quite in shape and not overweight. Their coats were glossy and their eyes clear, and nails were clipped too so they did look in good health. This little chap, a bit old and not very energetic, stuck with us all the whole time. I liked him. I called him Eric, in Eric Cantona’s honour. Also spotted this fella on the way out and had to take his photo. I hope that bag was full of treats for him. 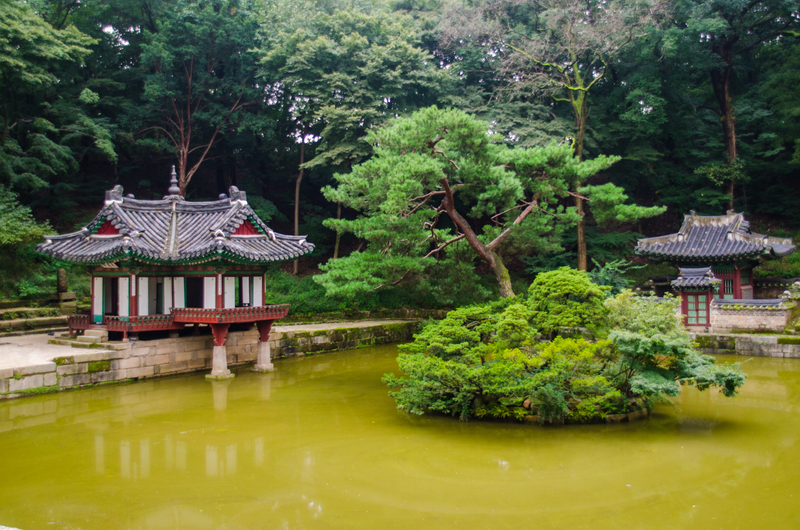 But after wandering around the über-modern Hongdae which crackles with electricity and microchips, I thoroughly recommend a detoxing visit to the Secret Garden at Changdeokgung Palace. 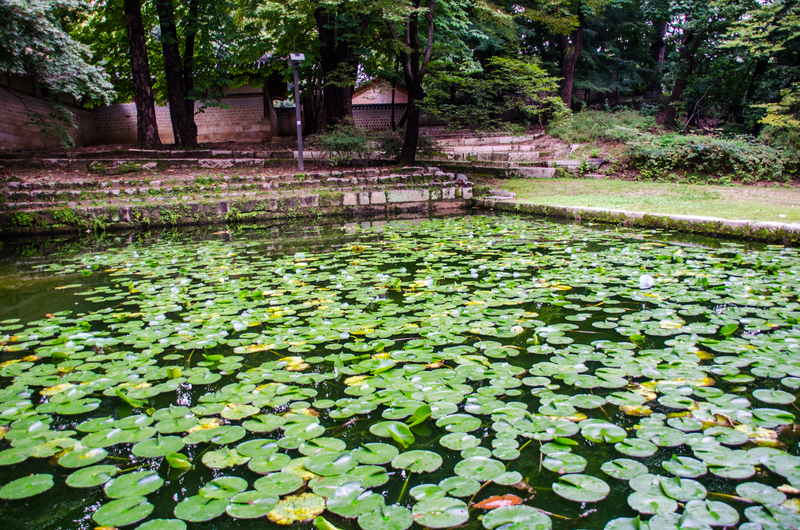 Once the refuge of the Korean royal family, the palace is nice but I have a low tolerance for palaces and temples. Frankly, the world is full of them, those within one country often look the same and when people come to the UK, for example, they don’t spend their time going round all the churches that nation has to offer. If they did that in Malta they’d be particularly busy – there’s 365 of them there. 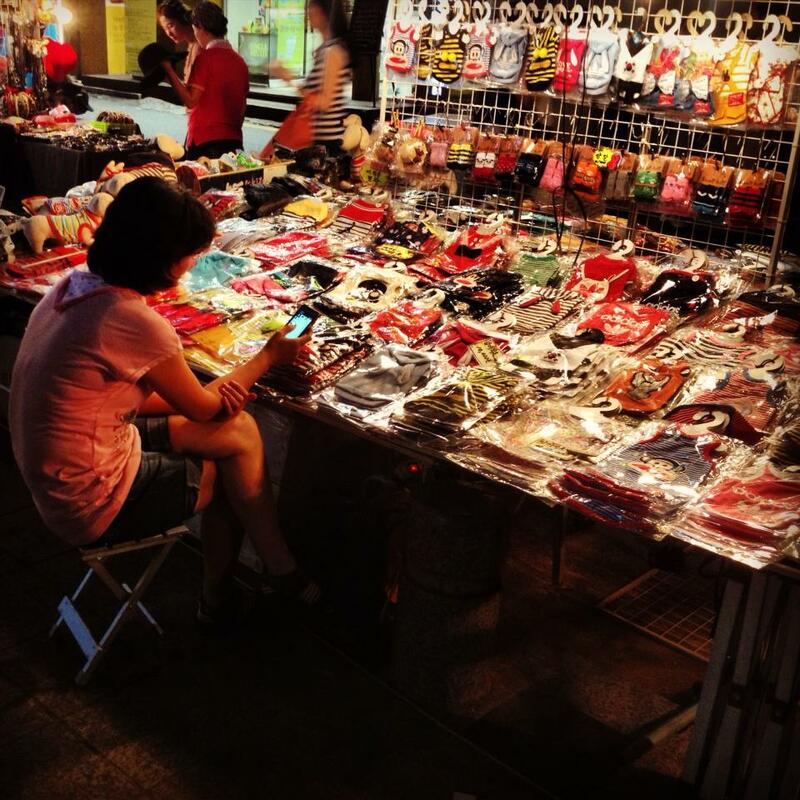 So I’ve a three-temple maximum, and then I’d rather wander around a market and try to capture people on the streets. But while the only other people in the palace’s Secret Garden were the group we were part of – you have to be guided around – the whole garden area, which covers 78 acres, is simply gorgeous. 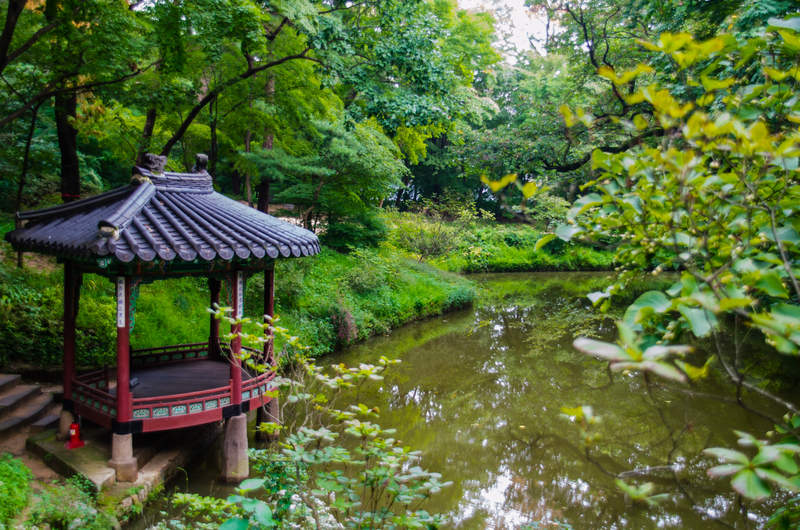 Amusingly, as our guide took us around, she kept pointing out places that various kings throughout the Joseon dynasty (1392-1897) used to play drinking games. So much so that I began to wonder if Korea’s ancient kings were partly British. For example, the king would sit in the structure to the left while his ministers and strictly invited guests would come up with wordplay games and poems. If they failed to do so in a clever or chucklesome manner, they’d be banished for a while to the island in the middle of the water. Other parts of the gardens were similarly dedicated to spots where the king and his cronies could drink away to their heart’s content. The garden’s copious foliage affords great cover from the sun, and there are delights all around the paths you take. No wonder it was once only for the eyes of the privileged. 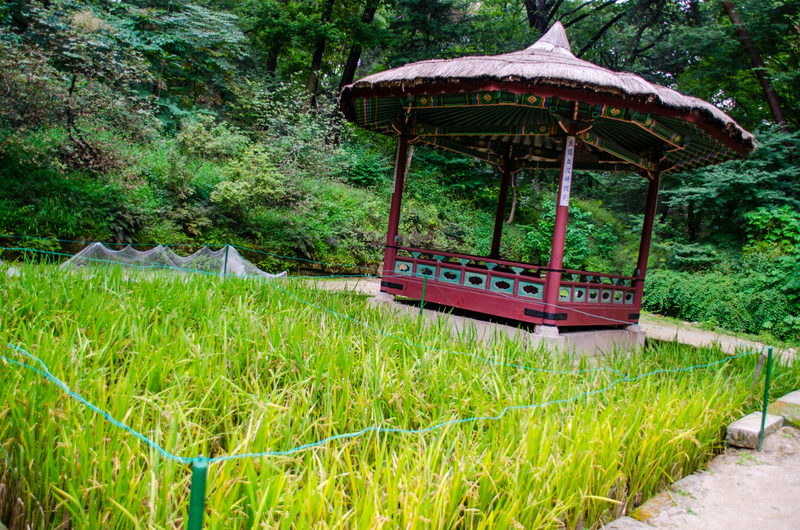 Brilliantly, this is a miniature paddy field, for the king to tend himself. Depending on how it did, he would then know how good or bad the rice crop would be that year for his subjects. What a great idea! Let’s hope he acted accordingly when the crop was bad. 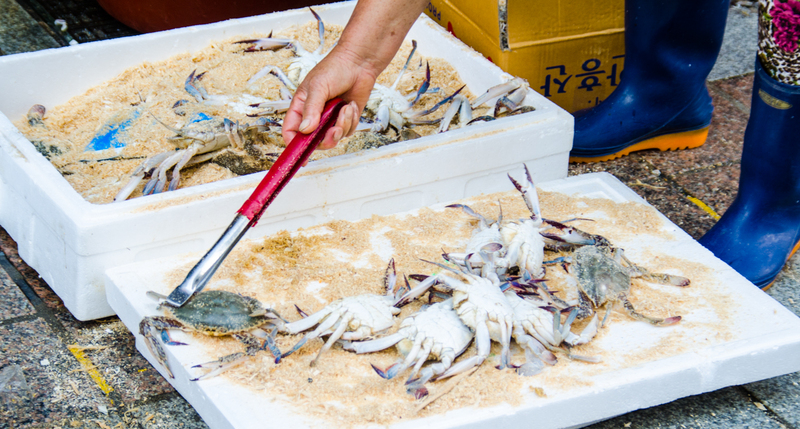 After having seen a bit of Seoul and sucked up as much of its wifi as possible, Adventurous Kate and I hopped on a train to Yeosu. We were the guests of the excellent Heather, who proved her hostess/mostess tag by putting us up in her place for a few days, gallantly taking the couch herself so as to let us snooze in her bed. 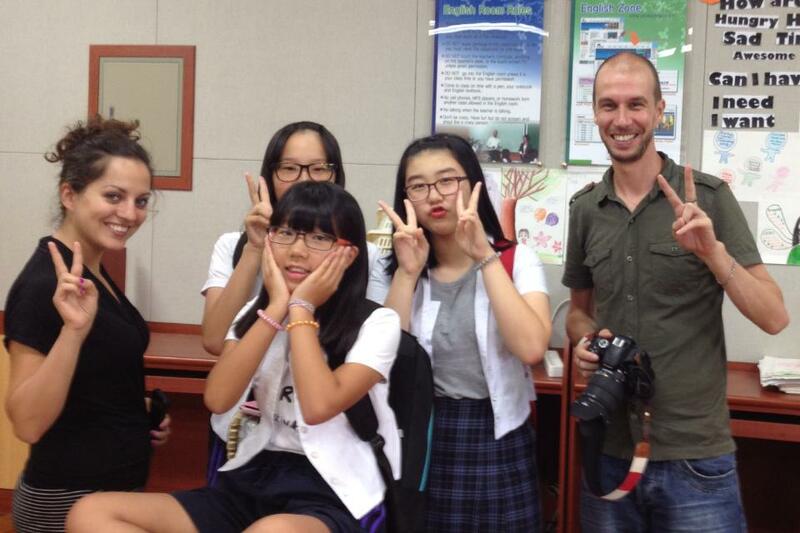 Excitingly, Heather also arranged for me to visit Yeosu Girls’ Middle School, where I got a number of the charming young ladies there to take part in SOTM. 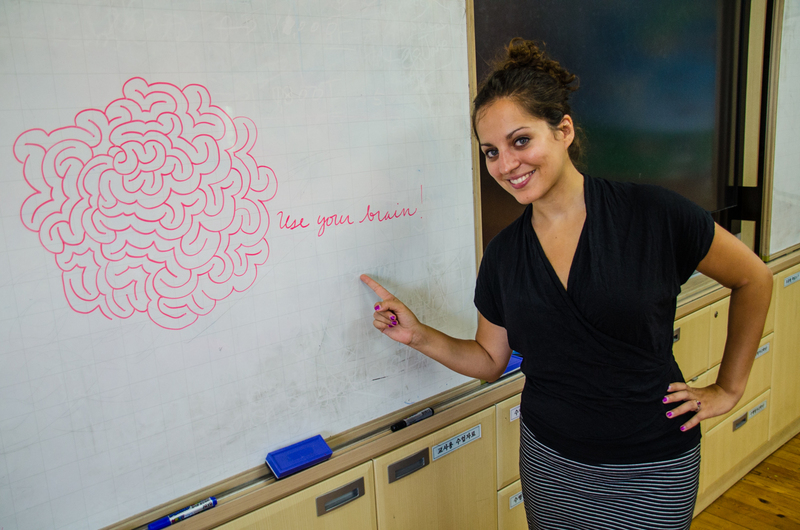 While we were just guests that day, and observed Heather teach her pupils, I think Kate got quite into the idea of teaching a class herself, drawing an inspirational message expertly on the board. This is a shot of me taking a SOTM in the classroom, with quite an excited audience. 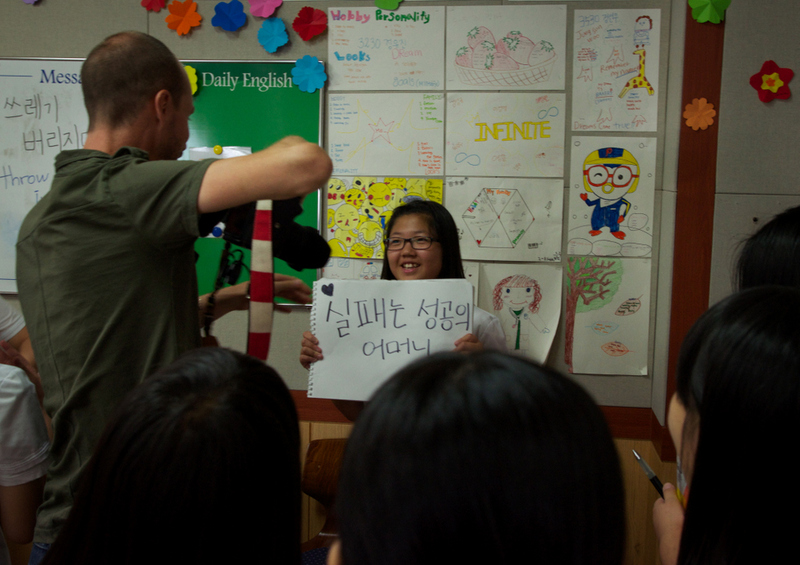 And here are some of the great photos I got that day from the schoolgirls, who were very sweet. Click on the images to find out what they mean – the first one is a sumptuous little proverb, involving pears and typhoons. This is Serena’s SOTM – many of the girls adopt Western names. 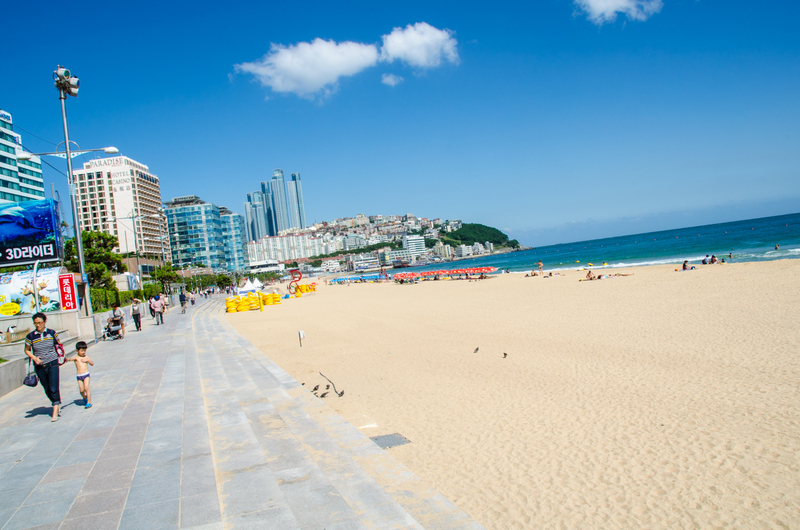 After happy times in Yeosu, we pushed off to nearby Busan. 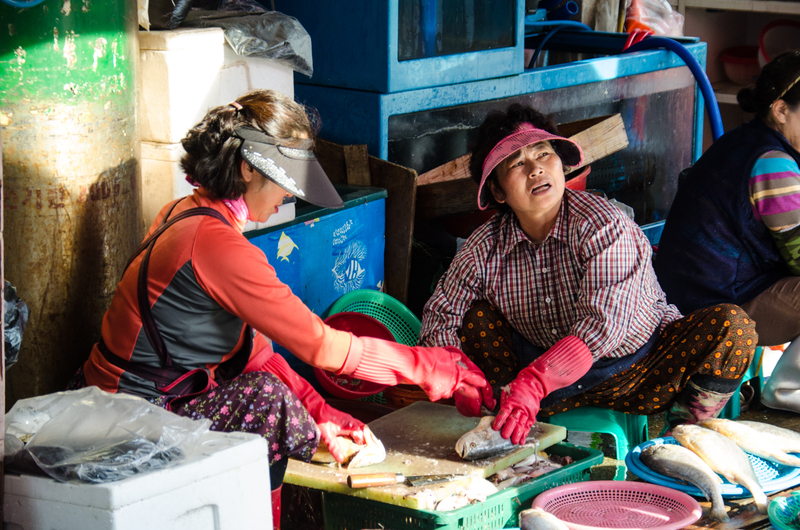 Among its many features is a fascinating fish market. If it come out the sea and wriggles, then you’ll find it for sale there. I’m making a break for it lads! I’m heading for the border! Freedo…. ah, rats. 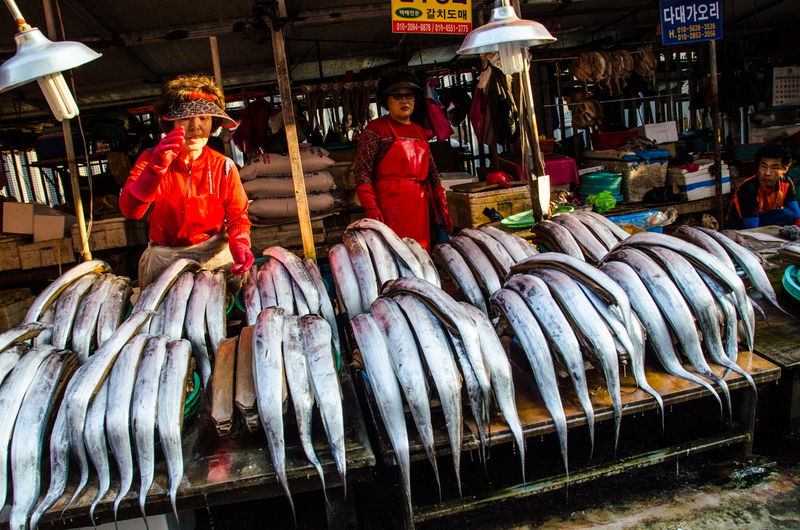 The fish’s scales shimmered when they caught the sunlight. 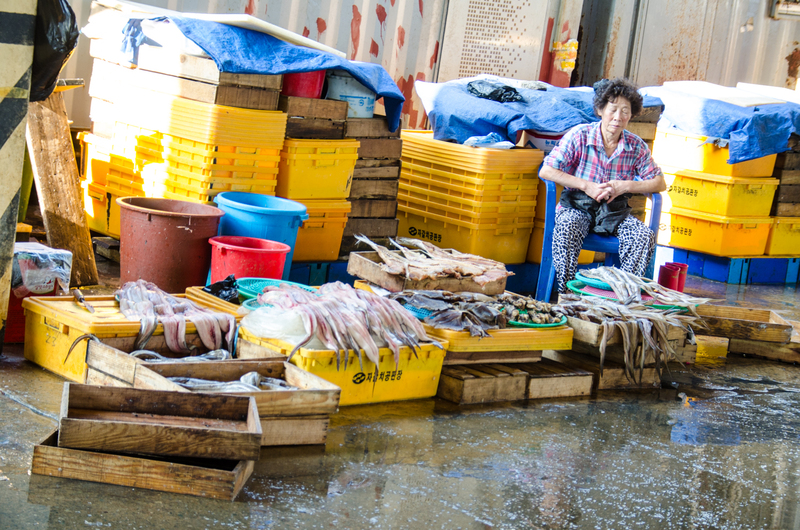 I also noticed that the majority of sellers in Busan’s fish market were women. 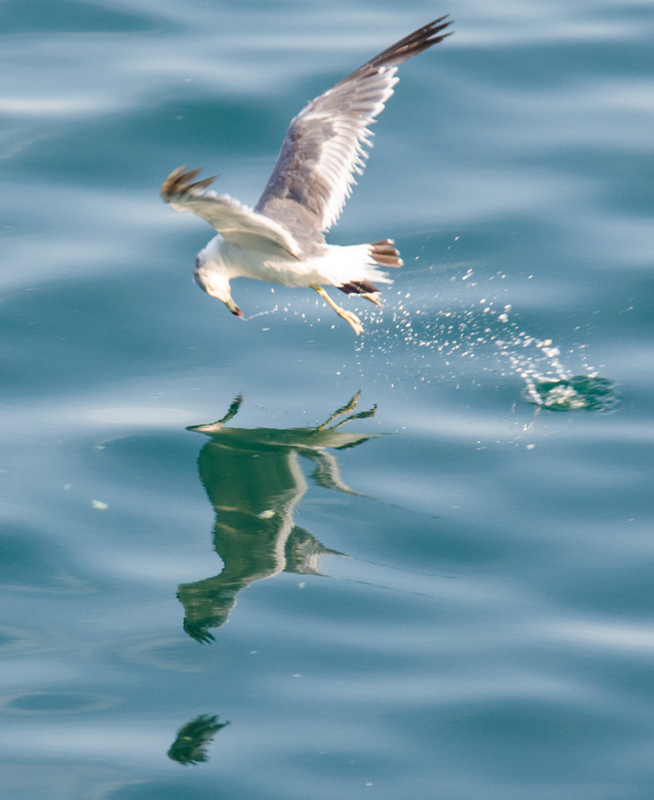 There are also lots of dive-bombing seagulls next to the fish market, which make for an entertaining few minutes’ distraction. 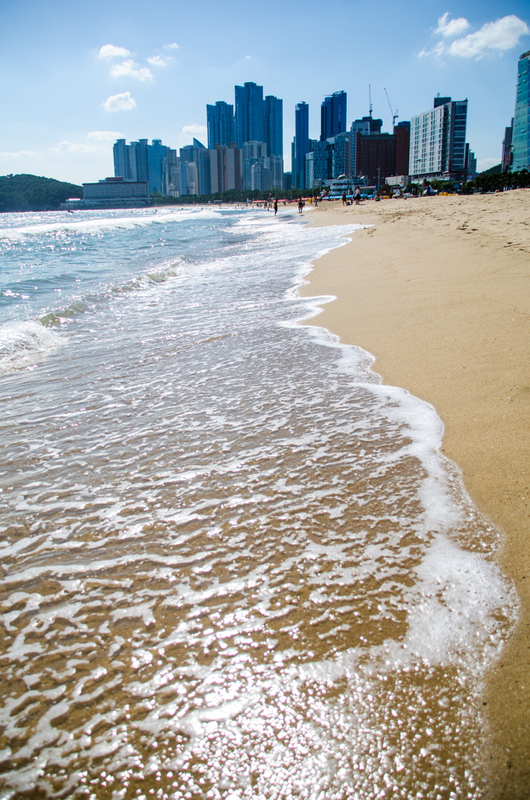 Finally, one afternoon, Kate and I strolled down to Busan beach for a very pleasant afternoon on the sand. If you’re in town, it’s a great place to visit and very clean. The beach is apparently popular, but was quiet when we were there. You know that thing where girls jump and try to get captured mid-flight? You see it everywhere. Also in Busan I noticed that, like many other parts of the world I’ve been in, there are Turks selling Turkish food. I love kebabs, so this is a good thing, obviously. This chap was doing a few nifty tricks with ice cream. 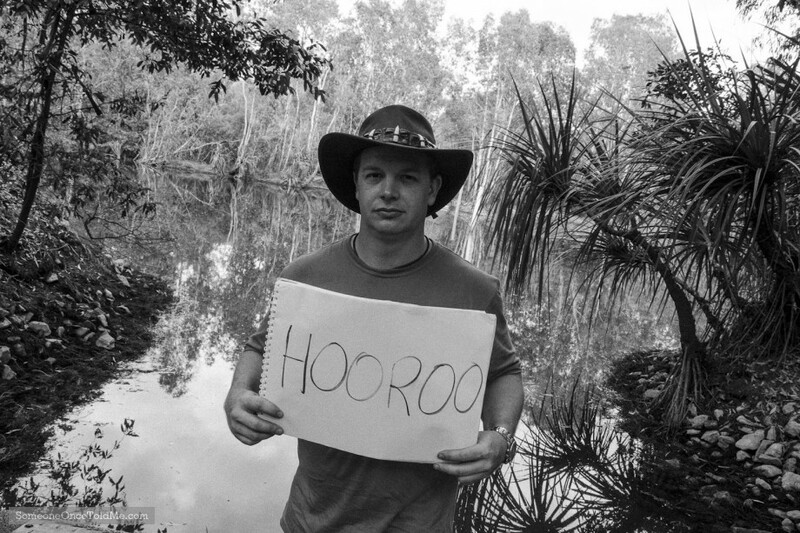 So after all that little lot, it was off to be properly DownUnda – a trip to Australia for three weeks. I like kangaroos and don’t mind snakes, but what about spiders? Could I avoid their hairy clutches? Find out next time. Our arrival in the land of the rising sun was delayed a little after the China Eastern Airways plane we were on broke down in Kunming. This left us stranded for 24 hours in China, but the airline put us up overnight and a day later than planned, we were in Tokyo, baby. 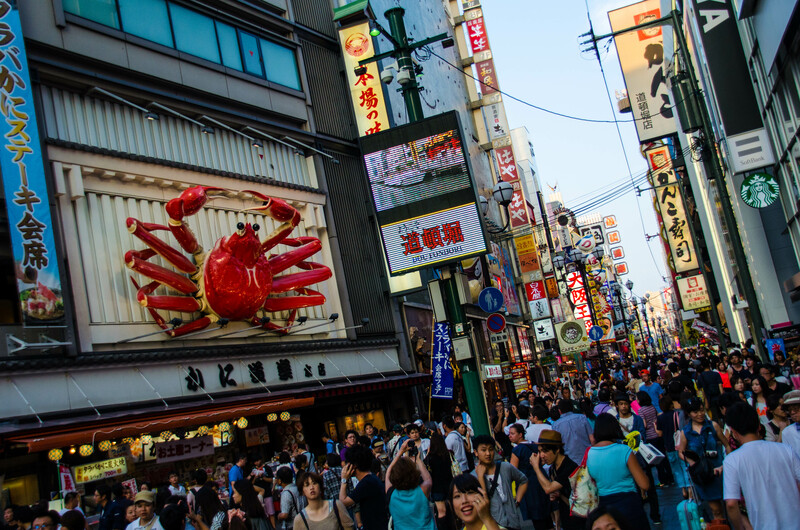 Japan quickly became one of my favourite countries, and Tokyo one of my favourite cities. There, I’ve said it. The landscape is everything you expect it to be – Bladerunner without the pollution or missing simulants. The environment is spotless – while you frequently struggle to find a bin, you’ll find it harder to spot discarded rubbish in the street. Just doesn’t happen. 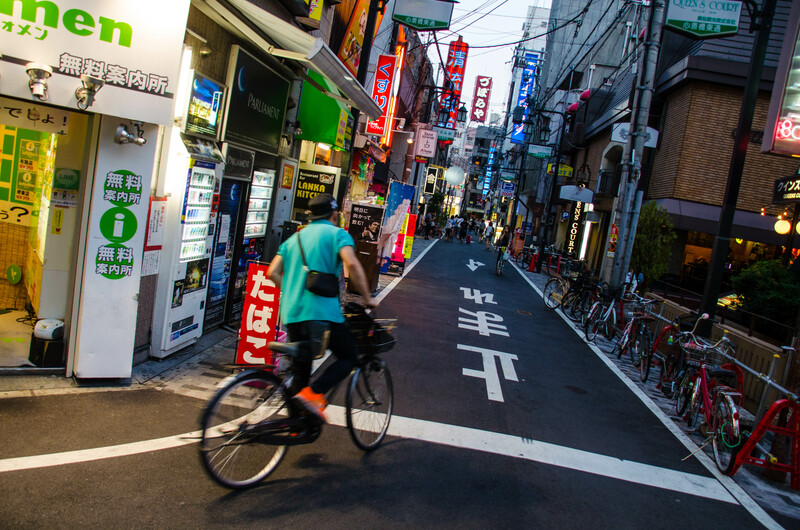 I recall being in Seoul and seeing a young guy there toss his cigarette packet wrapper into the road, and thinking how that would never happen in Japan. Also, people there bow. A lot. I mean, really often. 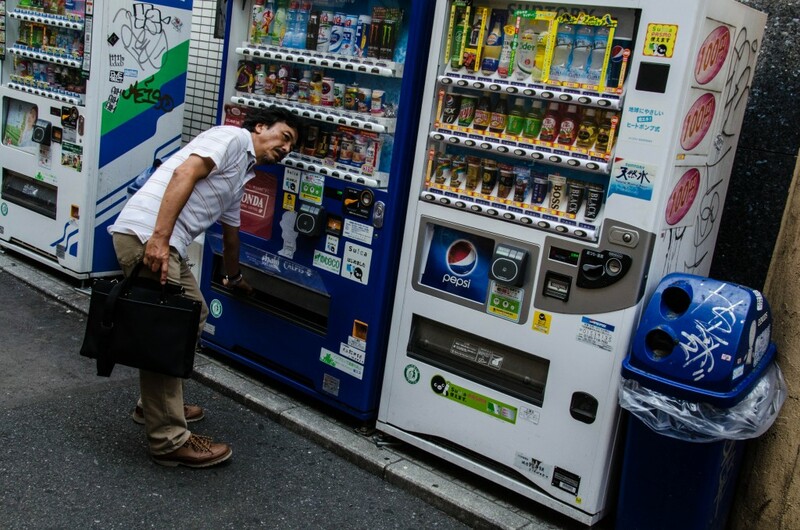 If you buy something from a convenience store, the chap might well bow to you. There were department stores we popped into and there would be a fellow by the door, greeting us in Japanese and bowing. Seemed to be the main part of his job. The society is as painstakingly polite as you expect it to be. And it’s also not massively tall – hence I banged my noggin every day I was there. On doors, buses, trains, roofs. Once I drew blood and saw stars, I cracked it that hard on a door-closing mechanism. No wonder I don’t have any hair. 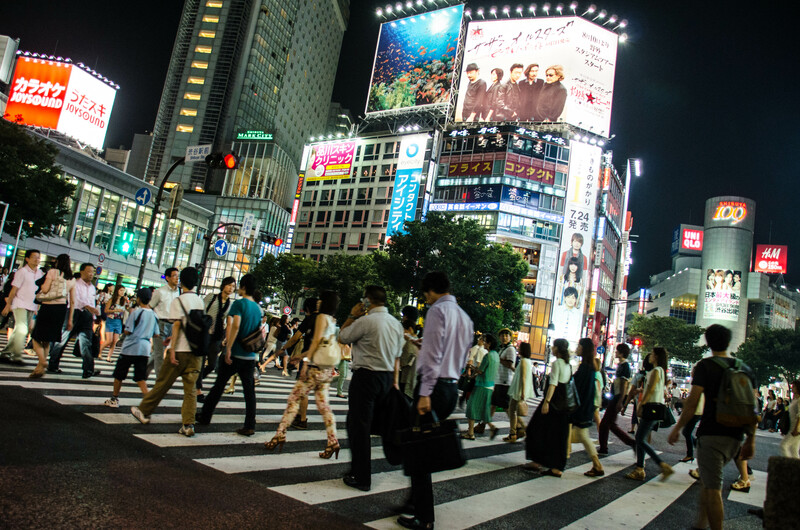 One of the highlights of the city is the fascinating Shibuya crossing, a series of giant zebra-coloured paths in the beating heart of Tokyo, mimicked by the recently revamped crossing at Oxford Circus in London. If you want to people watch as they scurry from one side of the thundering traffic to the other, then this is the place to be. Just around the corner we had incredibly tasty noodles in soup, and the chap serving us agreed to pose for me. I really like this image, not least because I was keen to capture his wellies and feel like I got something of his personality in the shot as well. Kate and I were both quickly taken with the amount of vending machines dotted about the place – while we disappointingly didn’t see any knickers on sale, which I’m told is true but never managed to verify for myself, there were drinks available everywhere. In the record heat that Japan was experiencing during our stay, those easily available beverages came as both a relief and necessity. After a few days we popped over to Kyoto on a train which cost more than many of the flights we’ve taken so far on this trip. Eye-watering. Having said that, it afforded more leg room than any transportation I’ve ever been on and departed/arrived at the exact minutes it was supposed to, despite those times being some hours apart. 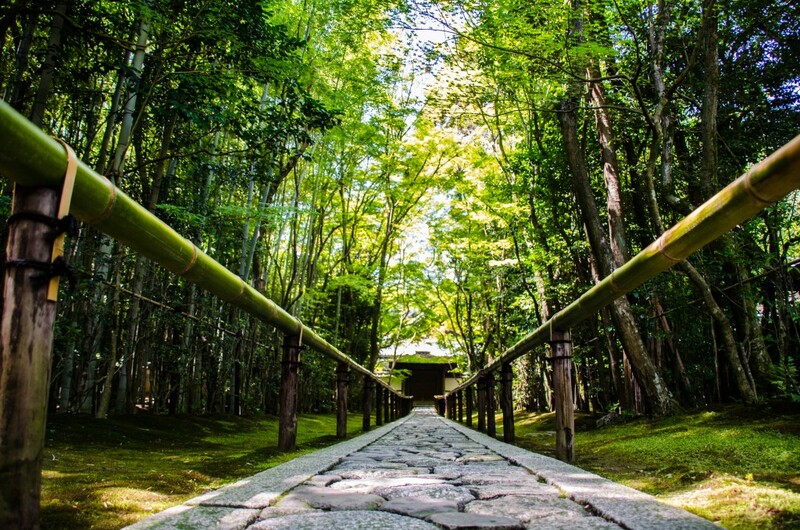 Kyoto is a splendid city, and while the amount of temple-hopping we did in Japan made me introduce a three-temple maximum in any city, the ones we saw will linger long in my memory. I’ll also never forget the 100 degree heat in which we sweltered. 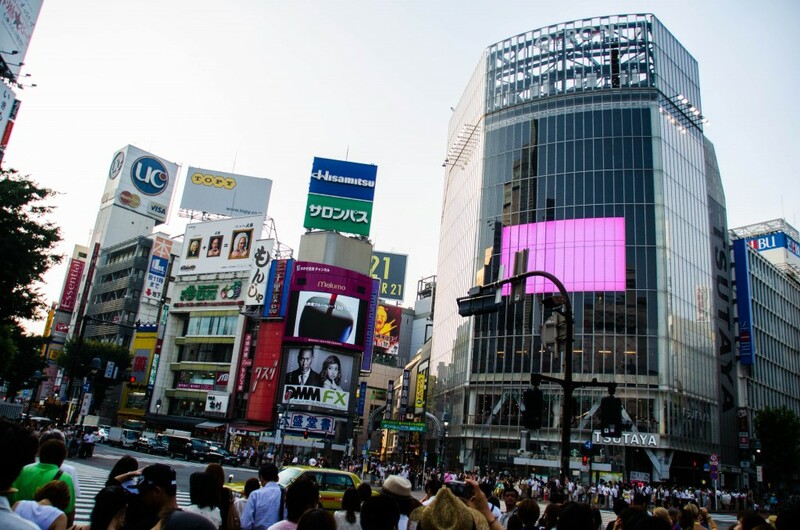 Apparently it even reached 103 in Japan when we were in Tokyo, a record for the country’s recorded temperature history. Bet those vending machines were doing a roaring trade. 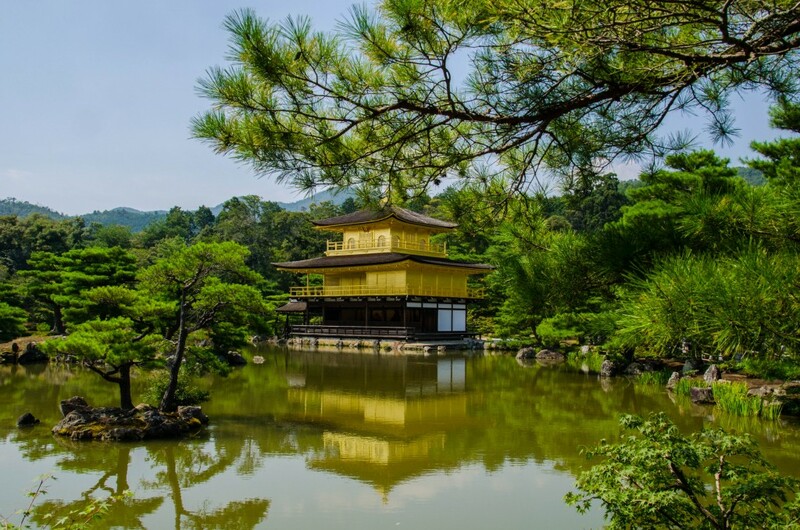 The Golden Pavilion, Kinkaku-ji, is a delight. On a brutally hot day, it appeared before us even brighter than the sun. 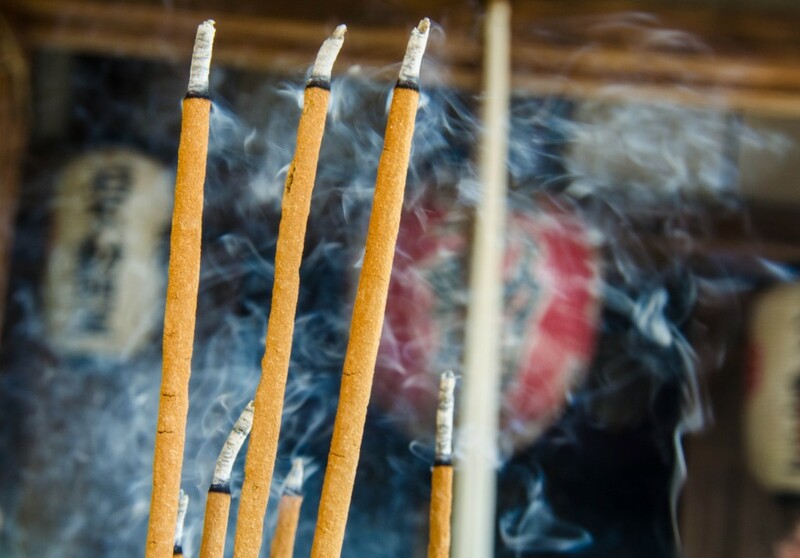 You can pay your respects by leaving incense at one of the temples at the Golden Pavilion’s complex. 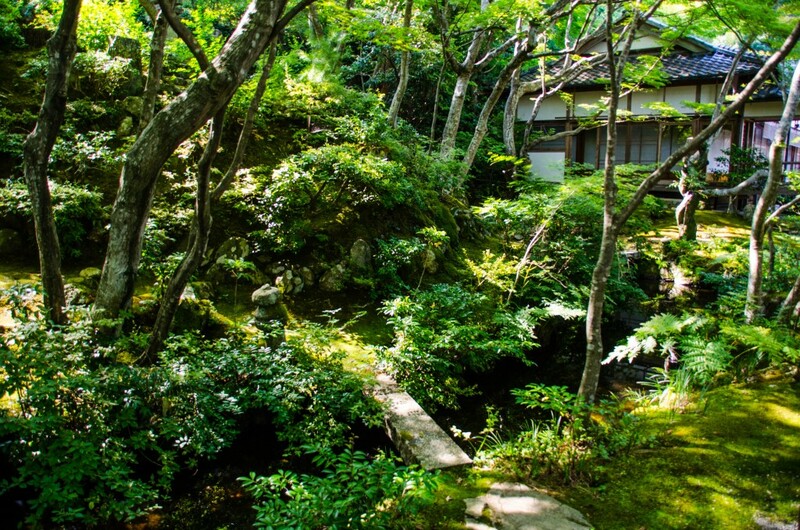 But my favourite temple was the leafy Daitokuji complex of temples. One of them in particular was silent, its thick foliage fought bravely against the invading waves of heat, and it was everything I wanted a temple to be – small, intimate, thoughtful. It was such a relief to be in a cool garden that day, with the temperatures again close to triple figures. This large water bowl was brought over from Korea. 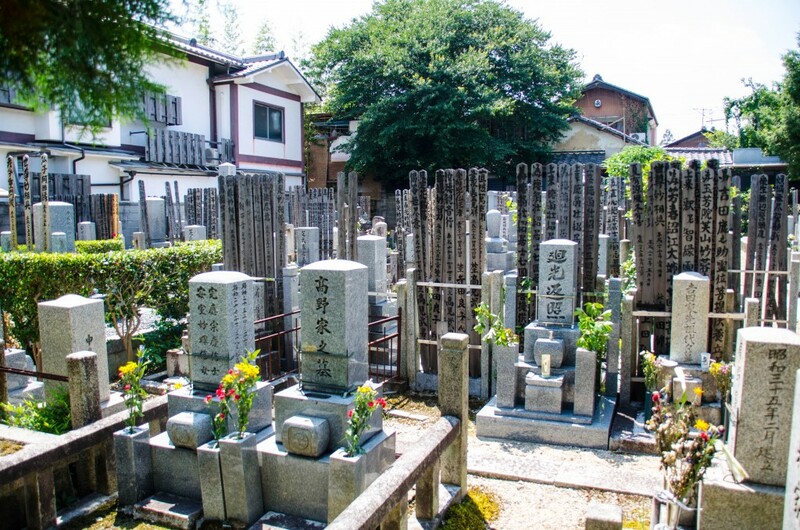 And if you look round temples in Japan, you’ll frequently find spruce cemeteries which are very reverential to those who have passed away. 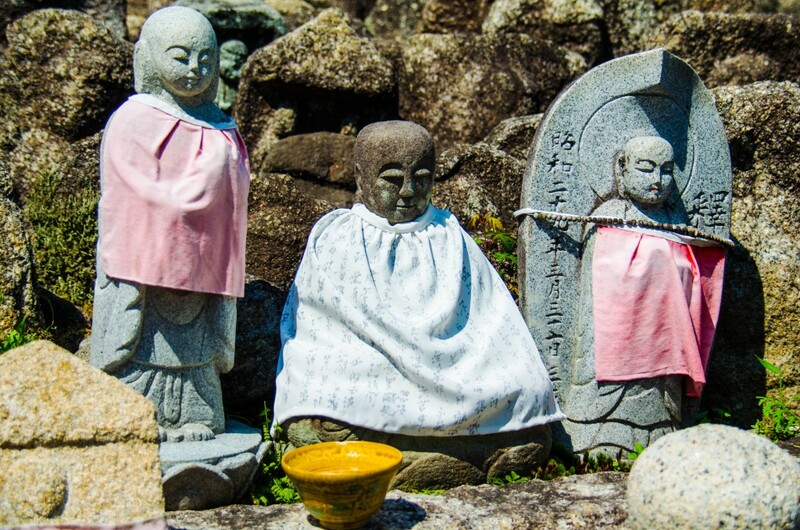 These chaps look old but are still clearly used in rituals by relatives of the dead. 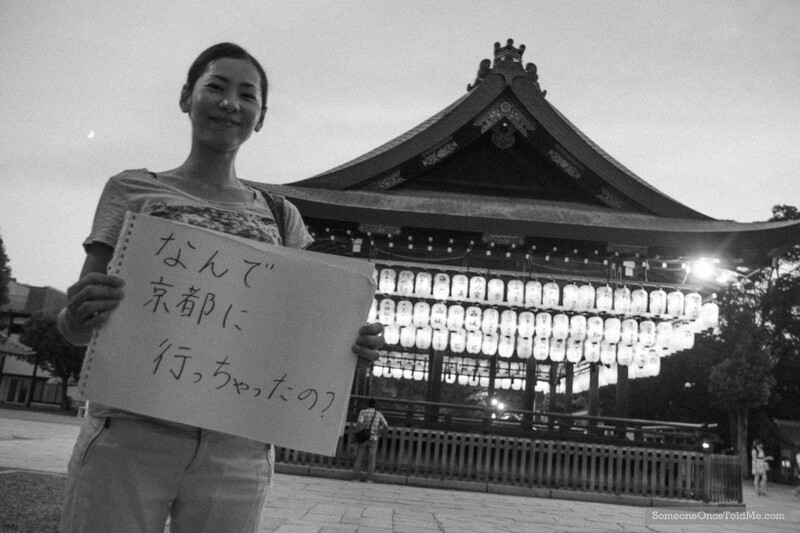 While in Kyoto I was put in touch with the charming Fumi, a very sweet lady who made very excited noises when I told her I worked for the BBC, doing no harm to my ego at all. 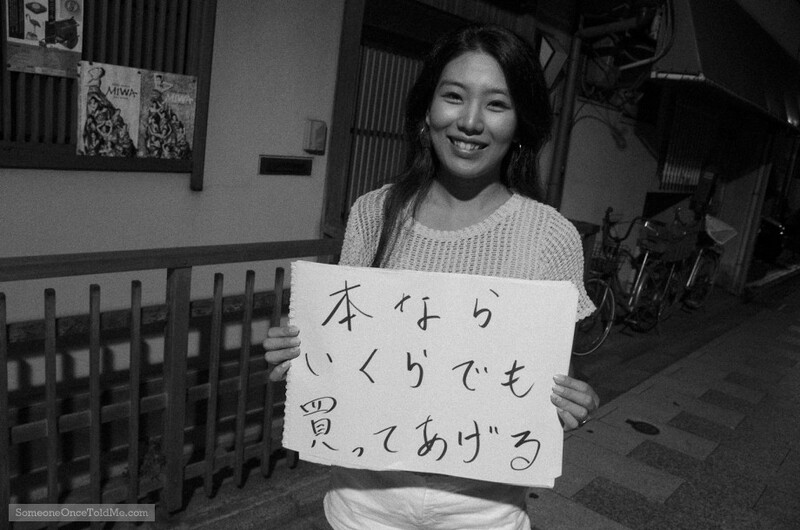 It was, as she explained in her SOTM story, her dream to live in Kyoto, even if her friends queried her decision. While we were in Kyoto, Kate and I made friends with a charming couple, the lovely Miu and dashing Micheál. They helped out with a couple of Japanese SOTMs that I picked up in a bar they took us to, and they also posed for their own. 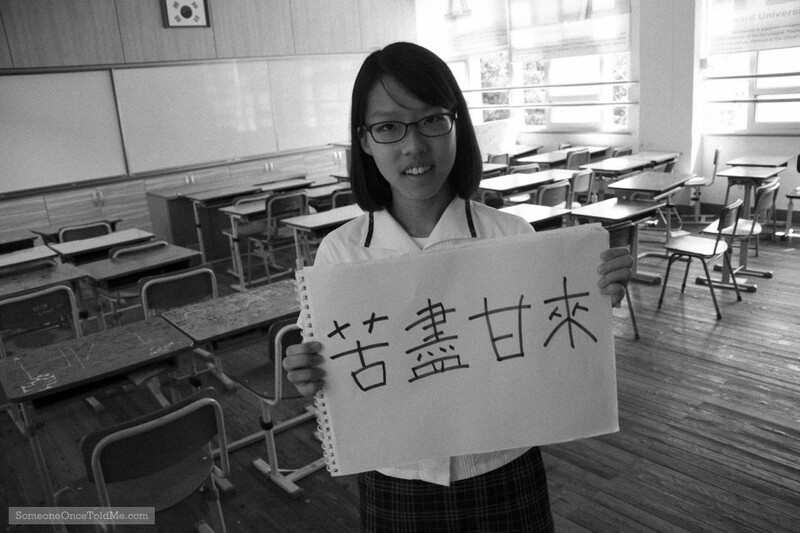 Micheál chose a very thoughtful story, and this is Miu’s photo. As always with any SOTM photo on this blog, click on it to see the original post and see the story behind those words (and the translation). 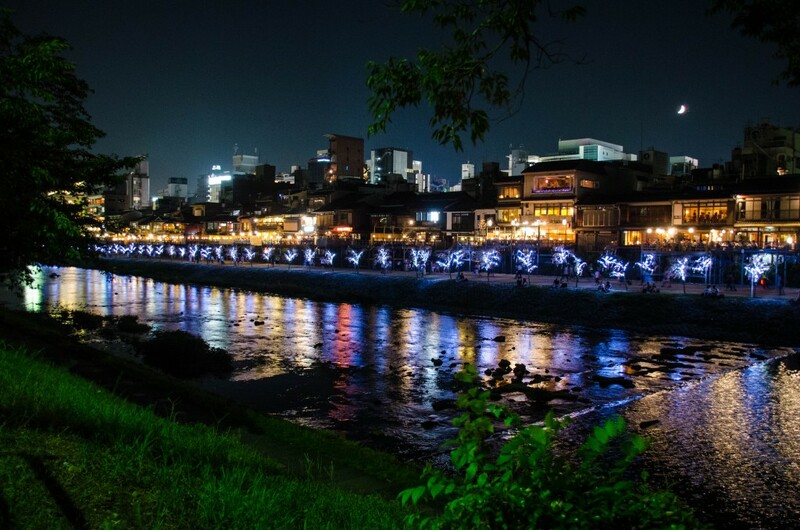 Kyoto is a charming city, quite like a dream. Now for one of the highlights of our trip, a rather fishy experience. 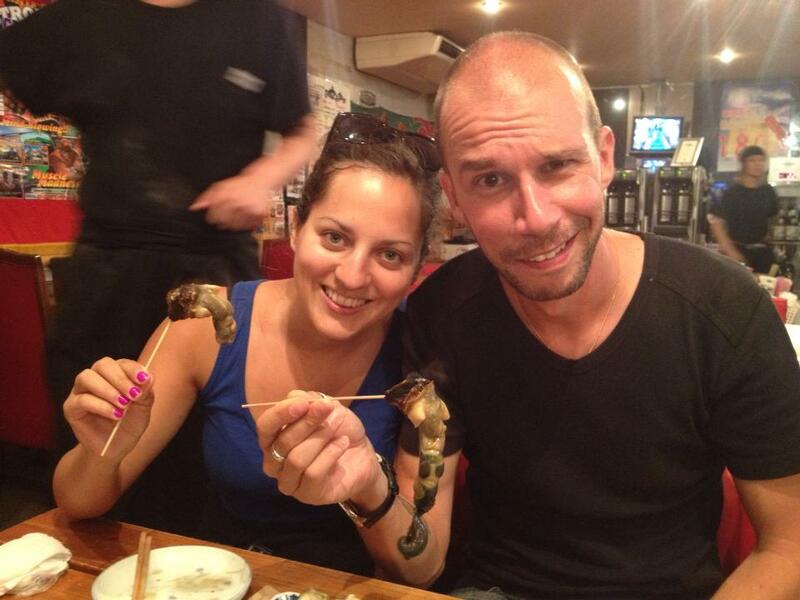 Miu and Mike took us to a seafood restaurant which had all manner of creatures slithering around in tubs and buckets. I felt like I was Sebastian Crustacean at one point. 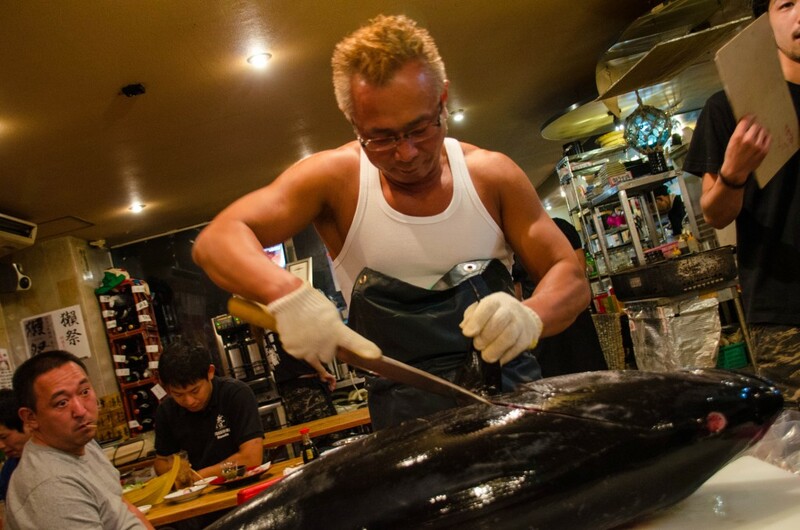 Then, it turns out we had ringside seats for a mahoosive tuna that was due to be carved up by a chap who apparently is a bit of a celebrity chef. Here he is – and check out the guy’s face bottom left. 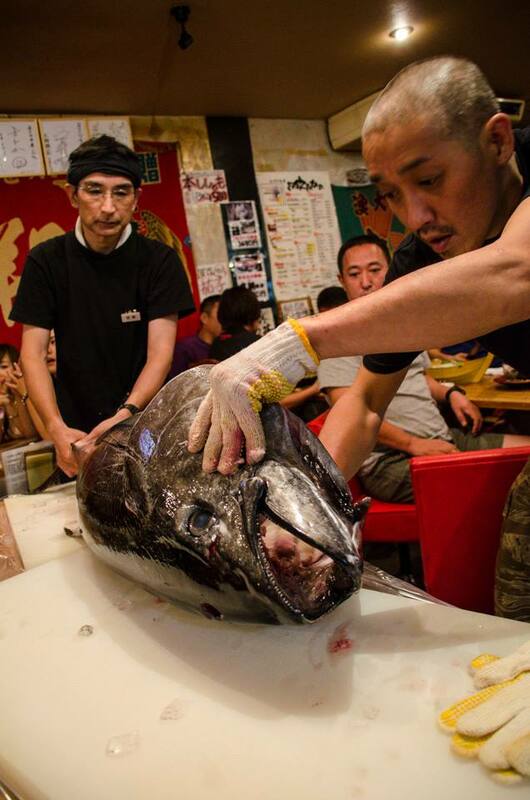 Maybe he thought tuna slices are born in a can. 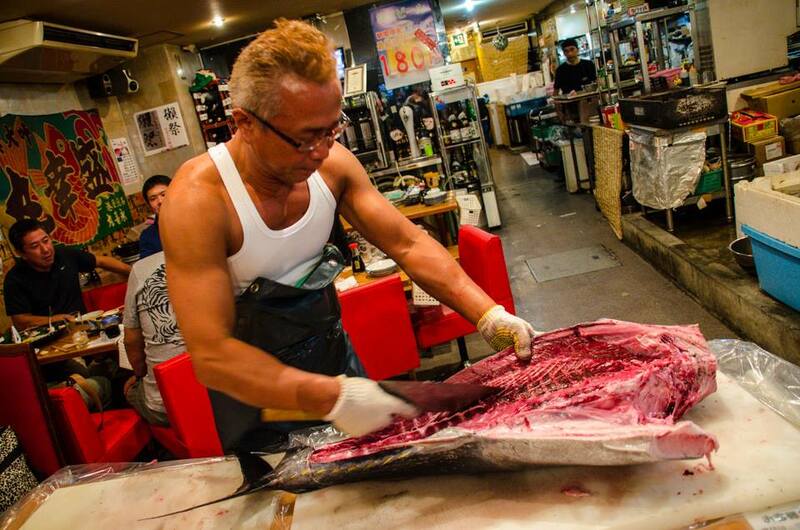 The chef really made a show of cutting up that fishy beast, and I’ve never seen anything quite like it. The monster from the deep was hoisted onto the table by these two chaps. Apparently it was worth about 1 million yen (£6,300, $10,000). 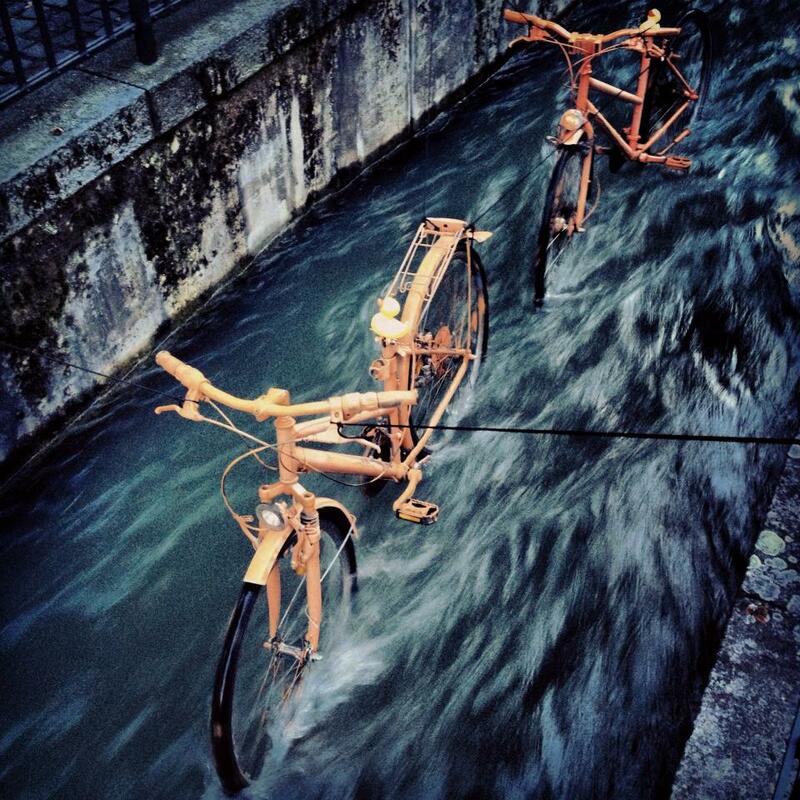 …and this is what happens. But this wasn’t the only thing I ate that night. Oh no. We all got given what’s known out there as Japanese turban shells, also called the horned turban, a species of sea snail. I ate mine, despite it not looking exactly like all the others served to our table, raising both my suspicions and alarm. Mine was longer, greener, and looked even more alien than the other examples of how this unusual creature usually appears. In eating it, I felt quite like I was doing something to an extra terrestrial’s nether regions which I’d certainly regret in the morning. But down the hatch it went. I can only describe its taste as “of the sea”. This photo further explains what I thought of the whole experience. During all the evening’s palaver, especially when the chef was wielding his expert cleaver, there was a table of young women who were as impeccably dressed as you’d expect – Japanese women begin the most fashion conscious, and attractive, in the whole world. Seriously. These ladies loved having their picture taken and posed every time I took a shot. 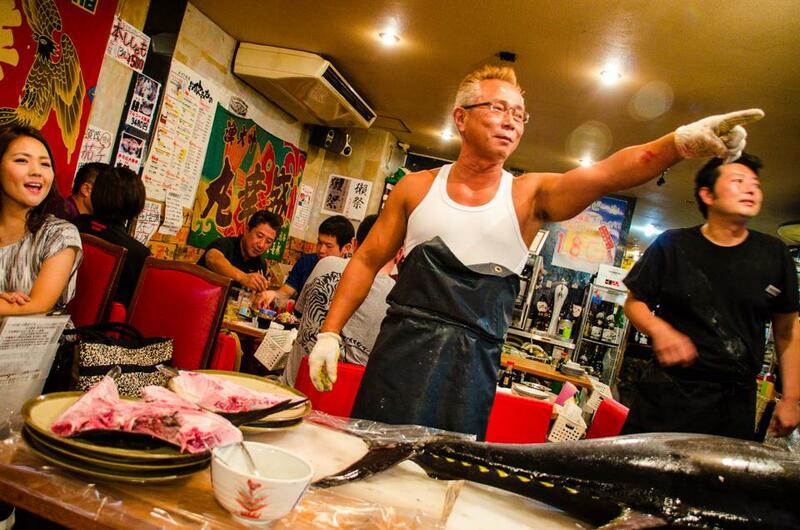 The chef also played up to them and gave them slivers of fresh tuna, which he also did us (as the only token foreigners in the joint). Finally I got in on the action myself. They all squealed when I sat down and posed with them, and I definitely think I was in there (Kate nodded sympathetically when I told her this). 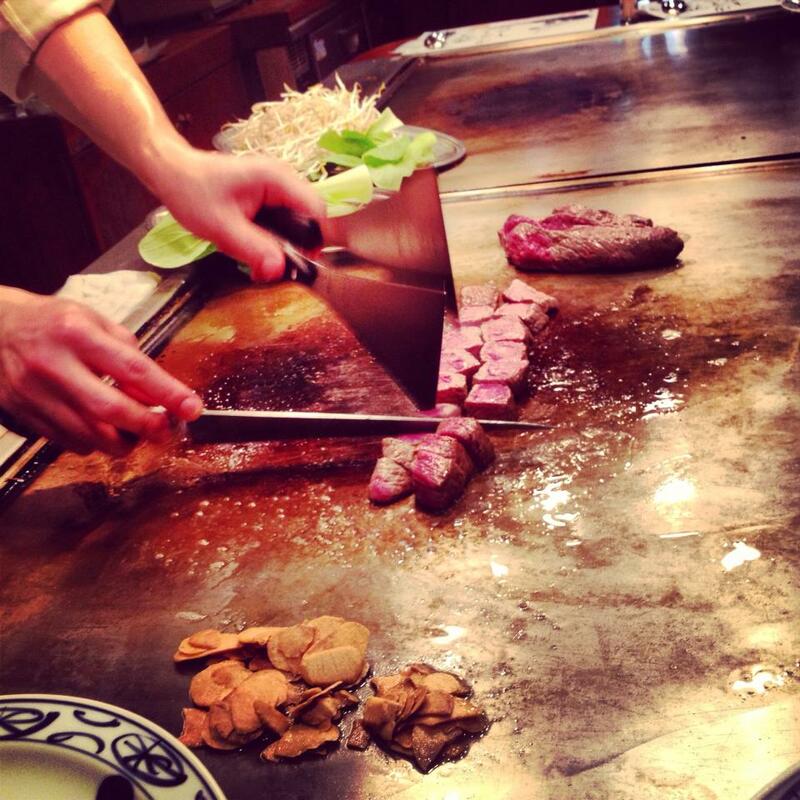 After that we popped off to Kobe, as Kate was insistent that we try the Kobe beef. There didn’t seem to be much else going on in this town, at least in the short time we were there, but we queued for a place which served beef that has since hit top spot on the list of “Best Things I’ve Ever Put In My Mouth”. 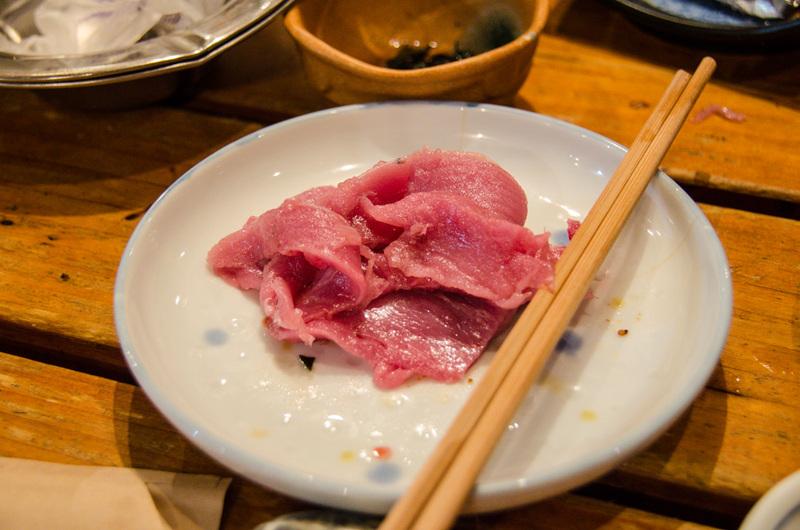 Aside from drooling over this delicious dish, I discovered something interesting about Kobe beef. I’d been told by a number of people that one of the main reasons it is so good is that the cows are fed alcohol, are massaged and are played soothing music. Aside from hearing it on occasion myself, I recently heard this from two travel bloggers, one of which was informed by a Japanese man who was “a serious foodie”, lending it some credibility. But frankly I doubted this theory – if that’s all there was to it, why weren’t farmers in East Anglia employing the same methods? So I looked it up. After about four minutes of searching I found the official Kobe Beef Marketing and Distribution Promotion Association, which oversees the export of Kobe beef around the world. It has a Q&A dispelling all those techniques as pretty much a myth, very rarely executed and certainly insignificant to the quality of their cows’ meat. The real reason for the meat’s legendary quality is actually down to years of careful cross-breeding. Chalk that one up under “if it sounds too good to be true, it probably is”. 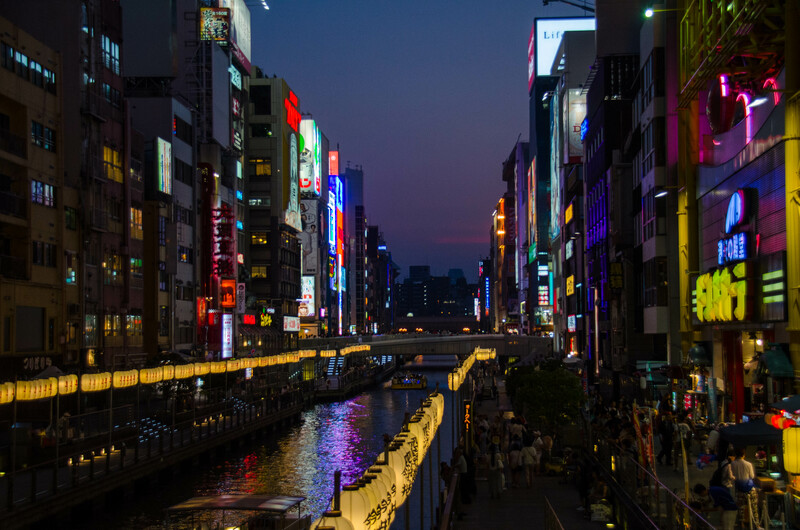 We also went to Osaka, which is incredibly futuristic in its appearance and fascinating to stroll through. 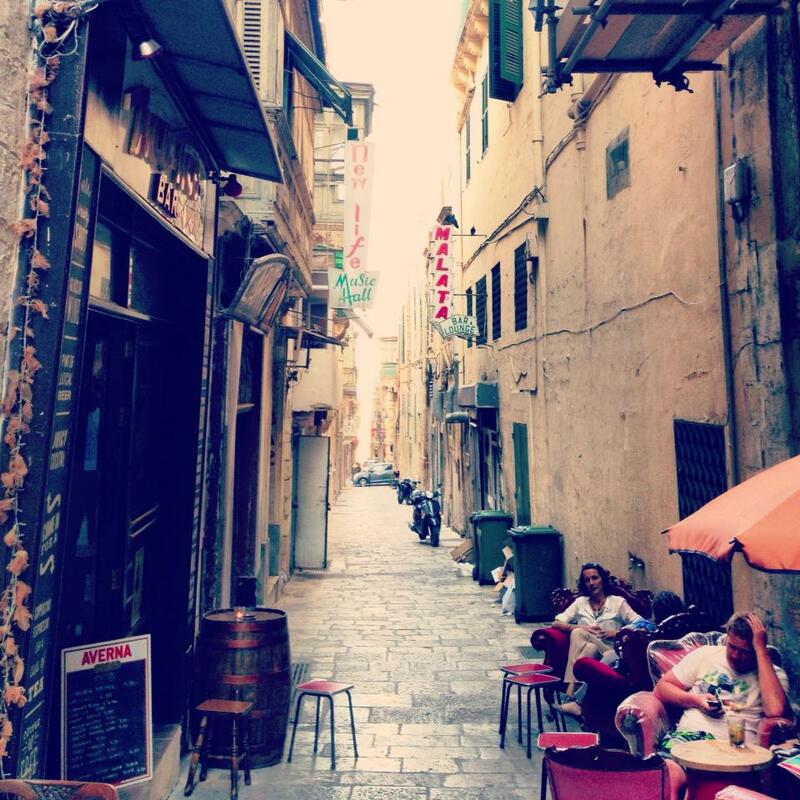 Its streets are a maze that you’ll really want to get lost in. When the sun sets, the neon signs come out to play. 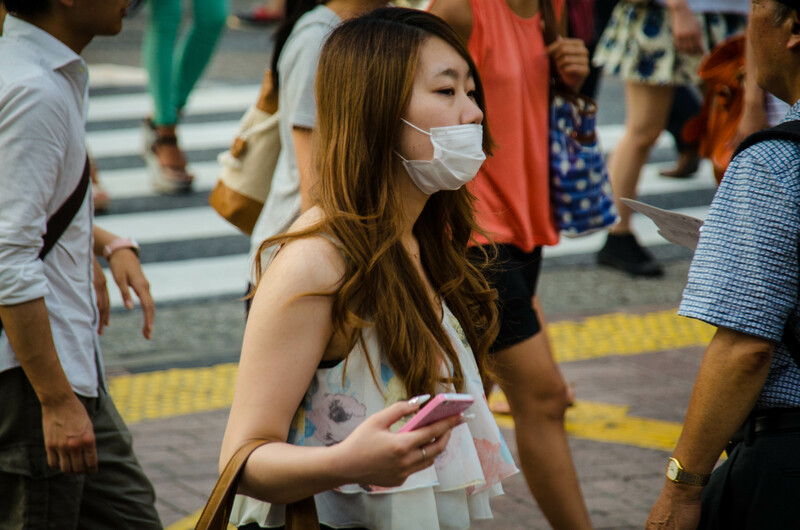 This woman’s expression captures the essence of Osaka. I don’t know what caused her to raise her hand to her mouth, but it might be the light-bulging splendour of the city’s fluorescence. It really does look like a post-apocalyptic metropolis designed by Psy. Speaking of which, I think I found his brother. Afterwards we headed back to Tokyo one more time, until our departure. 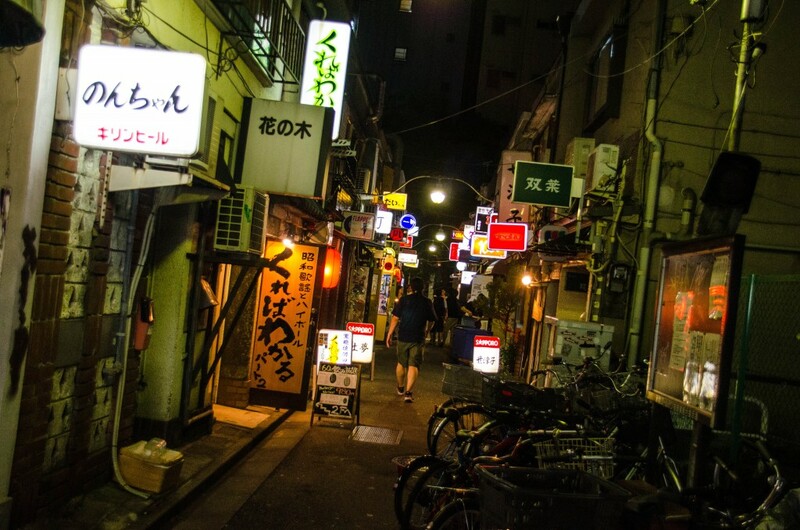 It was during this time that we found my favourite part of Japan – a tiny splodge of narrow streets called Golden Gai, which is home to around 250 tiny bars. And I mean three-to-six seat tiny. 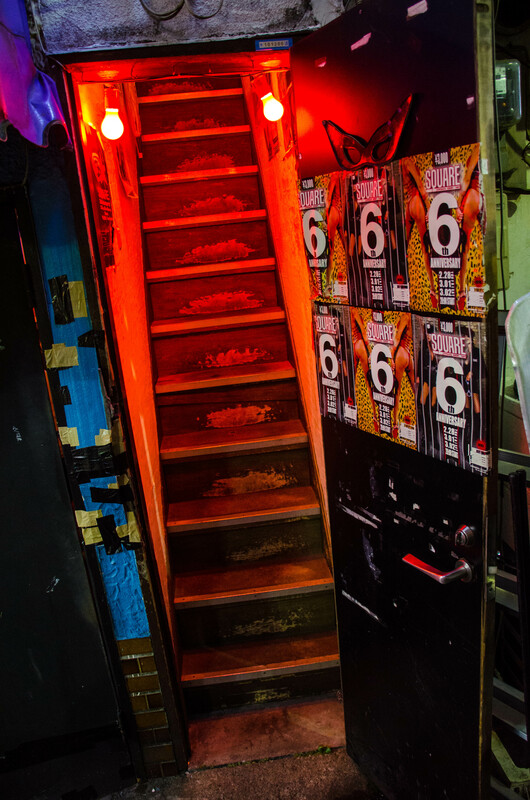 The doorways are like a lucky dip – you really don’t know what you’re going to find out behind each one. There’s a bit of a steep cover charge for most of the places, and some are local joints for local people, but it’s definitely foreigner friendly. We ended up in an American-themed bar run by Captain Ken, who loved Americana. With Kate suddenly the celebrity guest, we toasted America and Shinji Kagawa, the Japanese footballer who plays for Manchester United and is a big star in his home country. 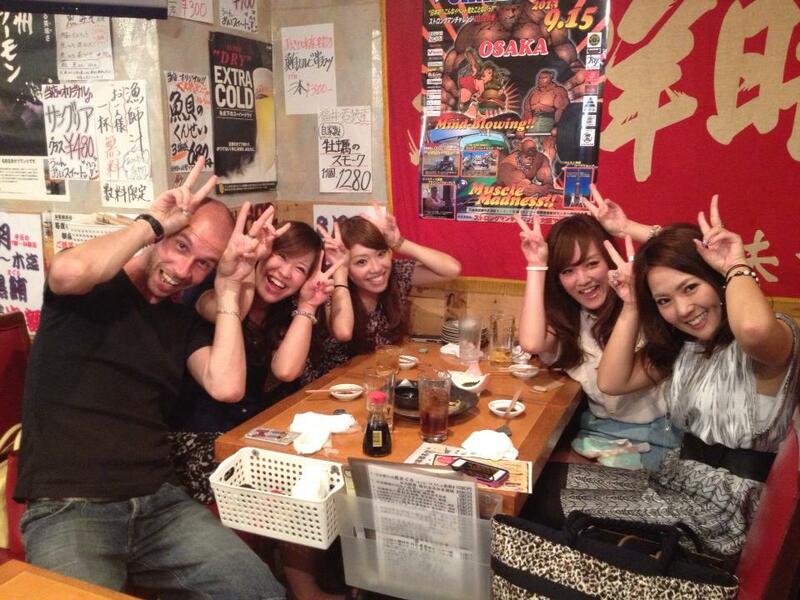 I loved Golden Gai. It’s clean but shabby, chic, cramped, like a work of art that sells booze. So much is crammed into this small labyrinthine spot that you could return again and again and still find something, or someone, new each time. 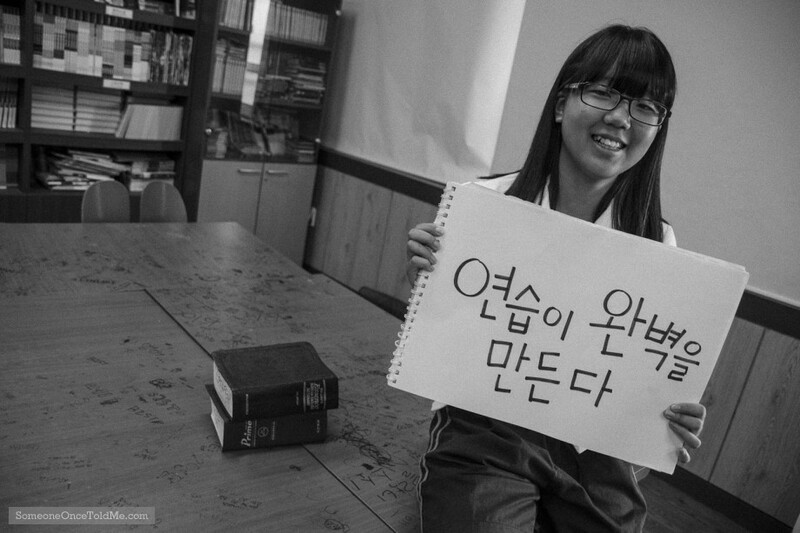 After Japan we went to South Korea, where I had an encounter with some schoolgirls. I don’t mean that in an Operation Yewtree kind of way. Find out more next time. 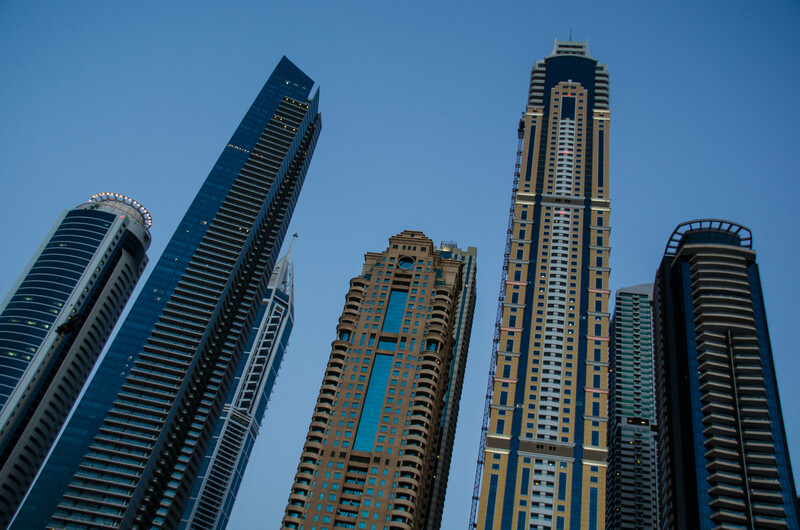 For those of you able to recall The Jetsons cartoon, you’ll already be familiar with what Dubai is like. With tall, gleaming skyscrapers, an occasionally inhospitable outdoors (in the 45 degree heat of summer) and sleek transport tubes gliding silently about the place, it really does look like a futuristic life on Mars. I took the SOTM World Tour there after my excellent friend Simon kindly agreed to put me up in his flat, along with his smashing wife Sarah. They were hugely helpful to Kate and I the whole time, and I even got lovely photos of them both. 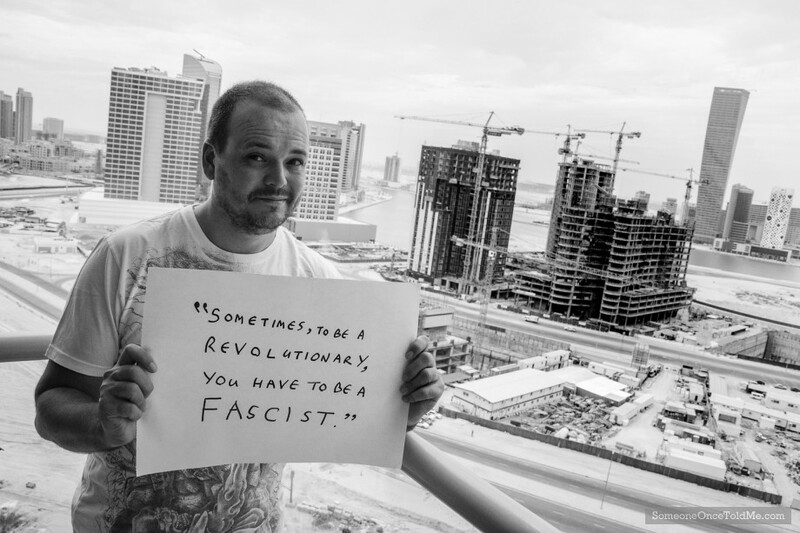 Here’s Simon’s – his audio clip is brilliant, you should have a listen. And Sarah’s story was short but very meaningful and human – nothing less than I expected from her. Due to only being there a few days and having to be indoors most of the time due to the heat, I grabbed a mere handful of shots. I liked this one of a dow driver, even though it was very low light and I took it without a flash while sitting on another, bobbing vessel. So it’s not pin sharp, but the best I could do. 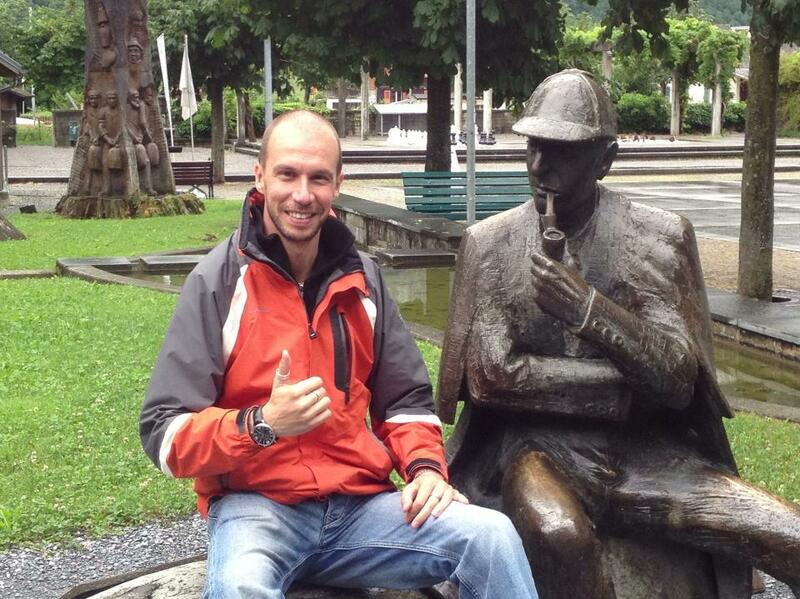 Shortly before going down to the city’s creek, Simon told me there was a Sherlock Holmes pub in a nearby hotel. I’m a huge Sherlock fan so I had to see it for myself. And indeed, there it was, an imitation Olde English Pub, inside a Dubai hotel whose stones did well not to crack in the merciless heat. While in Dubbers, as it’s affectionately known by the local ex-pats, I was approached by Lavanya Narayan who’s an up-and-coming student journalist. She popped round and we had a pleasant chat about SOTM – here’s the piece she wrote afterwards. It was also Kate’s birthday while we were in town, so I treated her to cocktails at a bar high up the shiny behemoth which is the Burj Khalifa. It’s a fantastic experience and a top tip came from Simon – instead of booking tickets to the viewing platform, just book a table for drinks at the restaurant a couple of floors below. It has a two-drink minimum for men but means that for roughly the same price as the viewing level, you can have a leisurely cocktail and see the sights at the highest restaurant in the world. Boom. This was taken on an iPhone in darkness, hence the grain, but it captures the spirit of our experience that night perfectly, and is one of my favourite SOTM World Tour photos. 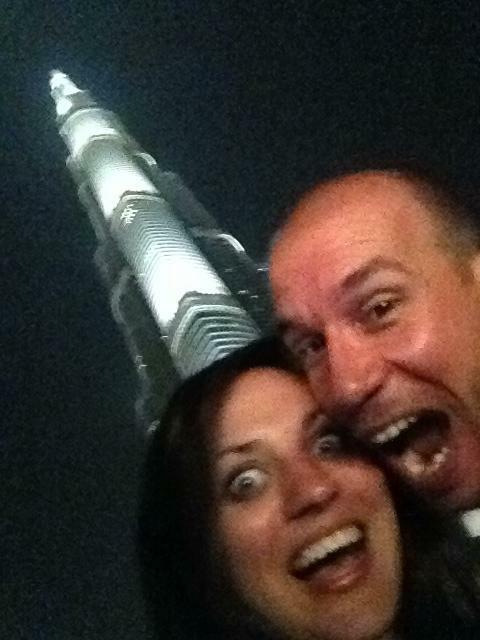 I’m now thinking of making a Burj Khalifa hat for Kate to wear at our wedding. 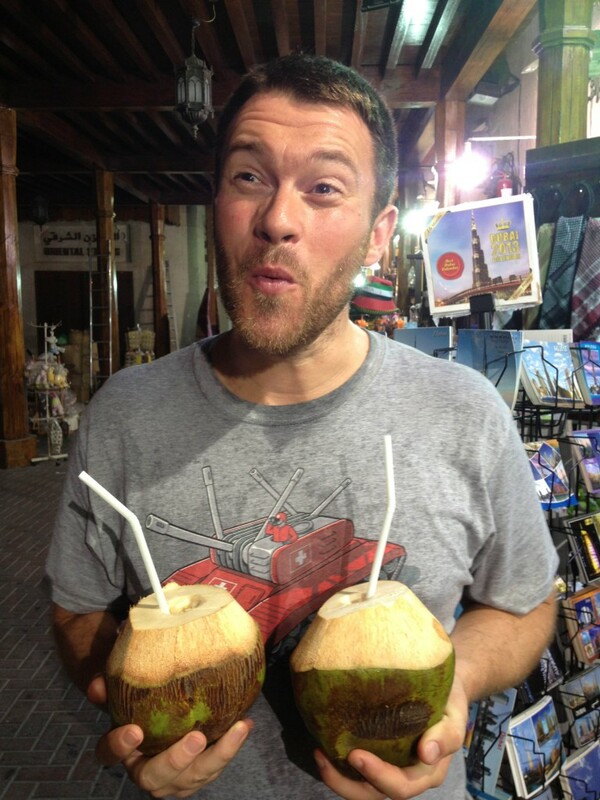 Another one of my favourite photos is this one of Simon, just after I’d asked him to hold my coconut. He’s a top lad, is the Big Man. I also met up with some old friends in Dubai, including my second-ever girlfriend, Emily, who wisely fashioned an escape from me many years ago, and is now happily married to the smashing Tristan. 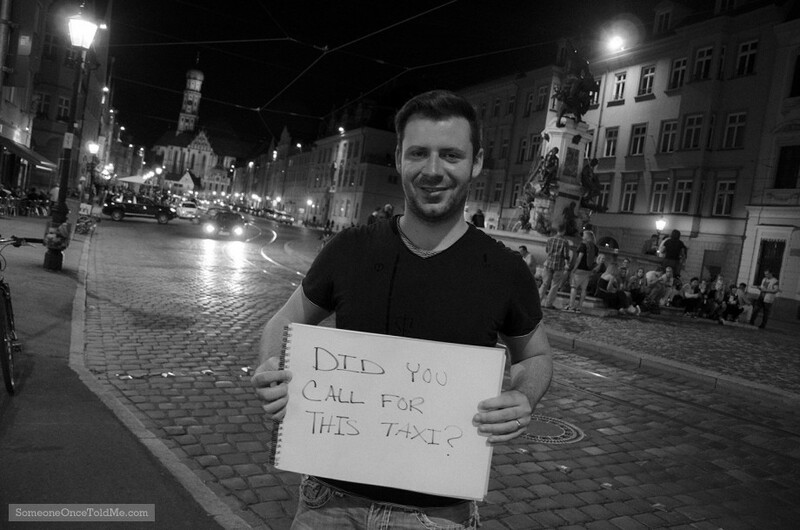 He posed for SOTM and had a great story to tell. Emily kindly took Kate and me out, along with her kids, into the desert, to a hotel where we could cool off with a bit of splooshing in the pool. 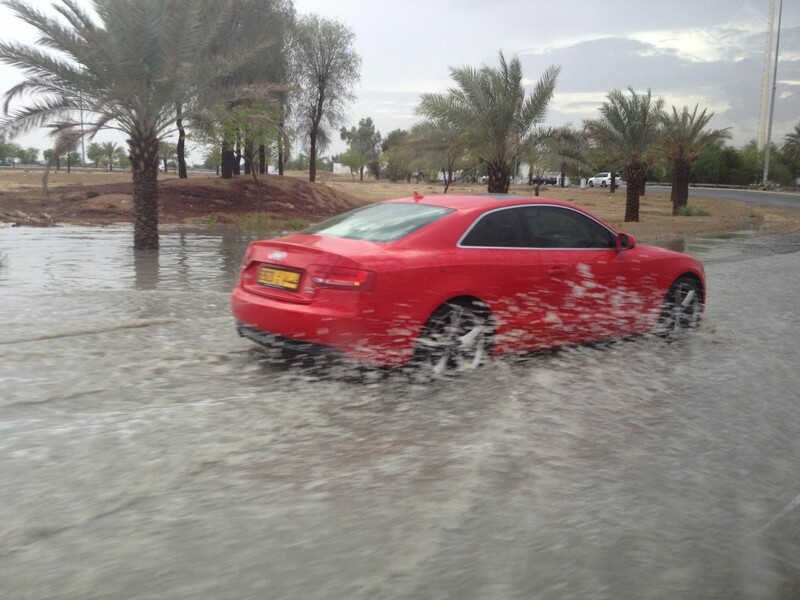 On the way back, we were just behind a couple of patches of heavy rain – very rare in August in Dubai, according to everyone. I snatched this shot as we sped past a roundabout. Emily did say that on the few occasions when it does rain, the driving quality deteriorates as the locals don’t really know how to drive when the roads are wet. 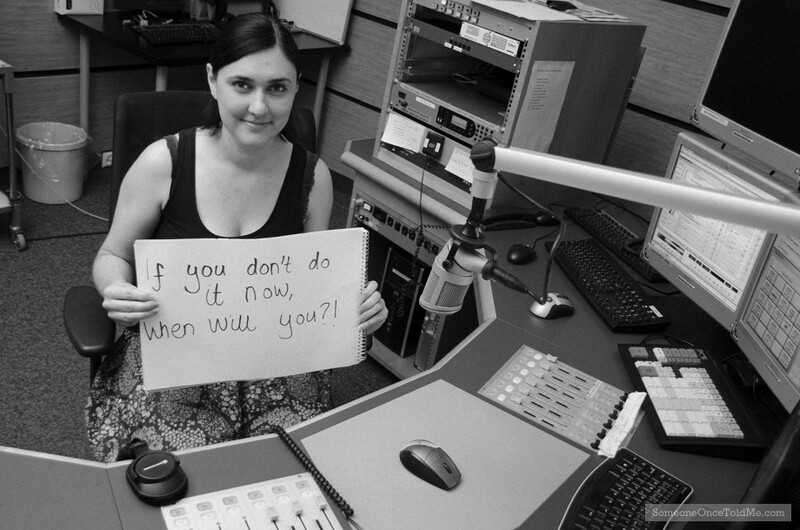 I also took a photo whose story I loved and have adopted as a little mantra of my own. I live on my phone and am often far too engrossed with it, frequently too focused on recording experiences I’m having instead of experiencing them first, before sharing them afterwards. Believe it or not, I’ve just found out that George Clooney has expressed exactly the same sentiments, and if it’s good enough for one of my icons, it’s good enough for me too. So this one really struck a chord with me. When you roll with Adventurous Kate, you often reap the benefits of some very nice experiences. 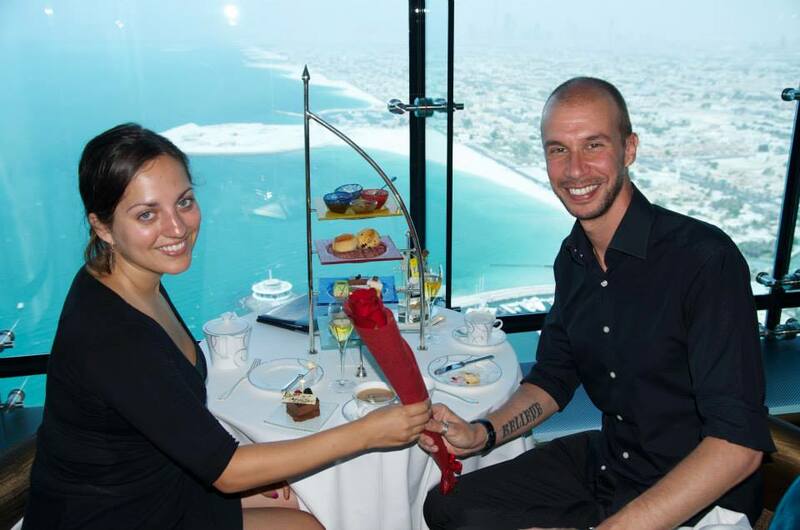 One of them was a fairly sumptuous afternoon tea at the Burj al Arab (the one that looks like a sail). 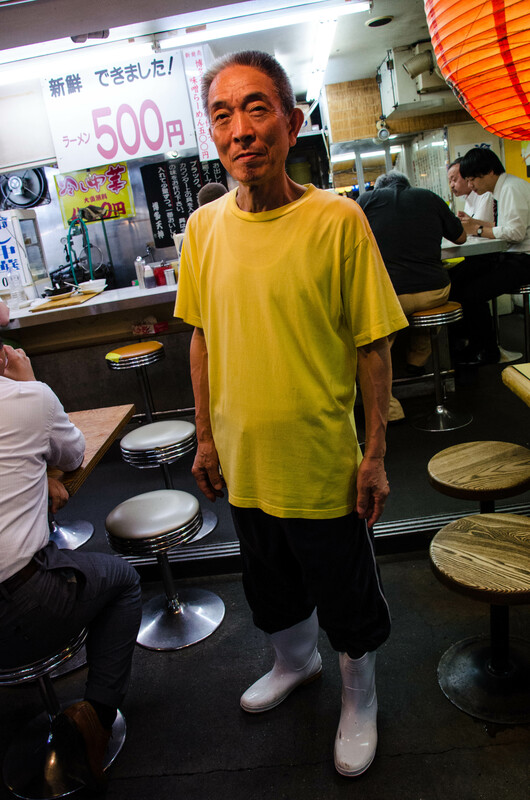 It was actually not prohibitively expensive, considering all the gold the place has plastered everywhere and that it’s a (self proclaimed) seven-star joint. 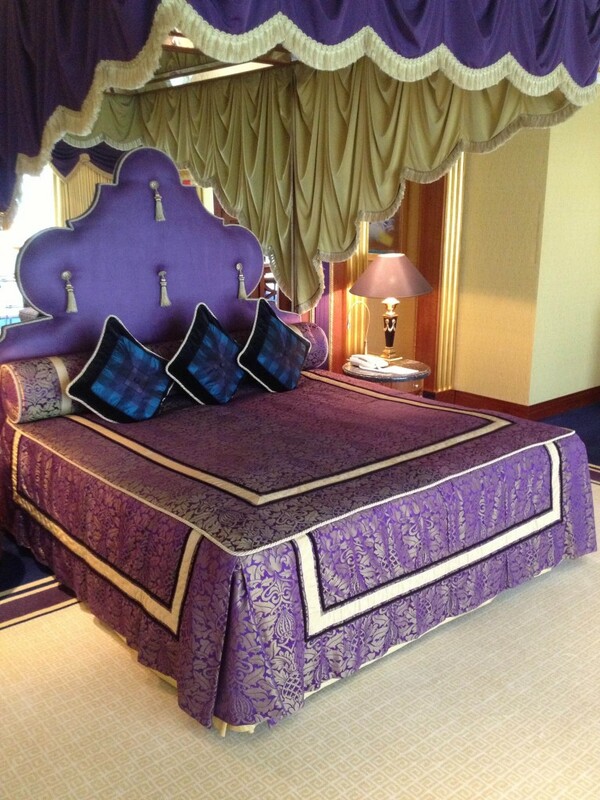 On this occasion Kate was invited to attend by the hotel’s management, and she wrote about our experience on her blog. The teas, which include an unforgettable camel milk creme brûlée, start at 295 dirhams (£50, $80, 60 euros). Here we are with me giving a rose to Kate for her birthday (which was a few days before) and was supplied by the waiters. Thanks boys! Kate doesn’t like this photo of her, but she looks divine as always, of course. And check out that view behind us! 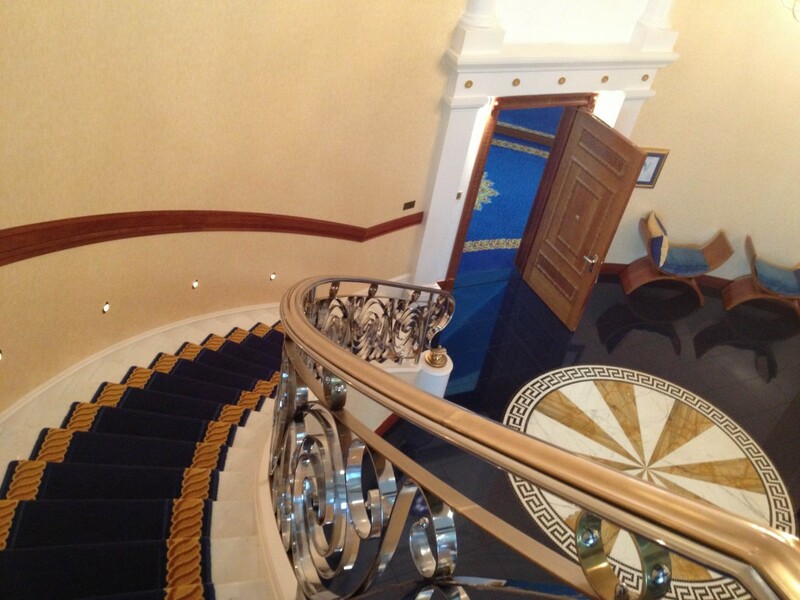 We also got shown round one of the suites, some of which cost £11,791 a night ($18,716, 13,982 euros). We got to see the second-best suite in the joint. I repeat. 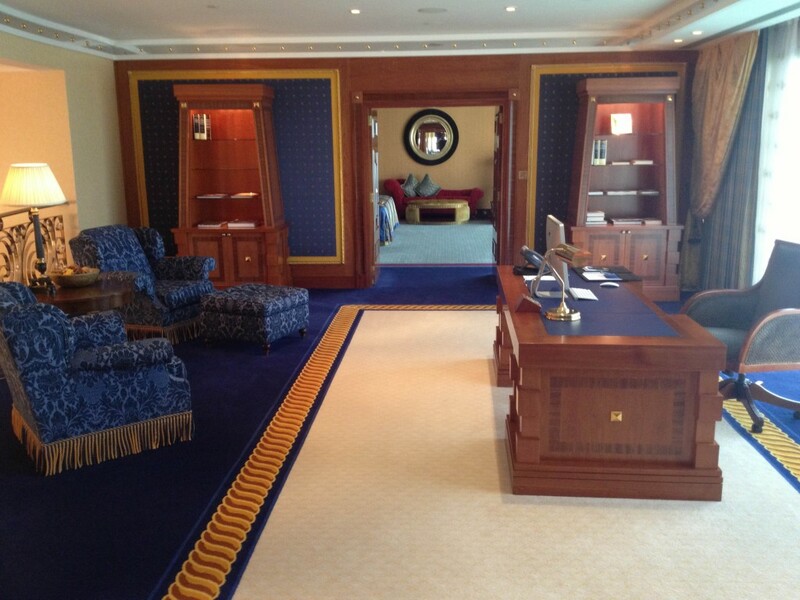 This is the Burj al Arab’s second-best suite. 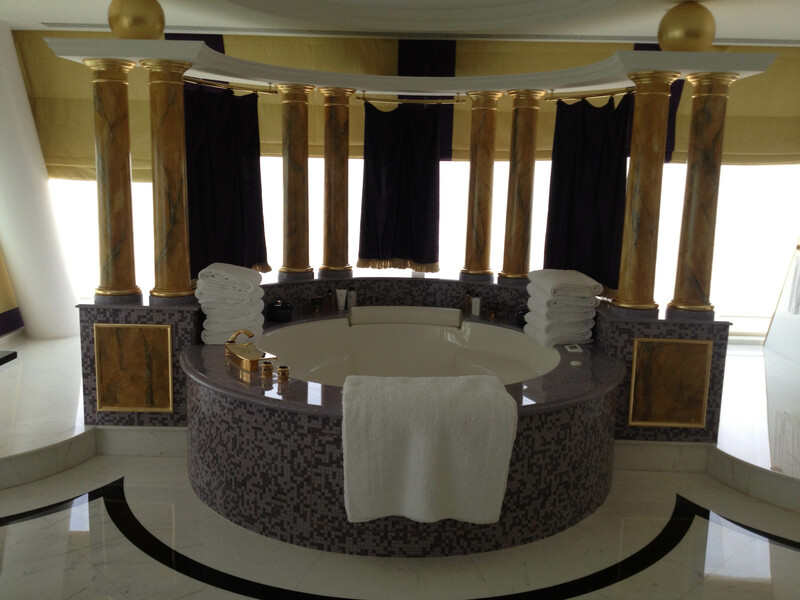 Check out that tub! Plenty of room for the wiggling hotties! If you’re, er, into that sort of thing, of course. Ahem. And I could catch some MAJOR zzzzzs in this dream machine. 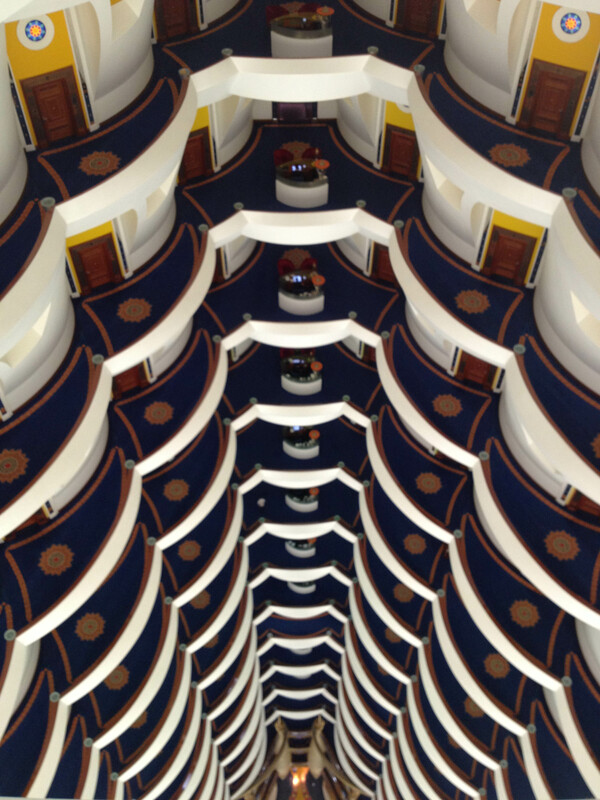 Taking this photo made me rather queasy – I don’t like really high heights, and when you get to the top of the Burj’s many floors, it looks like this (those desks are concierges for each of the floors). It’s an iPhone shot and my hands were probably quivering at the time, so it’s not pin sharp. 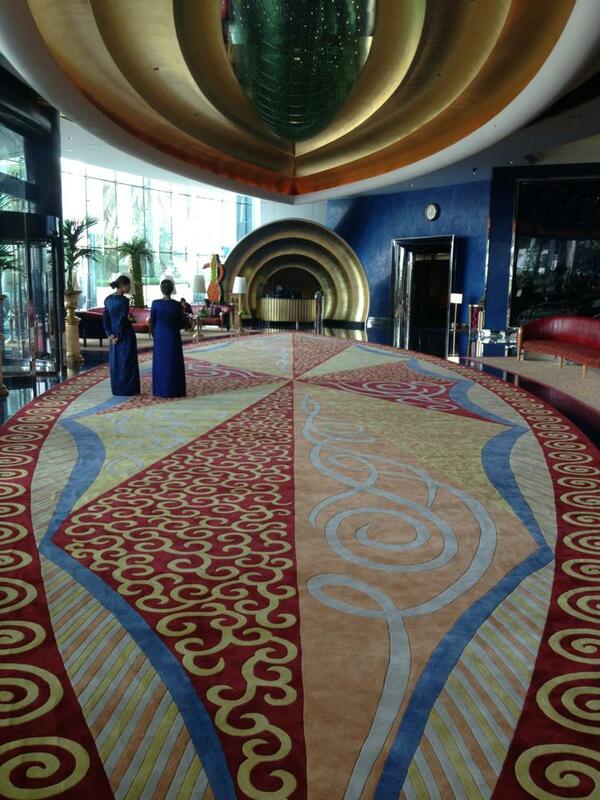 And at the bottom of it all is the absolutely spectacular foyer. 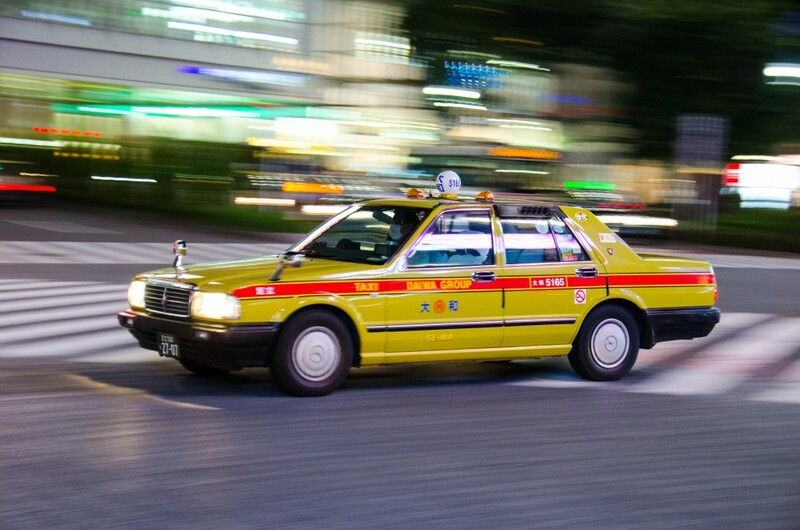 Next time – Japan! A country I was really looking forward to visiting. What would the land of sushi, neon and crazy vending machines have in store, and what SOTM stories would I find? More on all that coming soon. Back in July, I bid farewell to Adventurous Kate and headed down to South Africa for two weeks, to visit my friend Kimberley who once posed for SOTM herself. The country came with a big reputation – it’s Kate’s favourite, and she’s been to 46 nations so far. She can’t stop raving about it, so my expectations were high. My friend Kimbers, as I like to call her, used to live in London but in recent times has moved to Port Elizabeth (PE) to be with her fellow, the excellent Andrew. 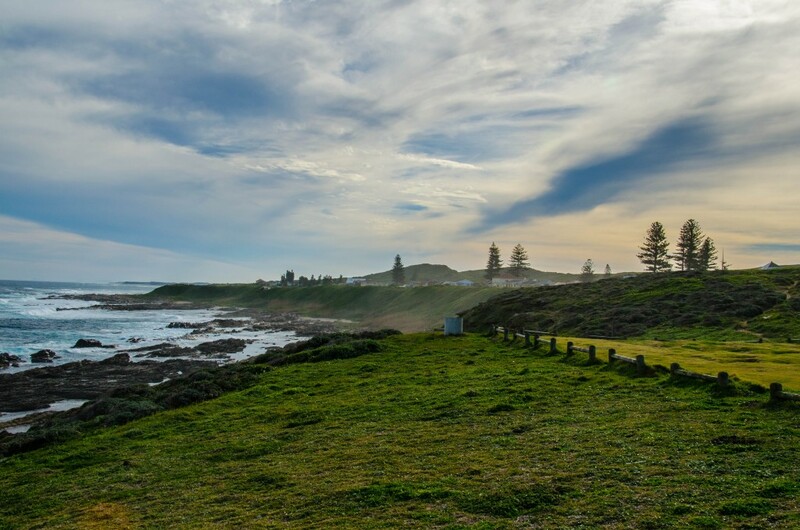 An example of the Port Elizabeth coastline can be seen in the top image. She had very kindly lined up a number of people for me to photograph for SOTM during my stay. These included some people who worked at or attended Nelson Mandela Metropolitan University (NMMU). While there I learned that, as the main campus is on a nature reserve, they frequently have monkeys come and try to snaffle people’s lunches. Hence there are lots of warning signs up about keeping your food out of sight, and advice pinned to the fridge about what to do if you’re confronted by a monkey pilfering your sandwiches. Apparently raising your eyebrows is seen as a sign of aggression by those primates, which is a bit of a shame as it’s just the kind of thing a human does if we come across anything unusual or exciting. 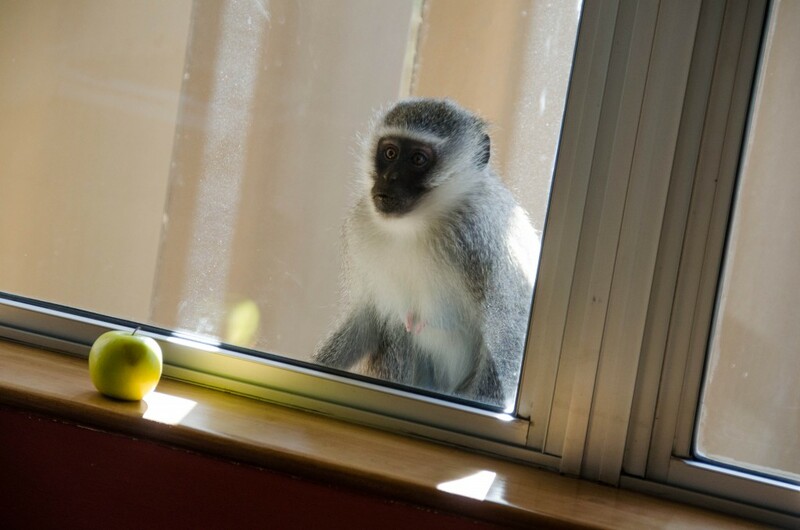 I spotted this monkey looking longingly through an office window at someone’s apple. 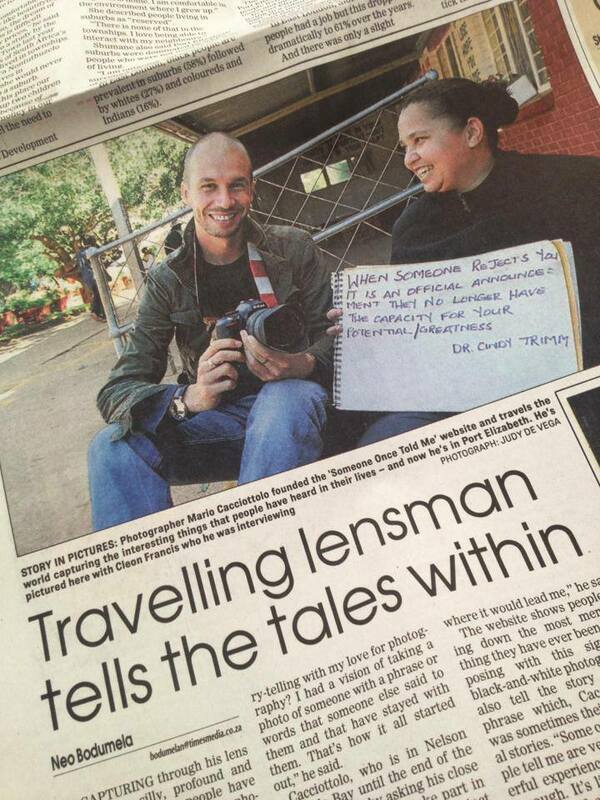 And she even managed to get me in the Weekend Post, an edition of the Port Elizabeth Herald. But without a doubt, the highlight of my trip was visiting Missionvale Care Centre, which feeds, educates and cares for people from the adjoining township. It’s run by the amazing Sister Ethel, an Irish nun who 25 years ago started giving out aid to people while under a tree in the township and running a school beneath it. 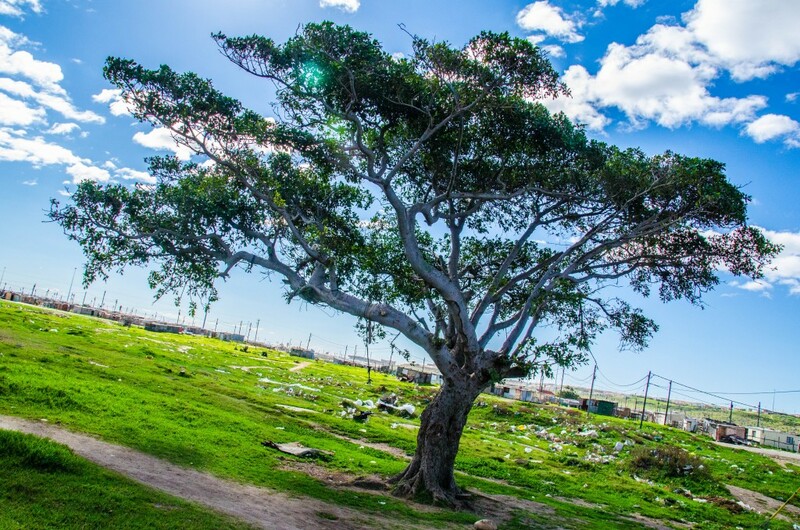 Today there is a bustling complex at the entrance to the township which is home to some 100,000 people, of which about 70% are estimated to have HIV. Brilliantly, the tree where it all began is still there, even though many other trees have been cut down in the area. 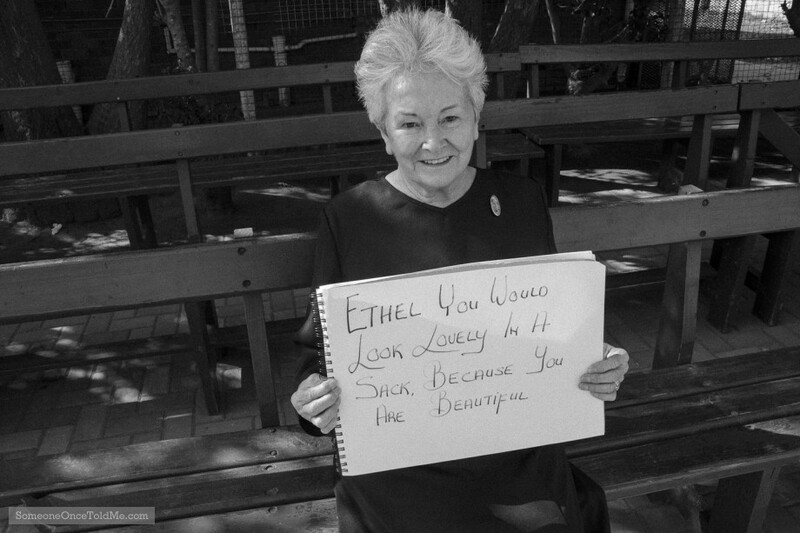 And Sister Ethel is still there too – she posed for SOTM, which I was delighted about. 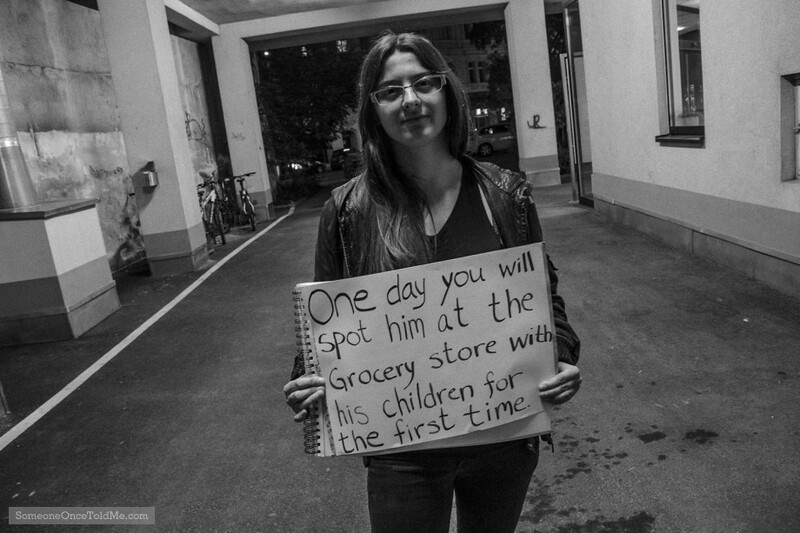 She had a great story to go along with her photo. The landscape of the township was nothing like I’d really seen before. I’d been close to slums in India, but never entered them, and there are many similarities between them and this township, particularly in the flimsiness of the dwellings. This time I got to walk around for quite some time, as the smashing Linda, who oversees much of the daily operations of the care centre, said it would be useful for her to have a new batch of images from the area, to highlight the work that they do with supporters etc. 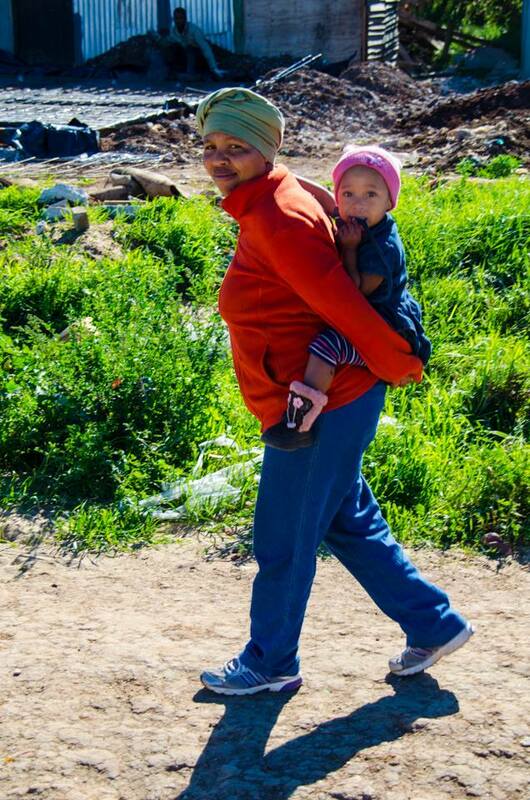 So I went back a second time and photographed the township and its people, giving the images to Linda afterwards. 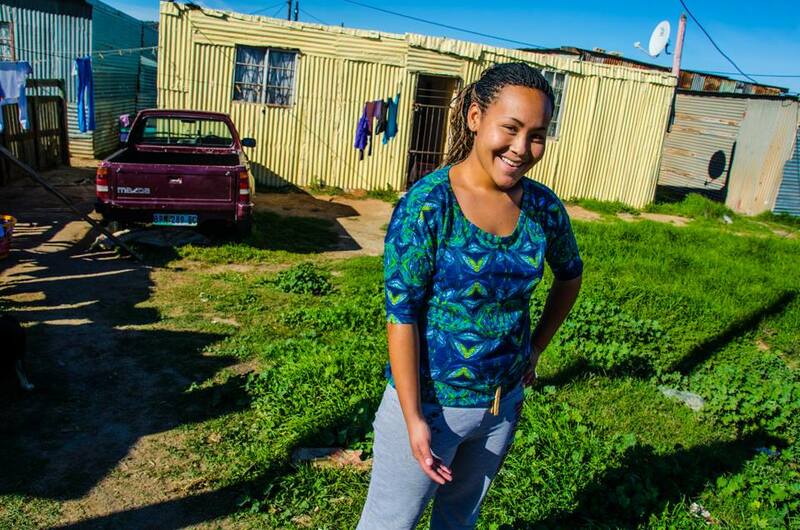 Seeing how poorly the township’s inhabitants live, but how friendly many of them are, was a difficult experience. When it came to the photography, it was a fascinating time and I learned a lot about portraiture out in the field, with harsh sun and people with expressive faces on dark skin, most of who were happy to have their image captured. This lady was shy and had to be softly coaxed to pose for me, but I really wanted to photograph her. She had a wonderful face and I liked the backdrop of her neat and tidy home. Finally, she was all smiles and seemed to like how she turned out. 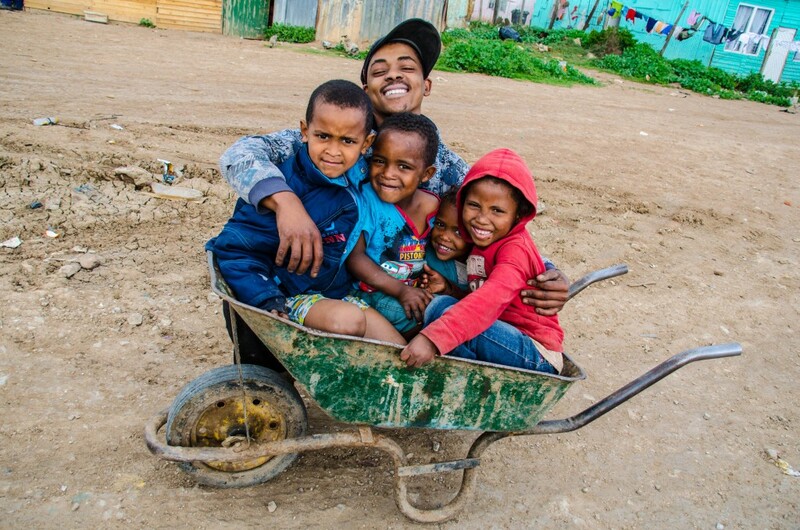 During my first visit to Missionvale we passed these four children playing in a wheelbarrow. I got the car to stop on the dirt road, jumped out and took their photo. The chap in the cap came sauntering over and got in on the act. The terrain of the township is very rich to look at, but incredibly difficult to live in. 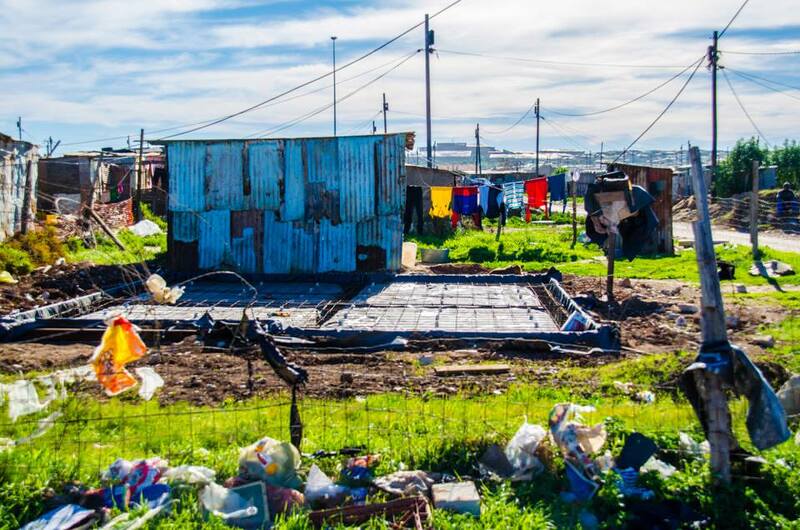 New properties are being built, of much better quality than the existing flimsy homes, and you can see the concrete foundations being laid next to this tin shack, an increasingly common sight in the township. I saw these two, whom I assume are mother and daughter, a little way off and waited while they walked past me. Right at the decisive moment, they both looked my way. This woman was sweet and gentle. 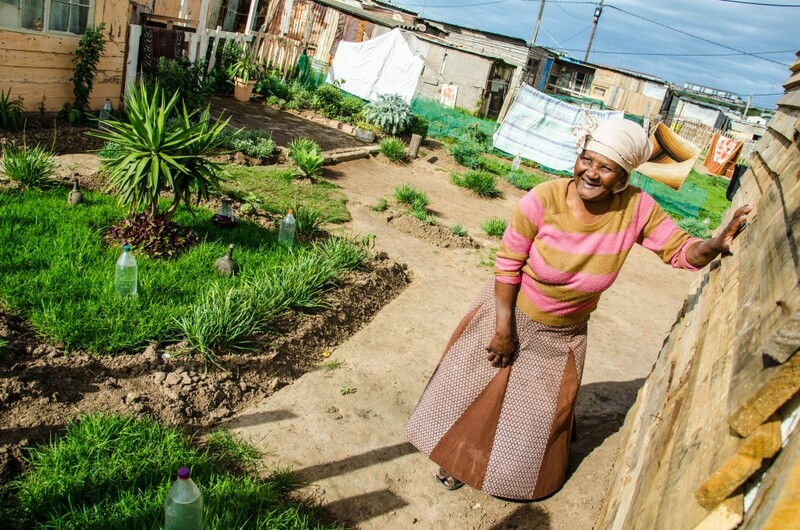 She had a very organised garden and was all smiles as she spoke, probably in Afrikaans. I asked Linda if I could take her photo, and the lady agreed. Afterwards I thanked her, in English, and she said something that sounded like “my pleasure”. This lady is the neighbour of the smiling woman above. 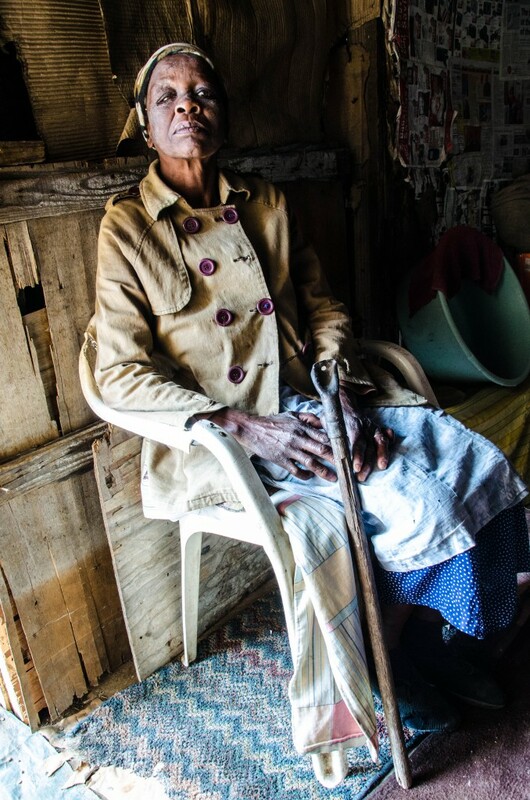 She has HIV and lives along in a leaking shack which also floods, meaning the soil floor becomes a pool of mud. Staff from Missionvale Care Centre have patched things up a bit for her, and given her some possessions as she lost all of hers in a fire. Commonly, some people in townships light fires within their shacks to cook on, and frequently this results in them being burned down. I understand that this lady also lost her husband in the same fire. After experiencing the townships, Kimbers organised a couple of days for me at the luxurious Shamwari Game Reserve, out on the African plains, which turned out to be a quite memorable experience, not least for the contrast between the five-star luxury I was sleeping in, and the townships that I couldn’t get out of my head. 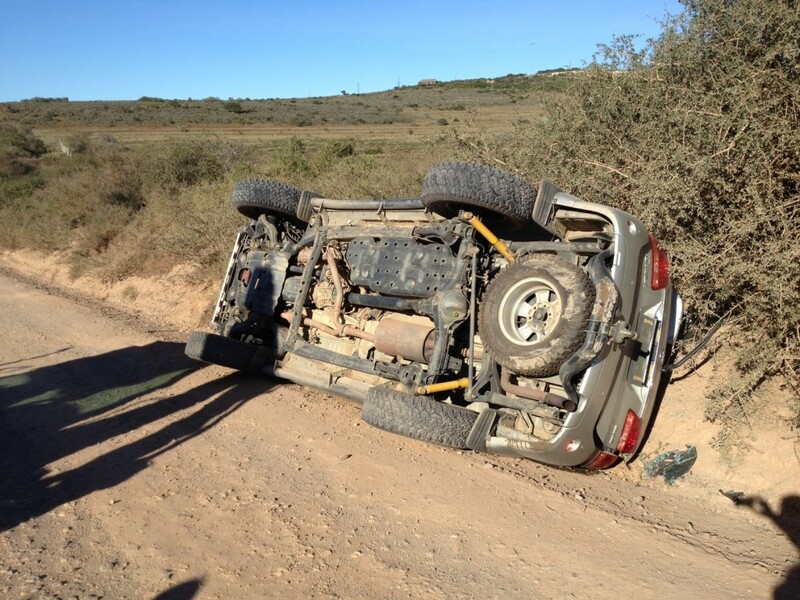 First of all – I was in a car crash on the way to Shamwari, just five minutes away from the entrance. My driver and I ended up backwards and on our side in a ditch. Luckily, apart from a few bumps and bruises, we weren’t hurt. This is the first photo I’ve published of the crash – you can see the car sadly didn’t make it out of the ditch in quite the same shape as when it went in. We were heading in the opposite direction to how the car is facing here, meaning my passenger door, now on the top, was the only way out. I got my camera and computer out of the wreckage before I left, though. I know the value of things. 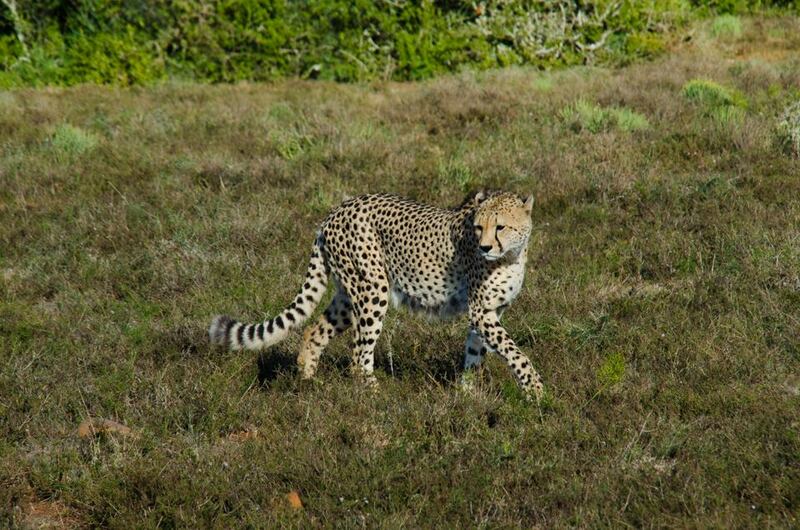 Shamwari is an incredible place and being on safari there is one of the best things I’ve ever done. I can’t recommend it enough, and I was lucky enough to have the brilliant Julius as my guide for a couple of days. 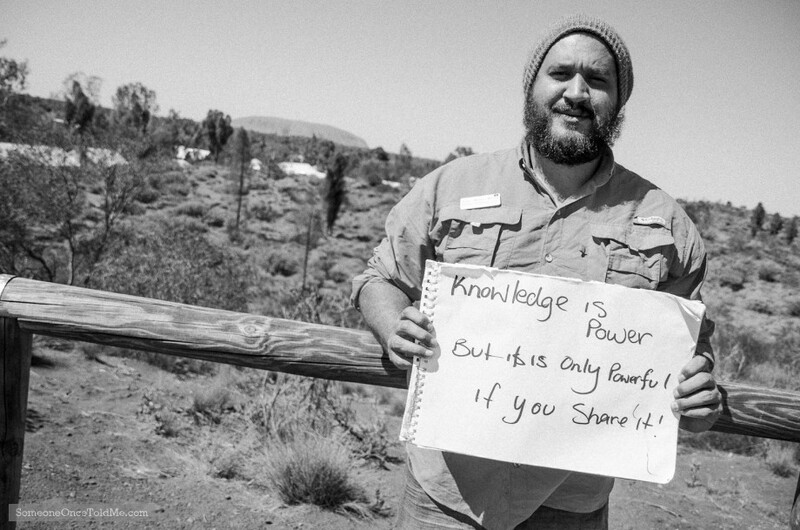 He is a fount of knowledge, once took out Margaret Thatcher and her family on safari, and has eyes as sharp as an eagle who’s just opened an opticians. “See that flash of grey on the other side of the valley?” he’d say. “Yeah, that’s a rhino,” Julius would say, shifting about excitedly in his seat. We’d bounce around over the African plain for a bit, and lo and behold, there would be a rhino, an animal as short-sighted as I am (quite literally, I wear strong contact lenses). 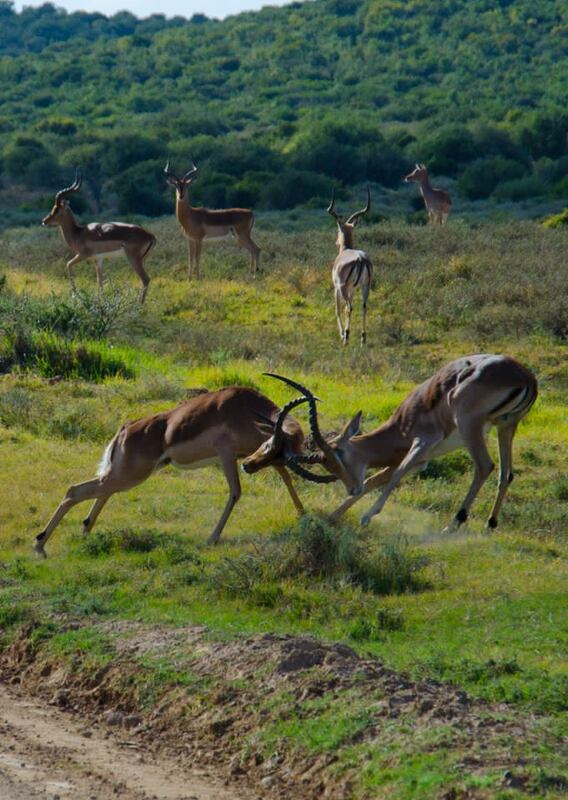 And here are some of my favourite shots from Shamwari. 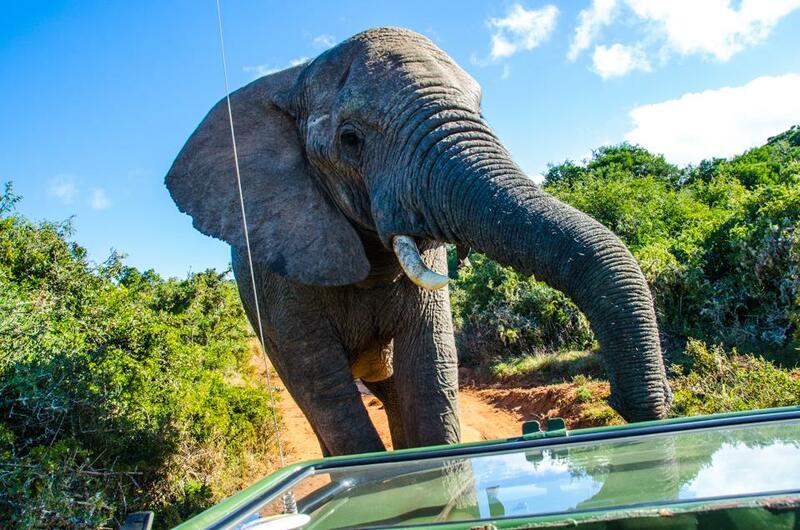 First, getting up close and personal with a young male elephant. 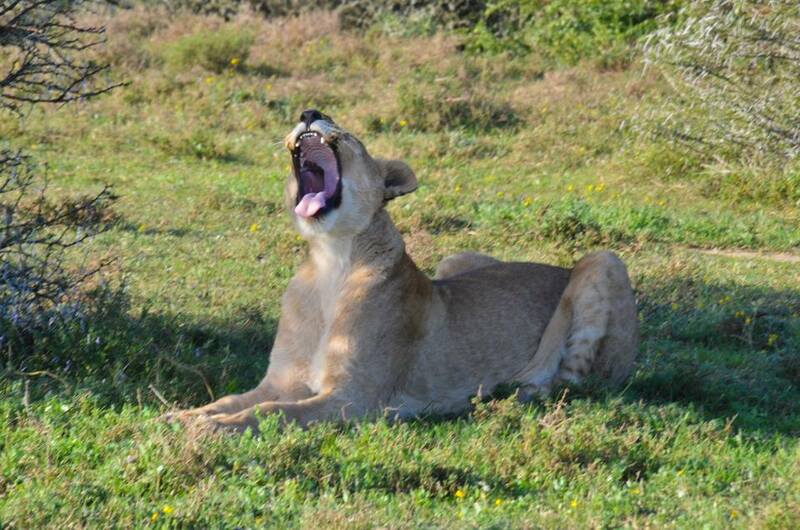 When lions yawn it means they’re ready to start running about, eating things. This made me a bit nervous. 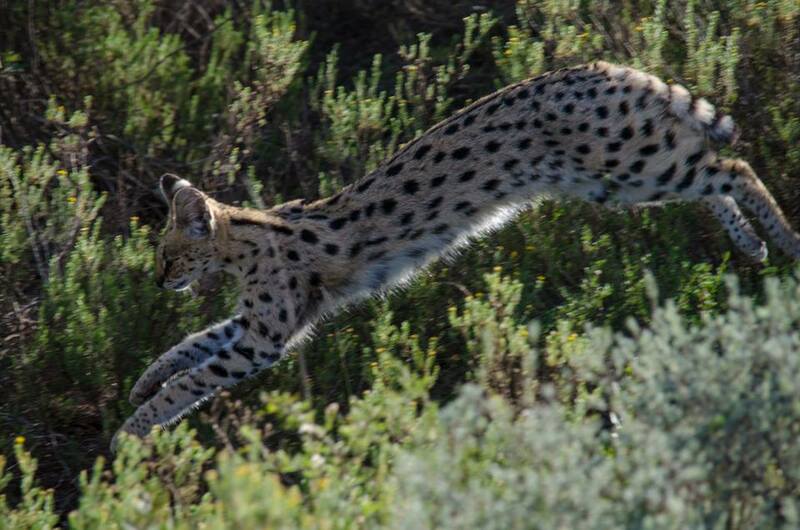 This is a Serval, and capturing him in mid-flight is the best action shot I’ve ever done. Cheetahs. Fast on paper. Much slower in real life (most of the time). 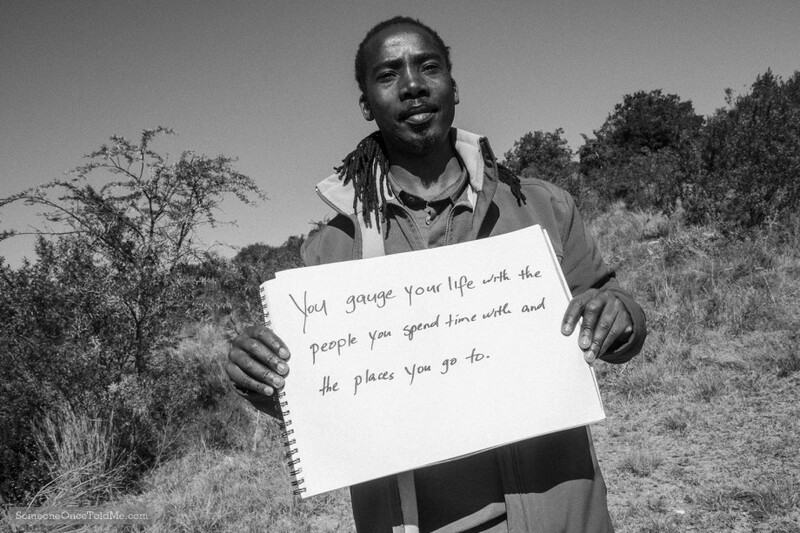 I’ll never forget my time at Shamwari, or in South Africa. I can’t wait to go back. 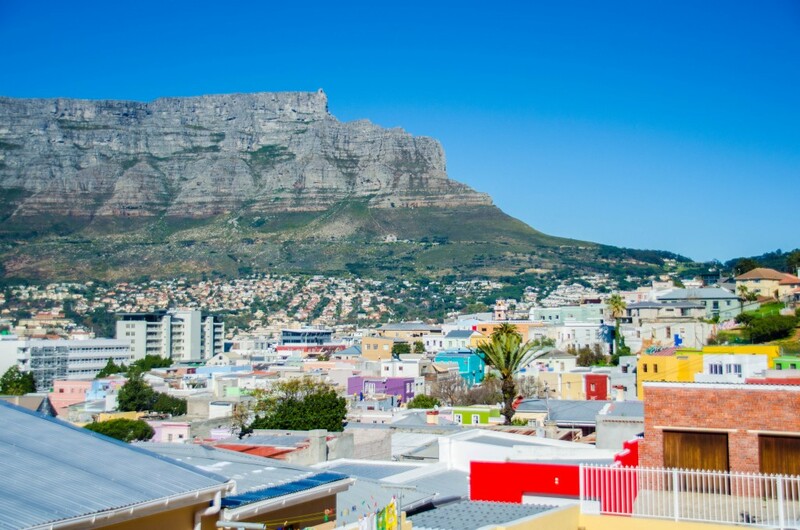 After my time in PE I moved on to Cape Town for three days, and loved that place too. I was a guest of Cape Town Tourism who kindly put me up in a nice hotel and organised some activities for me also. The hotel was on the 27th floor, which afforded me some super views of this utterly charming city. Most of the photos I took up there were done while I was naked, incidentally. I just seemed to keep catching the light pre or post-shower. I didn’t take any selfies while doing that, you’ll be relieved to hear. 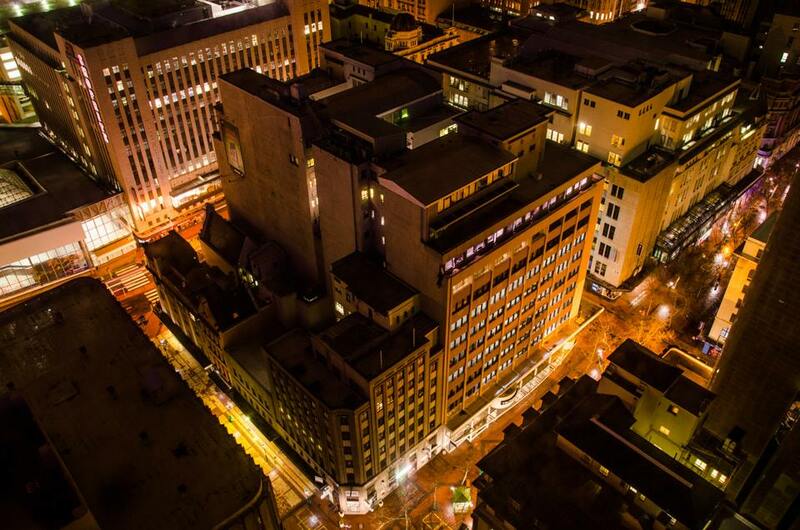 The buildings in Cape Town definitely have character, especially when you can look down on them. 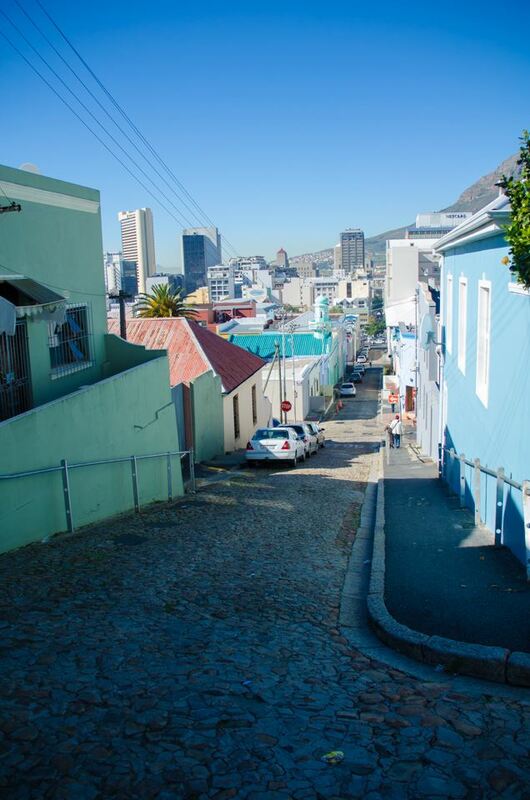 At the top of Cape Town is the unmissable Bo-Kaap district, which is fantastic to walk around with a camera on a sunny day. Once a township, the area is now highly desirable as a place to live. 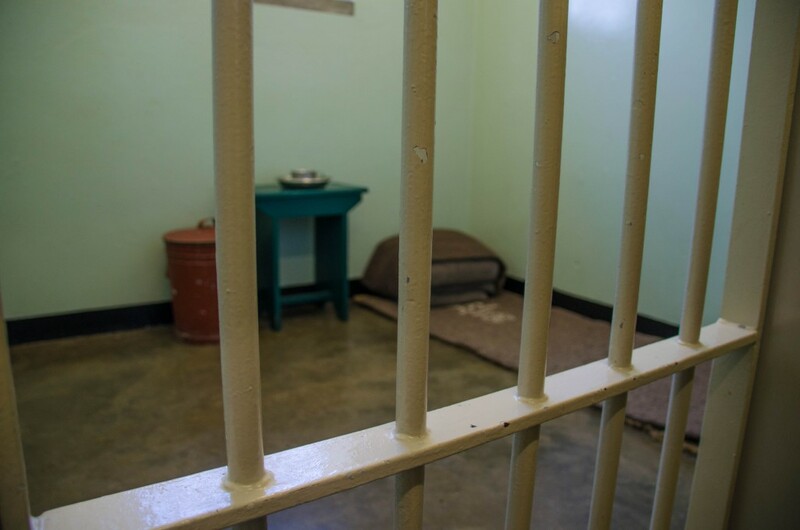 Finally, Cape Town Tourism got me over to Robben Island, where Nelson Mandela spent 18 years in this cell. Seeing it was another of the most memorable things I’ve ever done, and even the jabbering tourists, who were running around Robben Island prison like it was a theme park, thankfully fell silent as they filed past it. That’s it for this post. From South Africa I headed up to Dubai, just in time to catch up with old friends and be reunited with Adventurous Kate for her birthday. More on that next time. Valletta was once described by Benjamin Disraeli, one of the United Kingdom’s 19th Century prime ministers, as “a city of palaces, built by gentlemen, for gentlemen”. Despite this lofty acclamation, I was still allowed to attend school there for several years. I’ve always loved Valletta. 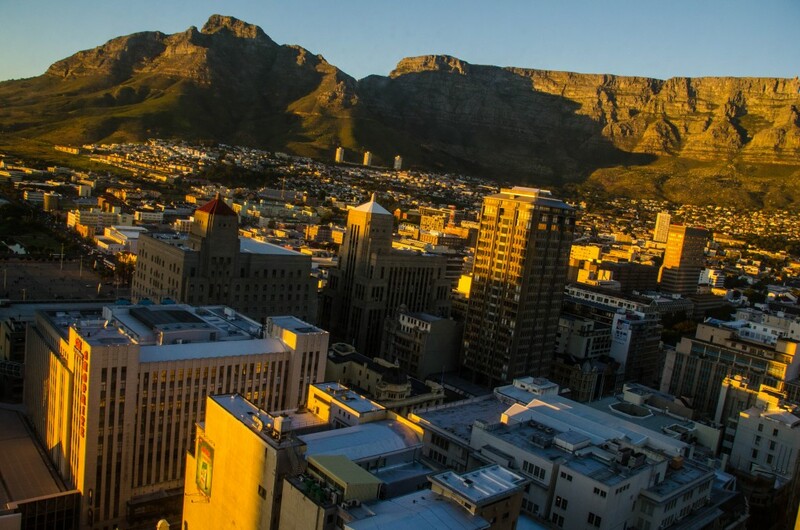 It’s the most remarkable capital city on the planet and a Unesco World Heritage site to boot. It has the quiet, secretive feel of a hidden jewel, and yet by day is the bustling headquarters for an entire, if tiny, nation. Its sandstone, beautifully shabby streets beg you to wander about them and their grid system, which New York mirrors, ensures you can’t ever get lost for long. 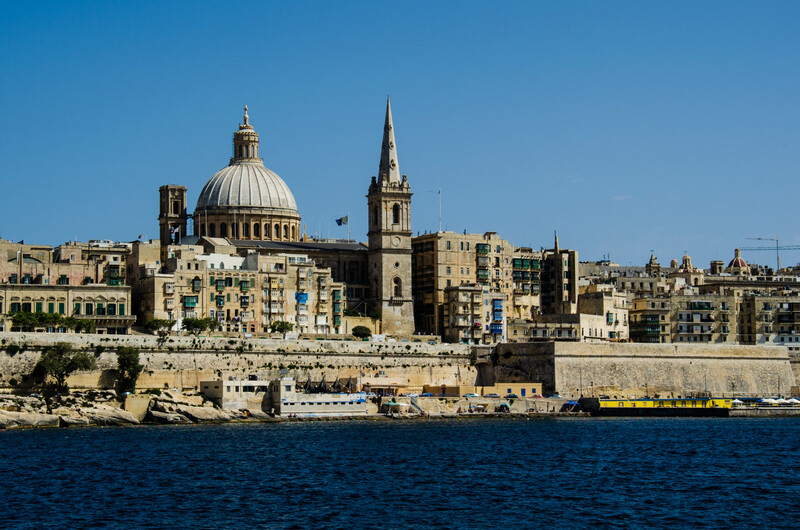 Yet losing your bearings and finding a church with St Paul’s forearm within, or the bar where Oliver Reed died, or a war museum containing the wreckage of Nazi war machines, is all part of the experience of Valletta. It was with great pride that I showed Adventurous Kate the city that I feel so close to. 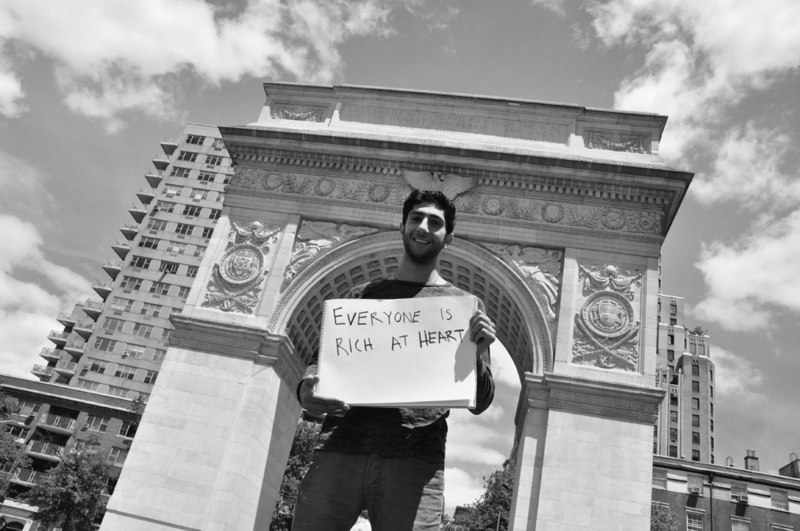 I have my own strong connections to the place as I began my school education here, and my own grandmother (who I met briefly as an infant and was apparently very keen on me) came from the city. Happily, Kate fell under Valletta’s spell as well, and we spent some hours snapping happily in its magical, narrow streets. 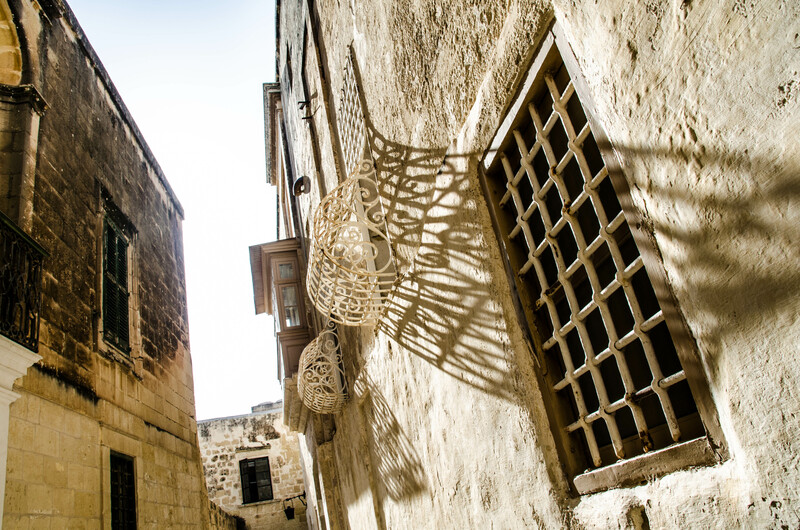 Speaking of which, we also checked out Mdina, another incredible location within Malta’s shores. It too has the same combination of charm and history, yet is no longer the brains of the island as it was in medieval times. Still, the Silent City, as it’s now known, is a photographer’s dream and we both enjoyed finding points of focus for our cameras there too.of focus for our cameras. While in Malta I managed to get the SOTM story from Mel Hart, who had a very powerful tale to tell about her grandmother having a rare moment of lucidity from her Alzheimer’s. Mel was shy about having her photo taken, but I was really pleased with the result and how important her story is. Click her image to discover it for yourself, and the meaning of her grandmother’s phrase. 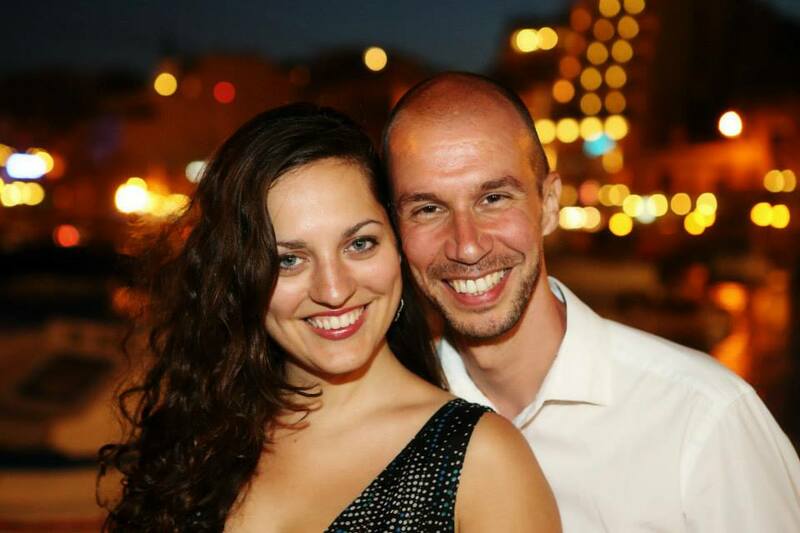 And it was while we were in Malta that Kate agreed to take me as her husband. We had a wonderful day looking around Valletta, and then a brisk time getting ready (I kept insisting that Kate dress up well and make her hair look nice) for a dinner at my favourite restaurant in the world, Peppino’s in St Julian’s. It used to be a house, has been frequented by such stars as Brad Pitt, Stephen Fry, Madonna and Orlando Bloom, and has a tiny balcony with one table on it. This is where I wanted to pop the question. Kate wrote about the whole evening beautifully, and I’ll leave her to tell the story of those life-affirming events. We like to think of ourselves as a slightly unconventional couple – we discussed marriage on our first date, among other things – and perhaps our love of the unusual, in society and our personal lives, that’s why we get on so well. Plus there’s our unquenchable thirst for travel, which we both accept as being important to the very fabric of our personalities. What’s certain is that we’re crazy about each other and like to have fun exploring the world. Long may that continue. As a surprise, I hired Domenic Aquilina, one of Malta’s finest sports photographers who has worked at every one of the Champions League football finals in recent years (which naturally impressed me greatly). A fine chap, Domenic and we had quite some fun taking our photos immediately after our engagement (my urging Kate to make sure she was spruced up paid off – I knew she’d be mortified if she wasn’t at her best for these photos). My Uncle Freddie kindly footed the bill for Domenic’s services, after being told about my plans to hire a photographer via my cousin Adriana. So, blissfully affianced, Kate and I headed for Istanbul. It was my first visit to that city. We’d originally planned to visit Cairo but the political troubles there brought about a change in our plans. However, there were controversial politics afoot in Istanbul also, although not as widespread as events in Egypt. Still, one night we were stood in Taksim Square, the focal point for many protests, when police ran after a group of whistling and jeering men. I immediately slid my camera bag off my shoulders, something I’ve done many hundreds of times before. As I did so, one of the straps got caught on my watch, the first time this had ever happened, meaning that the whole thing slipped from my grasp and thudded to the floor. I saw it fall and felt a flicker of concern. But, I reasoned, the bag was padded and it hadn’t dropped very far. To my cold-blooded terror, I found that the impact, although not great, had jammed my camera’s shutter. With a heavy heart and worrying about the impact the stone floor might eventually have on my tight budget and schedule, we returned to our room for a closer inspection of my Nikon D5100. Happily, all those years of watching the A Team were clearly of benefit, as I managed to use the nail file part of a set of nail clippers to gently pry the shutter back into its rightful position, and it’s been spot on since then. Phew. I’ve also rethought my camera bag de-mounting technique as a consequence of this narrow squeak. Breathing the seagull-filled air with the lungs of a relieved man, I found myself utterly enchanted by the Bosphorus, and spent many a happy hour strolling along its mighty banks. I loved the giant hulks bobbing freely on its silken waters. 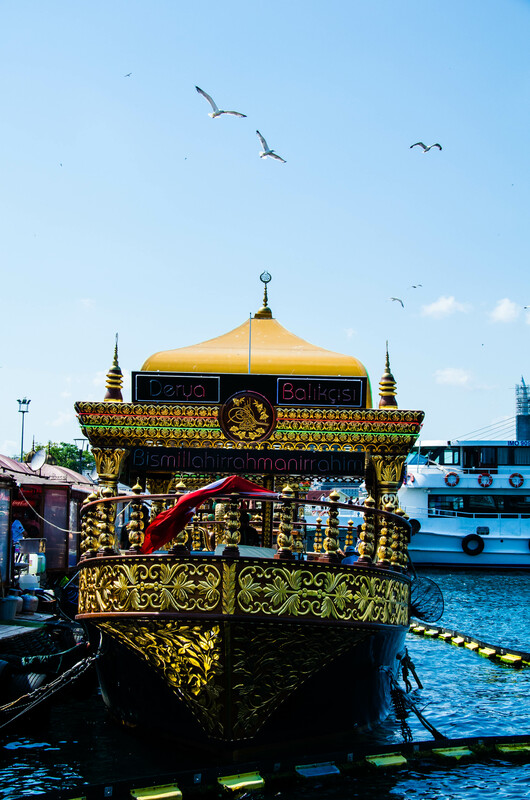 Many were ferries which slid around its surface, carrying passengers and cars and cargo, leaving white trails like snails, while the seagulls floated around effortlessly, as their ancestors have done in this very spot for centuries. 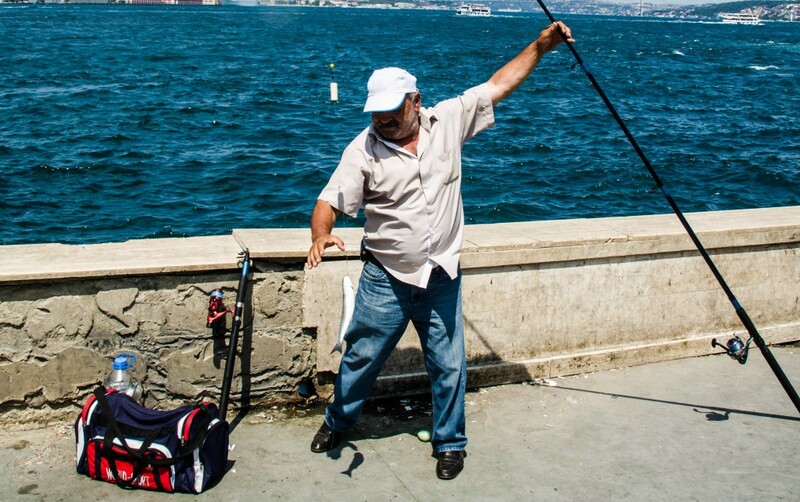 Flocking to the banks of the Bosphorus, disciples to this watery place, are many men armed with an array of coloured fishing rods. It only took a few moments of patient observance from us passers-by before a flurry of activity began. 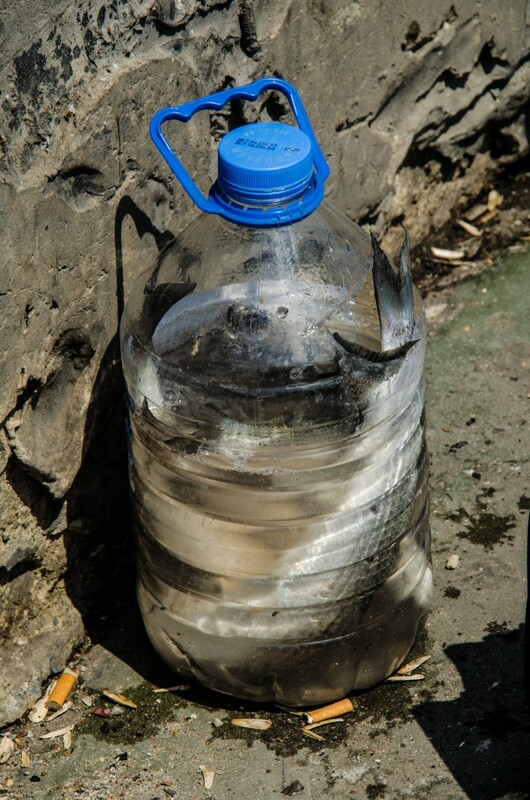 A snap of a wrist, a bending of a rod and a flash of silver announces the deadly hook lifting a fish from its home, to be plunged head first into a plastic bottle of water. I’m not a fisherman so I don’t know why the bottles had water in them – perhaps an attempt to keep the fish fresher until they get laid out on a grill somewhere. Speaking of which, it was these very fish that are used in the sandwiches bought from overly-golden boats moored permanently to the quayside. You get a fillet of fish and fresh salad in a baguette, all providing a tasty concoction for some £2. Yes, £2. Boom. Finally, here’s two of my favourite SOTMs from Istanbul. Sean shared a powerful tale of some of his father’s last words, which are an interesting reflection on the mundane nature of life, yet its brittle brilliance at the same time. 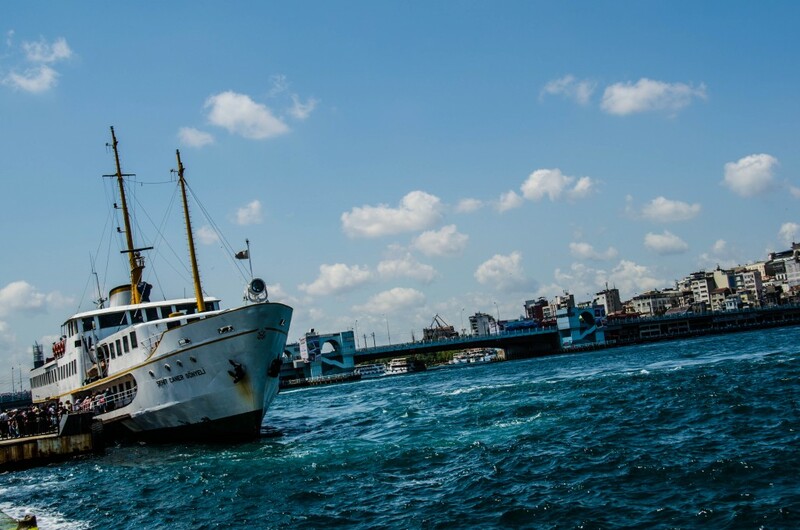 And Atakan revealed the story of what happened when he left his Turkish town to come to the sprawling metropolis of Istanbul, much to his father’s concern. 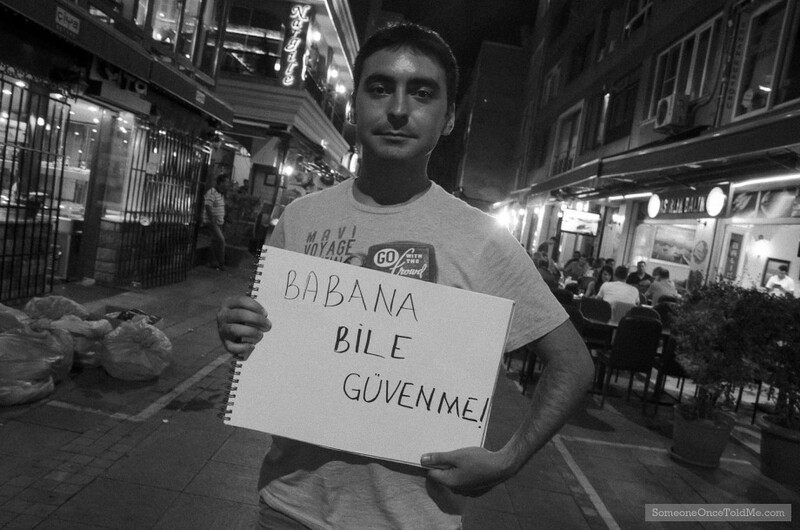 I liked this one as it tells you something of the nature of the relationship between Turkish men and their sons. 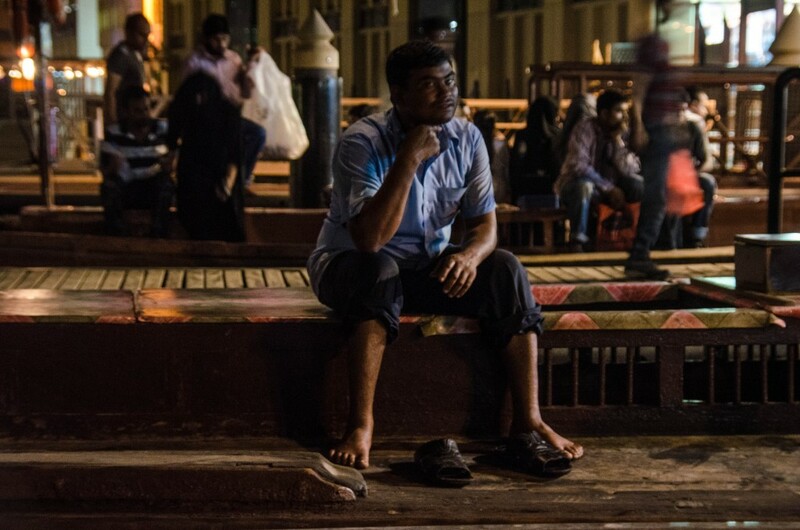 As always, click on these images to learn these subjects’ stories. From Istanbul I headed south – quite a long way south, as I went to South Africa. More of that next time. There was a time when I wasn’t particularly interested in visiting Germany. That country just didn’t really appeal to me. I have a list of places I want to see, things I want to experience – Petra in Jordan, the Sahara desert, New Orleans, for example. So I was always quite focused on getting to those places, and Germany just seemed a bit, well, easy. Familiar. It’s often said how similar the Germans are to the British, and most of them speak good English, so it seemed like a soft option when there are more challenging, yet rewarding, destinations. Then, a few years ago, I went to Berlin. Loved it. Friendly place, interesting architecture, so much history, and everything is so clean and efficient. Gotta love that. Since then I’ve returned a few times, exploring different parts of the country. Happily, I got to include a new slice of Germany on the SOTM World Tour – the charming town of Augsburg. The shot above is an art installation found in the town’s backstreets. I was there because Adventurous Kate’s good friends Josh and Daniel, who had previously got married, were having a little party to celebrate the occasion now that members of both their families had managed to come over to Germany at the same time. I was determined to make friends with them both – if you make friends with a girl’s best gays, then you’re in with the girl, I believe. Happily both chaps turned out to be quite charming and very welcoming to me. Best of all, I got two cracking SOTMs out of them, with very interesting stories. 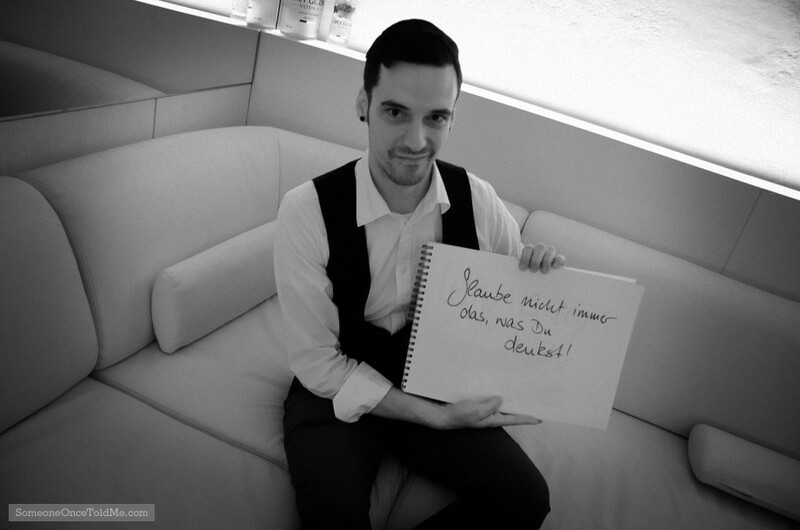 Here’s Josh’s – as ever, click on his image to learn more about his SOTM story. Incidentally, while we made our way to Augsburg on the train, I took probably my favourite photo of Kate so far. 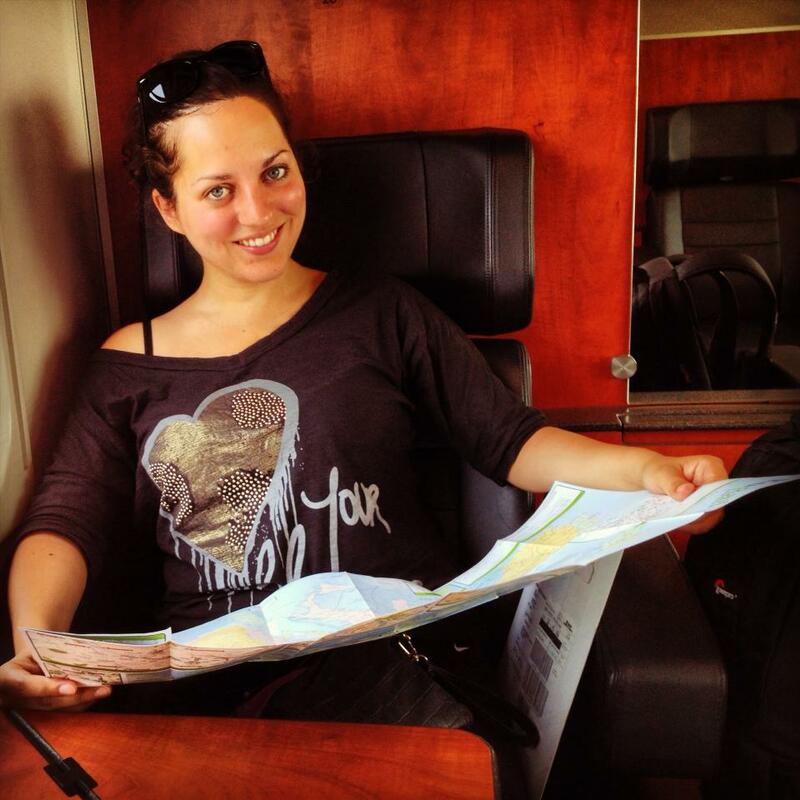 It captures her perfectly – wearing her “Love Your Blog” top, while on a train to a new destination, and with a map in hand. That’s my girl. After that brief stop in Augsburg, we hopped on a train to Zug in deepest Switzerland, where my cousin Adriana awaited us. She lived next door me when we were kids in Malta, and we spent many hours playing together. She used to insist we would get married one day, when were were about seven or eight I think, and I was too scared to say no. However, she is now betrothed to the smashing Oliver and lives in Zug with him and their two gorgeous children. They all welcomed us with open arms, and Adriana continued the fine tradition of extensive Maltese hospitality by giving us a place to stay, doing our laundry, feeding us to the gills, and even taking us out to a fancy restaurant (“it’s Friday night, I’m kid-free and I’m in heels,” she said while giving a toast). Now, part of the reason that I wanted to go around the world was to achieve a life-long dream. When I was a little boy in Malta I dreamed of exploring the world. I’d look at places in encyclopaedias – I recall looking in wonder at the Empire State building in a Guinness Book of Records back when it was the world’s tallest building – and imagine what it’d be like to actually go there. 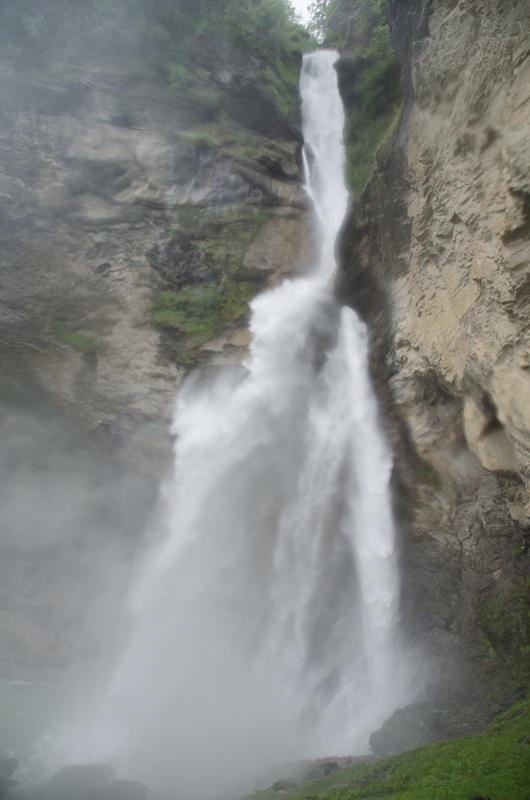 Similarly, ever since I fell utterly in love with the Sherlock Holmes stories a few years ago, the Reichenbach Falls has been high on my list of places to visit. It’s the place where Sherlock fell to his death while locked in a battle with Professor Moriarty – initially, at least, until public pressure forced Arthur Conan Doyle to resurrect Holmes from his watery grave. So it was a real thrill to learn that they were but a couple of trains away from Zug. Kate and I borrowed some waterproof jackets from Adriana and Ollie and off we went. I wasn’t disappointed by what we found that magical day. The falls are gorgeous, not the biggest but very picturesque and the gloomy forecast held off just long enough for us to look around without getting too drenched. The biggest soaking we got was from the falls themselves, as the spray near the bottom flies around in sheets and drenched both us and our cameras. Here’s a shot of the falls from further away. While we were at the Falls, this happened. And I bloody loved it. 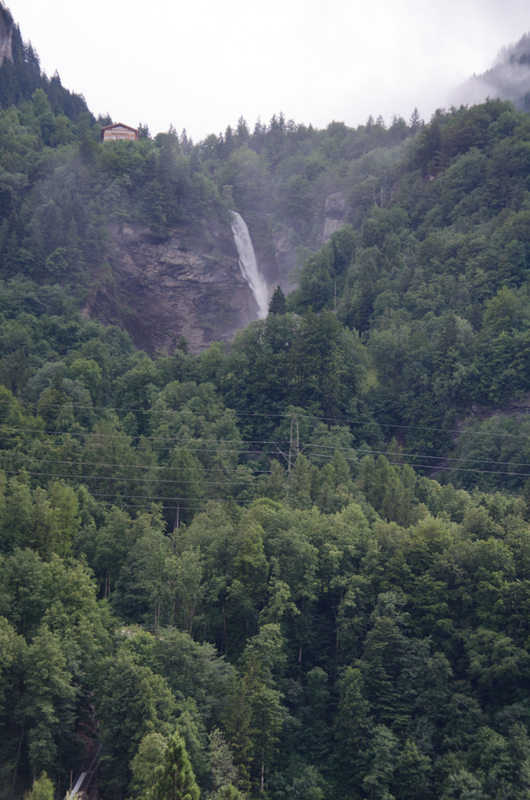 The Falls themselves are just south of the lovely town of Meiringen, where Holmes and Watson stayed in a hotel – which is still there. I’m pretty sure that after the story dealing with this incident, called The Final Problem, was published, all subsequent mayors of the town, owners of that hotel and the town’s shopkeepers too, have thanked Conan Doyle profusely for giving them a permanent attraction for tourists the world over. 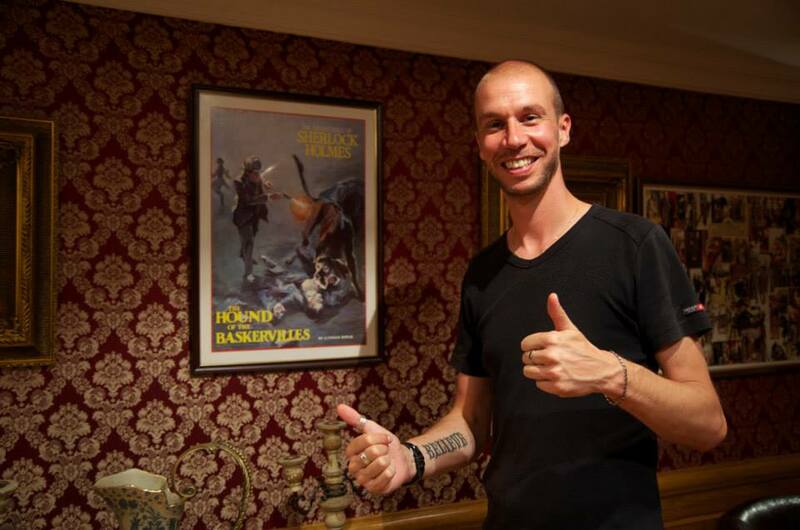 There’s an excellent Sherlock Holmes museum there too, which was a real highlight of the trip. 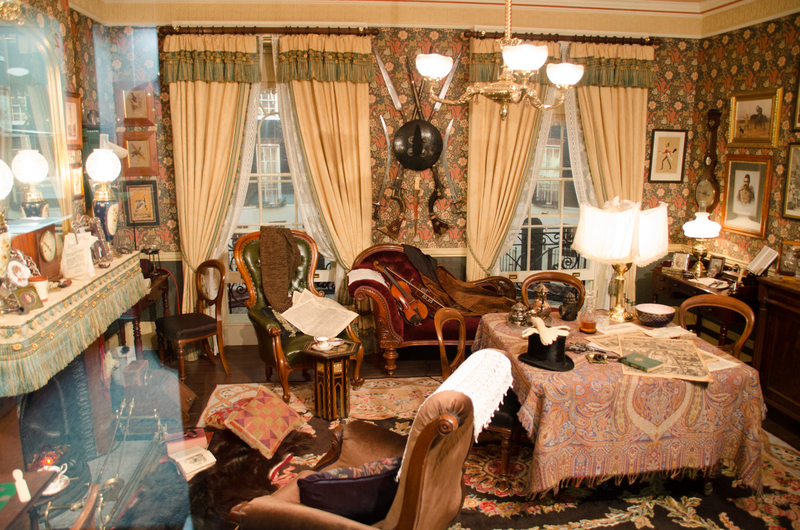 It contains a faithful recreation of the inside of 221b Baker Street, with authentic period furnishings! The level of detail in the museum was breathtaking. In one story, Watson mentions he played rugby for Blackheath in London. 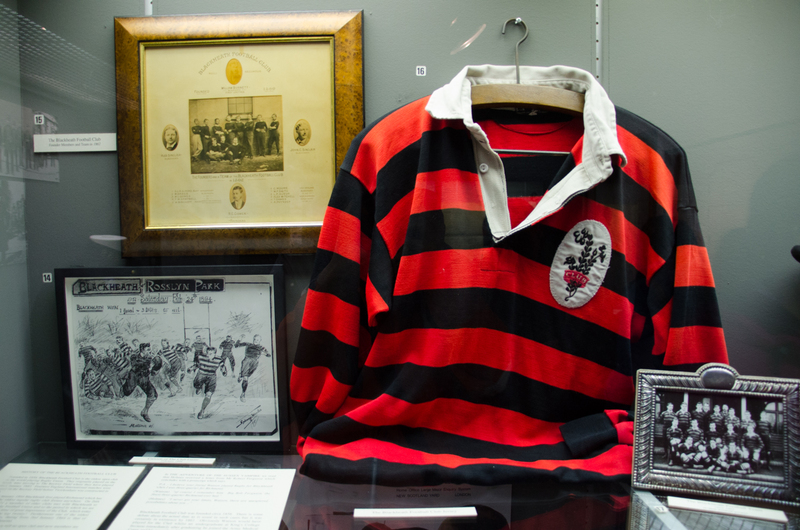 The museum has a top which is the kit he would have used at that time in the club’s history. Very impressive. Here’s a quick fact – Conan Doyle never described Holmes as wearing a deerstalker by its actual name, but he did describe a hat that is like a deerstalker. 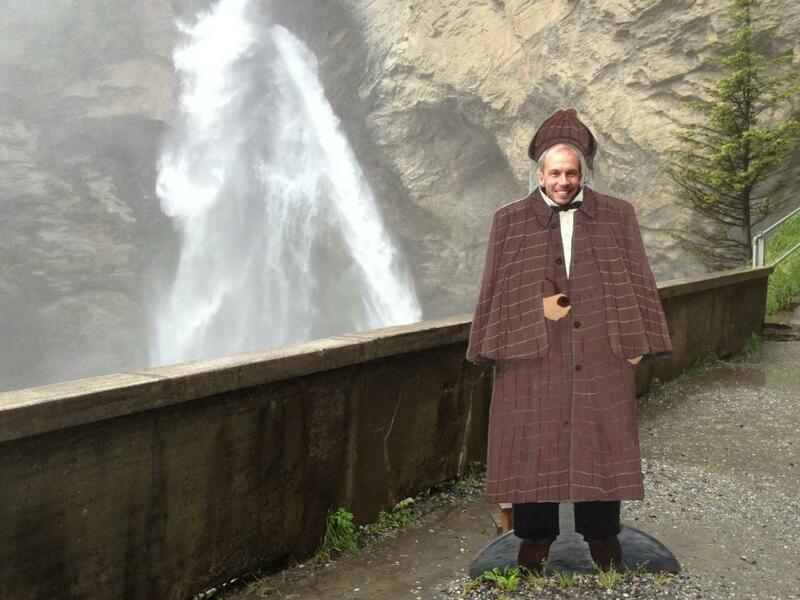 However, Holmes only wore it on the handful of occasions that he left London for the countryside. The majority of the time he wore headgear common to gentlemen in the Victorian era – top hats, etc. But the illustrators of the original Sherlock Holmes novels and short stories chose to depict him most frequently in the deerstalker, and that’s the image which has endured. 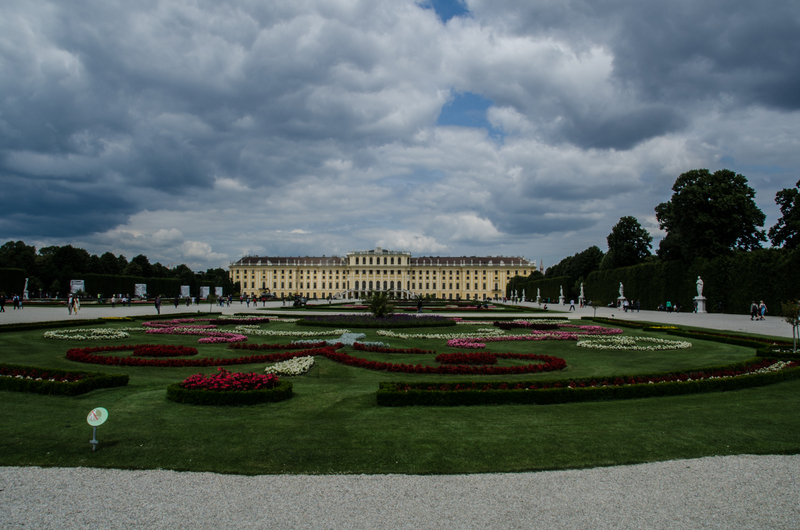 After bidding the Bishop family a fond and reluctant farewell, and laden down with most of the contents of Adriana’s fridge, we took trains to Vienna. This was my first time there, and I was very impressed. It’s apparently been frequently voted one of the best, if not the best, city in the world to live in and I’m not surprised. It has a bohemian vibe and its architecture is stunning. I couldn’t stop taking pictures of its grandeur, which casually pops up all over the city. 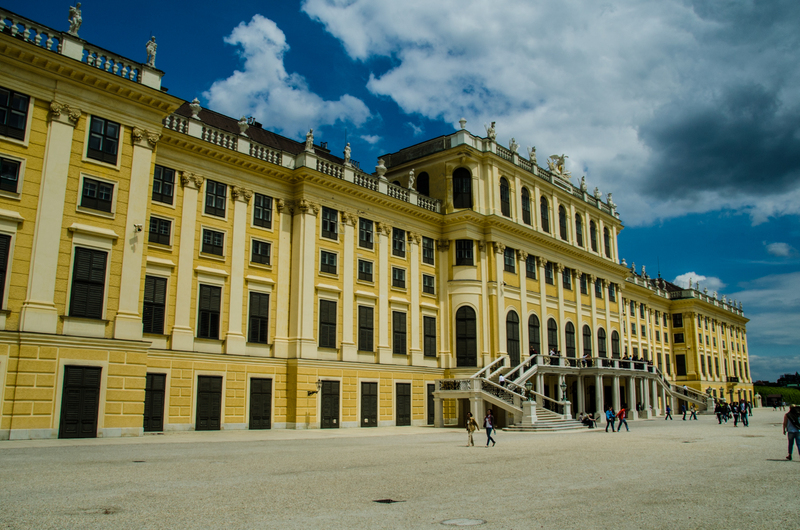 Like the stunning Schonbrunn Palace. 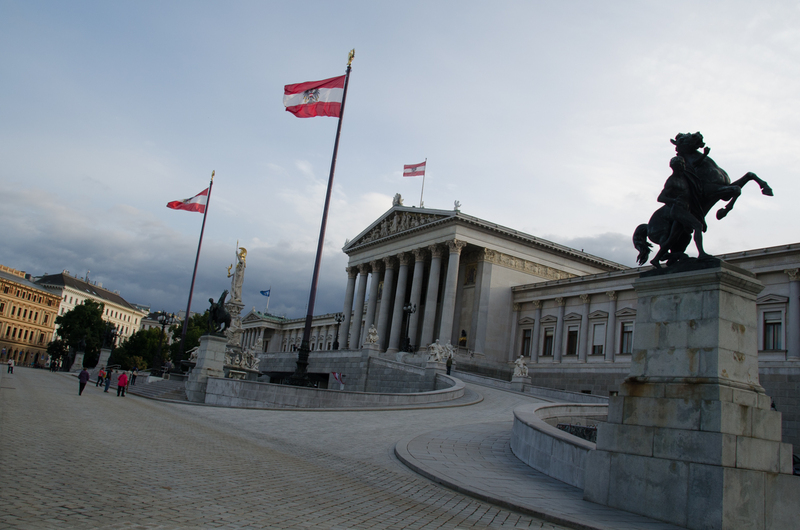 Let’s not forget the Austrian parliament building. 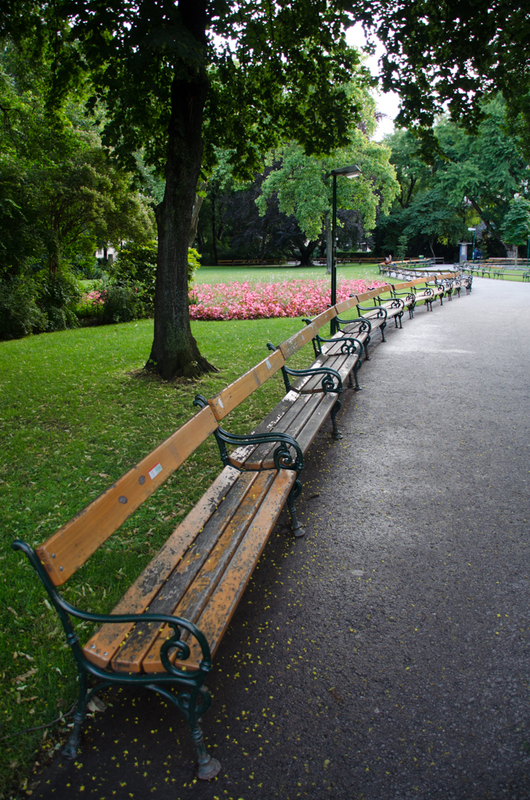 The city’s parks are gorgeous too. 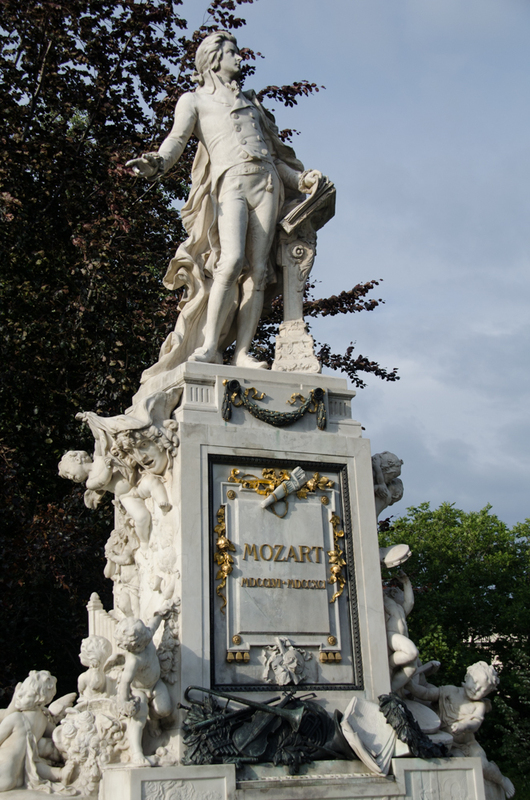 And the city is, of course, famous for Mozart having lived and composed there, among other things. 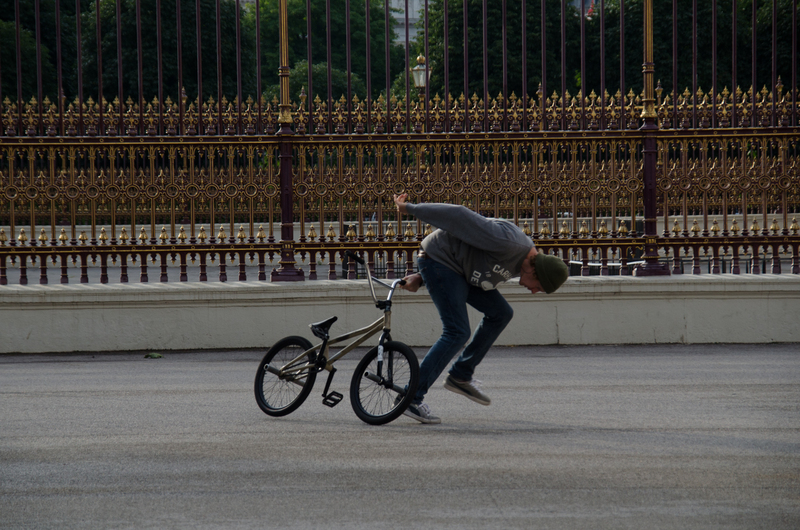 While admiring all the architecture, I spotted this chap busting some BMX moves. I got a few shots of him, this being the last one. 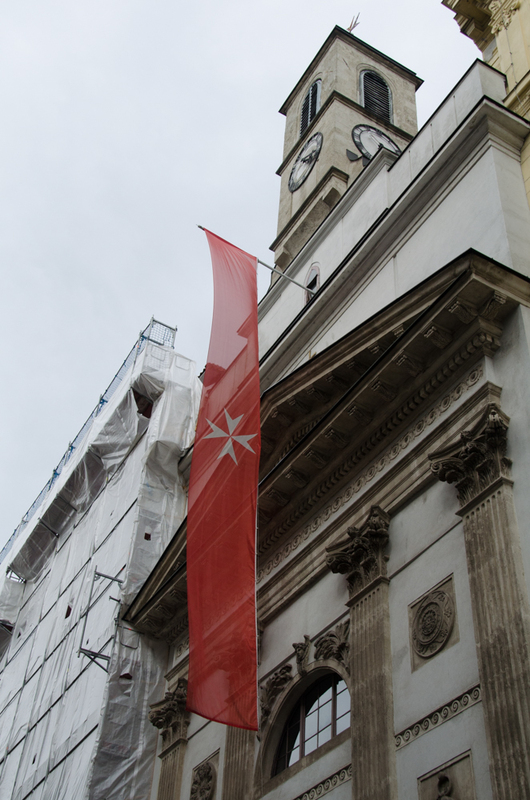 And while in the city centre I spotted this Maltese church, which I didn’t know about and was delighted to stumble across. Of course, I couldn’t leave town without nailing down a little SOTM action, so Kate and I attended a Couchsurfing meet up. 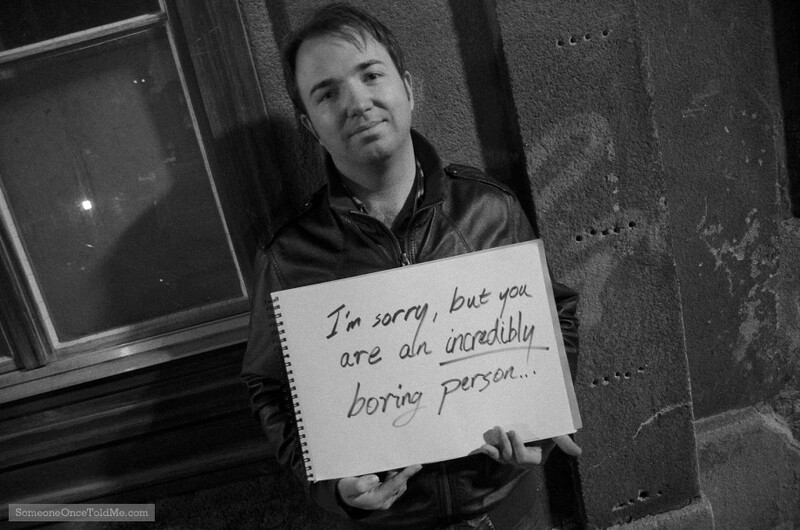 There I met the fascinating Rhys, who is a rocket scientist working in Vienna. His SOTM is one of my all-time favourites. 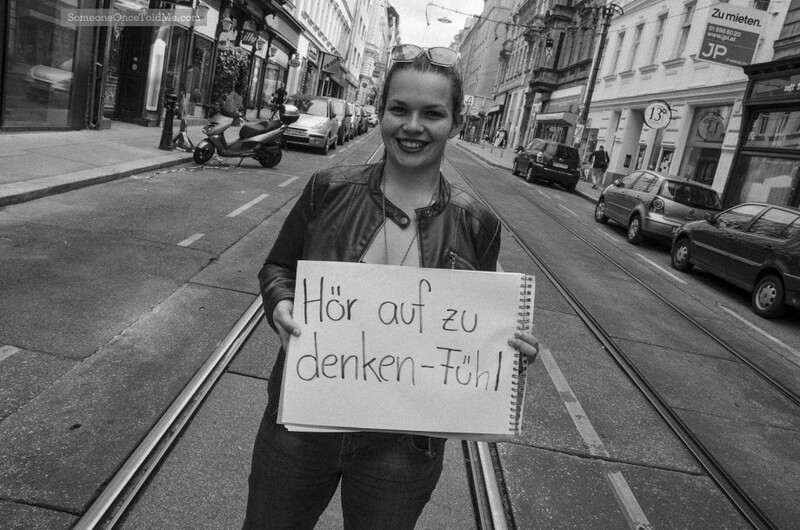 The next day I met Katharina at our hostel, just before we were departing for a flight to Malta. She and I had to dance in and out of the road to dodge the traffic, so as to capture this shot. 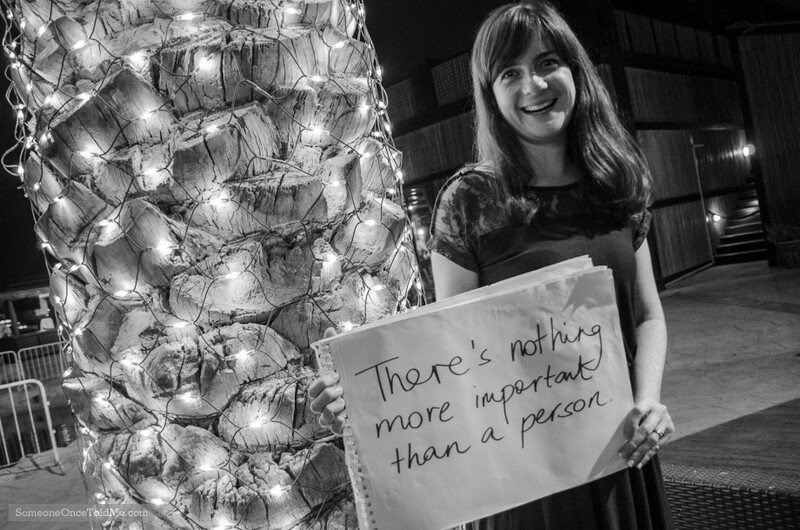 Her story is worth checking out as she says these words had a big influence on her life. I found this SOTM very moving, also. It details the breakdown in Emily’s family’s relationship with her brother, for reasons that apparently baffle them. 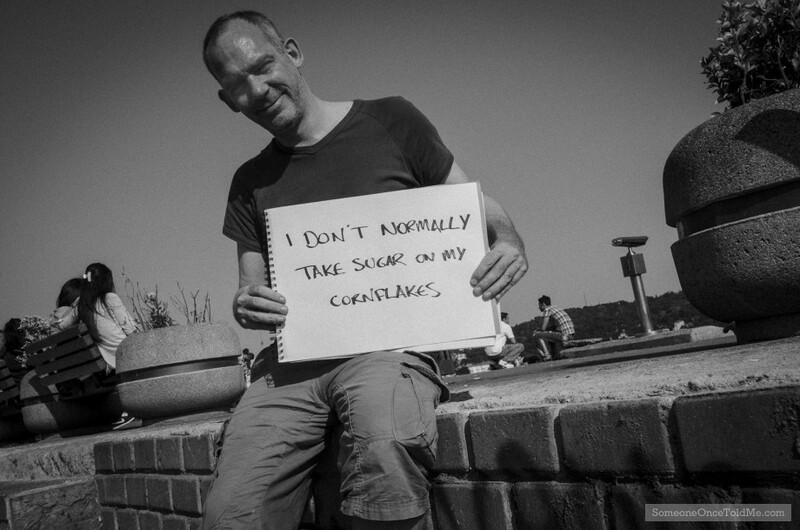 I was, once again, flattered that someone shared a deeply personal story with me, a stranger with a camera and sketchbook. That’s all for this time. Next, it’s off to Malta where Adventurous Kate and I had a Date With Destiny, and later we travelled to the wonderful Istanbul. Paris was the first stop on the Someone Once Told Me World Tour, as any excuse to visit that fair city is a good one in my book. When I got there, I was nervous. I was certainly excited by the prospect of a year’s travel around the globe, no night shifts (apart from the odd overnight flight) spent in the BBC newsroom and the promise of adventure, and not least because I was travelling with my girlfriend, Adventurous Kate. Still, the prospect of hitching so many rides on planes, trains and automobiles, sleeping who-knows-where and worrying about whether I had enough cash for this trip was playing on my mind. So lovely Paris, to stay with my good English friend Marie Claire, was a gentle enough start to proceedings. Once there, I very quickly worked out that street photography would also be playing a part in my journey to find out what people around the world have been told. 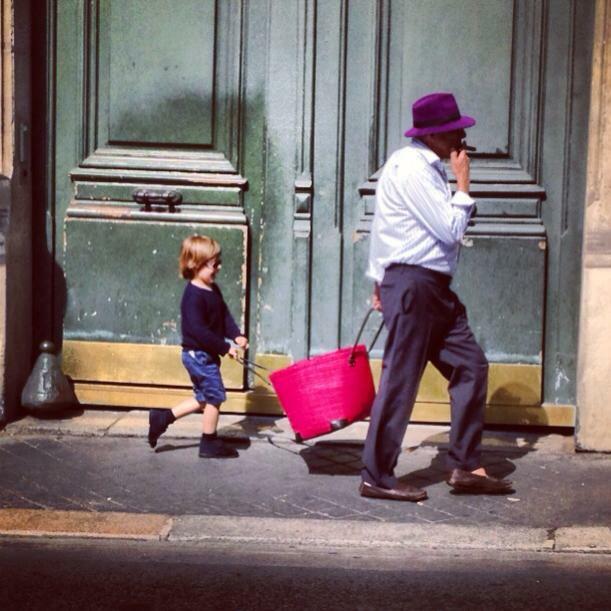 I came out of Marie Claire’s place one day and saw these two characters skipping down the street. Let’s assume he’s a grandfather and that this is his child’s child. I had little time to react so I ran on ahead, pulled out my iPhone and captured them as they passed in front of a large door, the best backdrop in the street really. I later posted the image on Instagram. While in Paris I found my most fruitful SOTM efforts at a charming bar called Cafe Rouge (not the same as the UK chain) in the Marais where Marie Claire’s book club had kindly gathered for my purposes. I proceeded to gather scribbled memoirs in French, English, and also Russian, reflecting the eclectic nature of the Parisian population. Even though it’s not in French, the one you see below was a particular favourite from that happy evening, as I love the way this chap held himself. I had wanted to use this greengrocer’s backdrop across the street from the moment I saw it. Those sort of shops in Paris always make me think of the film Amelie. 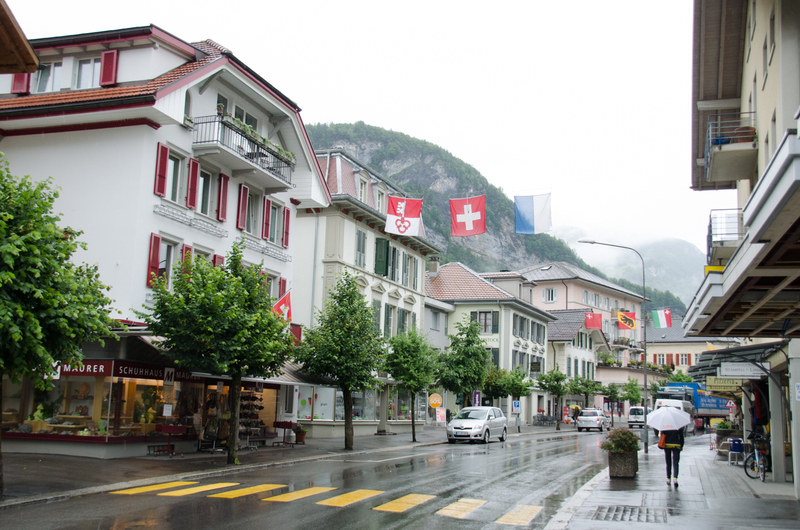 Then Kate and I headed to Geneva as I had lined up an interview on World Radio Switzerland. The journey down was fraught with problems as all the fast trains were booked, meaning we had to take one that chugged along for about 5 hours. And there was not a drop to drink or a crumb to munch on during that whole time, amazingly. I was interviewed the next day by the charming Jo Fahy at WRS, a chat which you can listen to here, and managed to bag her SOTM too. Our next stop was Bologna, Italy, where Kate and I had both been invited to participate in the BlogVille project, run by the Emilia Romagna tourism board. If you haven’t been to that region of Italy then you really should go. The food, architecture, scenery and general ambiance are all very sweet indeed. While there I was lucky enough to meet Fabio Lamborghini, whose late uncle Ferruccio had created that brand of supercars, having already put his rather gifted hand to many engineering products, including a range of tractors. 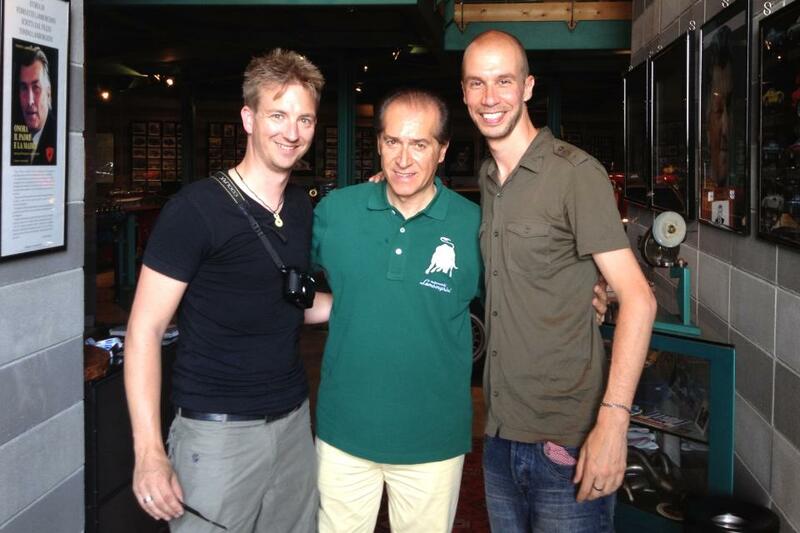 Fabio is now director of the Lamborghini family’s museum. 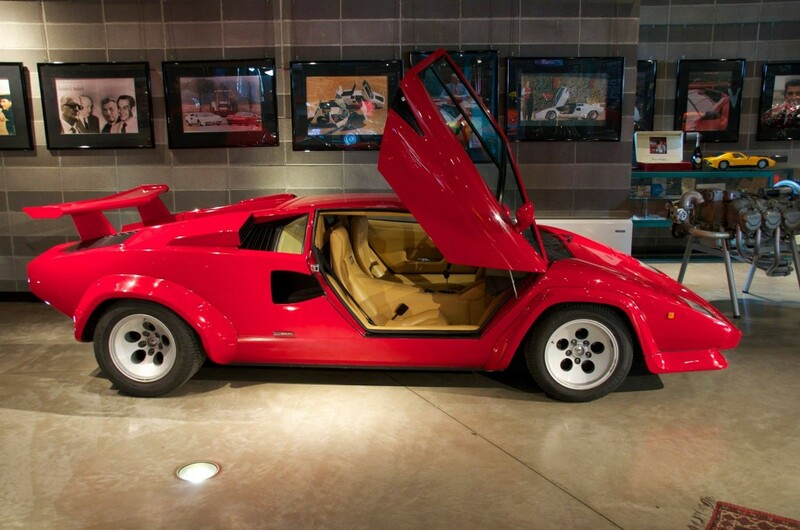 This is a Countach, one of the gorgeous cars in that place, which looked rather like the inside of my head when I was 8. Fabio is a real gent, quite a character and he was kind enough to take part in SOTM, passing on a bit of advice from his uncle, who apparently told Fabio not to spend too much money if he wanted to keep being wealthy. There was a delicious irony about Ferruccio, whose cars are affordable only by millionaires, advising members of his own family not to part with their cash, of course. You can see me below on the right, with the man himself in the middle and Melvin Boecher of Traveldudes. 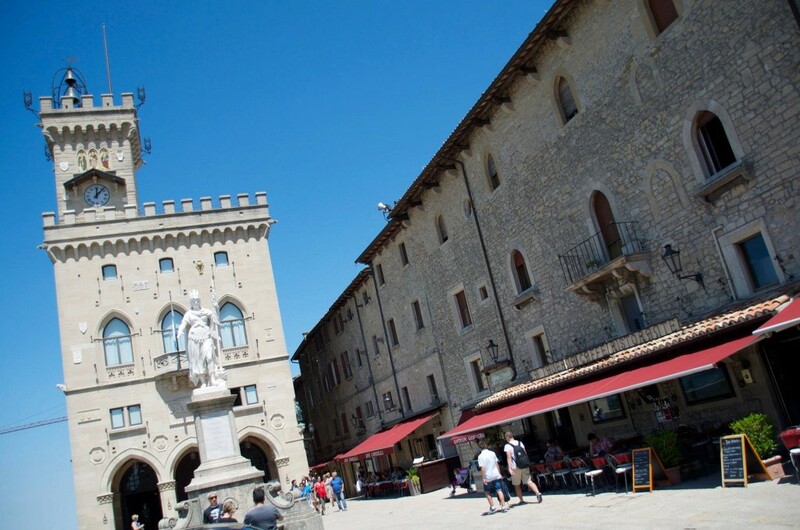 And it was while we were in Bologna that we took a journey into nearby San Marino, which claims to be the world’s oldest and smallest republic. Our excellent BlogVille host Nicholas, a dashing and resourceful chap, knew the goalkeeper for the San Marino football team, who are a brave bunch and no mistake. With a population of some 31,000 it’s a wonder they can put together a squad at all, and they regularly suffer some heavy defeats. Aldo Simoncini was in goal when Germany beat San Marino 13-0 and he was between the sticks again when England rattled 8 past them, without reply. Despite all this he was a cheerful chap and chose a SOTM quote tweeted to him regarding his performance in a 4-0 defeat by Italy. By all accounts the score should have been much higher and Aldo was widely praised for keeping the score down on that occasion. After that, Kate and I headed deeper into mainland Europe, in search of more SOTMs. More of all this next time. One of my SOTMs from New York. Next time, that sketchbook could belong to you. MY plans for the SOTM World Tour are continuing to develop nicely ahead of my departure in early June. I’m still getting offers of help, interest and accommodation. The latest is from an old friend in Brunei, who’s offered me a place to stay, access to lots of people in that country – where there is apparently a thriving artistic culture – and excitingly, possibly the loan of a 24-year-old Land Rover! I love old cars, so this interests me greatly. However, I’m still looking for organisations and individuals to form partnerships with. That’s why, for the first time ever in SOTM’s history, I’m offering a form of advertising space in the guise of my sketchbooks, specifically for the duration of the world tour. I aim to take at least 1,000 pictures during my year’s travel, and would like to make available sponsorship of the many sketchbooks that I’ll be using in that time. Quite simply, I won’t ever be without one during the trip, and I’ll be using at least 1,000 of their pages, of course. I believe that doing this would form a mutually beneficial partnership between SOTM and the sponsors, because they would get plenty of exposure and the world tour would get even more support. There are several ways in which a sponsor can benefit from this proposal – I would make regular mention here on SOTMario about how the sketchbook used for particular images was supplied by the sponsor, for example. Also a logo could be placed on some sketchbook pages. And I’d give the sponsor a mention on various social media too, at times when a sketchbook features in one of my regular posts. This would benefit either a business/brand/company, or an individual wishing to promote their own website/talent. Similarly, I’d post a mention of “Sketchbook sponsored by……” plus a sponsor link on each of the SOTMs that I take during the period of their sponsorship. This would mean exposure in 23 different countries at least, as that is the number of nations I’ll be visiting and I’m working towards media exposure in each. Also, I could visit the offices of any company that sponsors me, prior to my departure, take SOTMs of its staff and do a specific blog post on it. As for any individuals, they’d also be featured on SOTM, interviewed on SOTMario and given a choice of gift from the SOTM shop. This would suit all sorts of people – web designers, photographers, musicians, artists, freelance writers, anyone with something to promote. Finally, I’m working towards publishing a book and holding an exhibition upon my return in summer 2014, and the sponsor would be featured prominently at those times too. I’m also having a leaving party on May 29 in London and sponsors would be showcased at that event. If you’ve a particular talent then you could even perform on the night! I’m happy to discuss costs with anyone interested in becoming a sponsor of the SOTM sketchbooks. I have two prices in mind – one set fee for 6 months, another for the full year, which offers a discount. Otherwise, if there are any individuals who’d like to sponsor one or more of the 12 months that I’d be away, then I will break down the costs into small, affordable chunks that way, at a per-monthly rate. If you’re interested you can contact me on Twitter, Facebook or you can email me via mario [at] sotmario [dot] com. Incidentally, below is an updated list of the places I’ll be visiting, in a rough order. Screw It. Let's Do It! Is There Any Room Left On The Plane For Me?